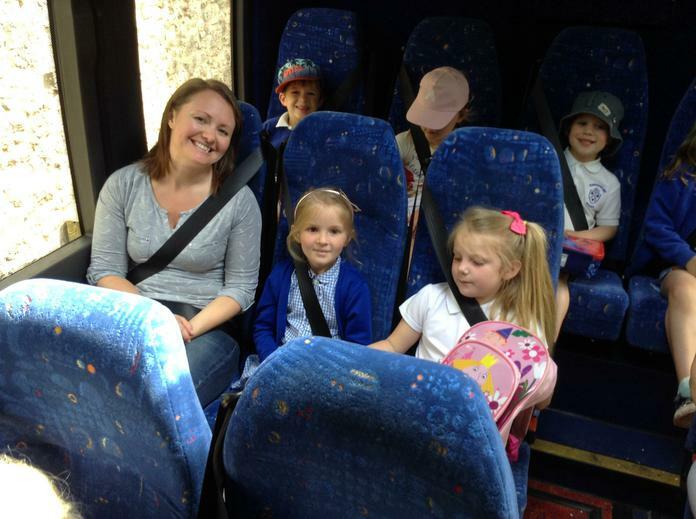 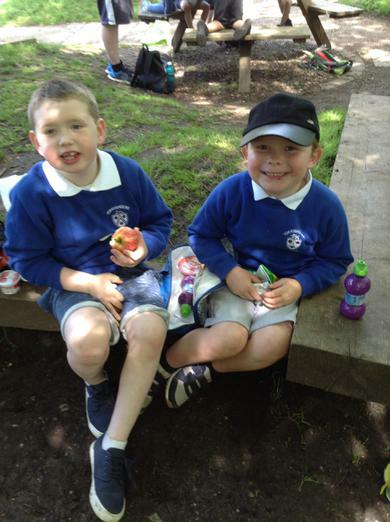 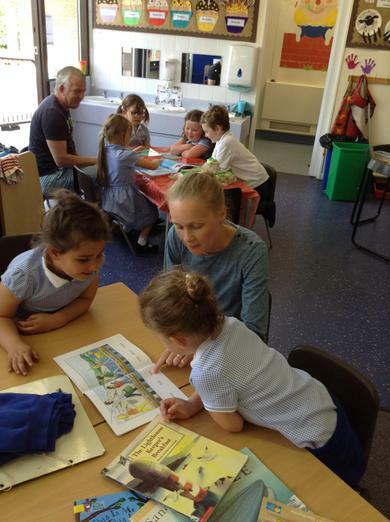 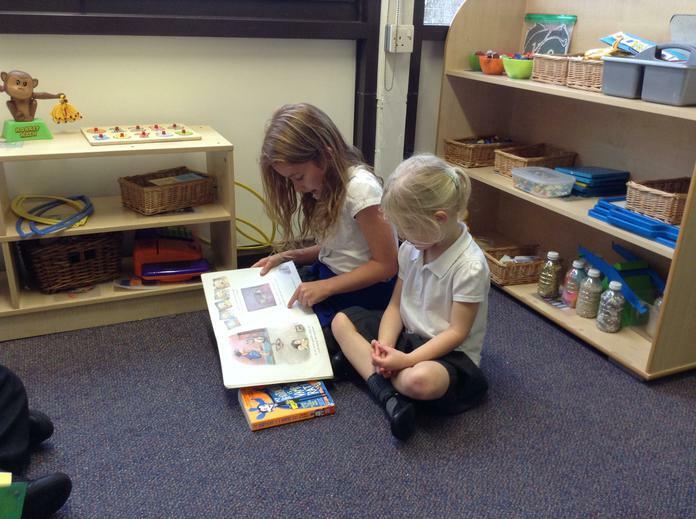 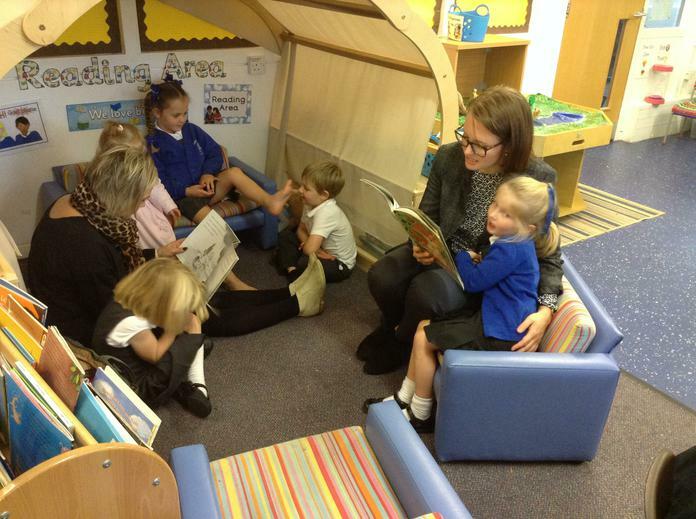 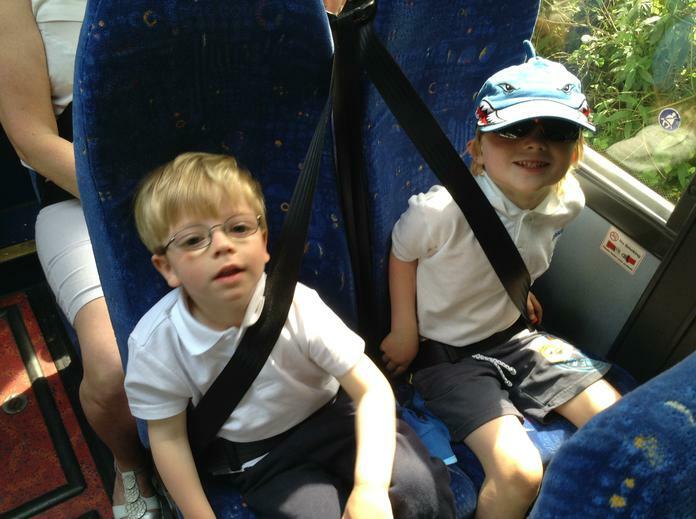 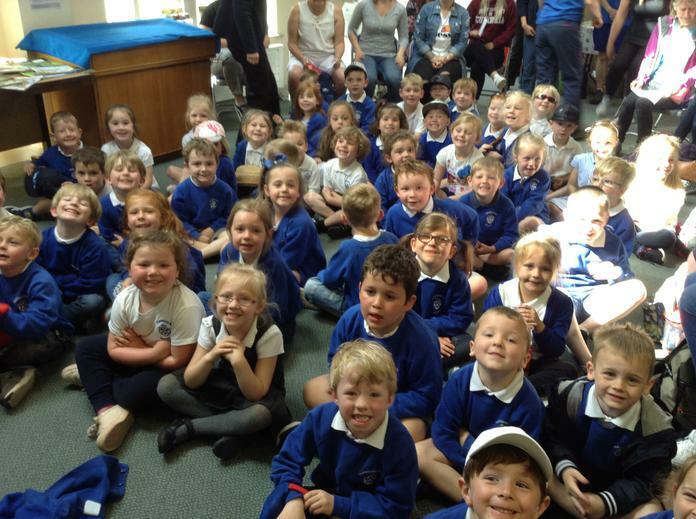 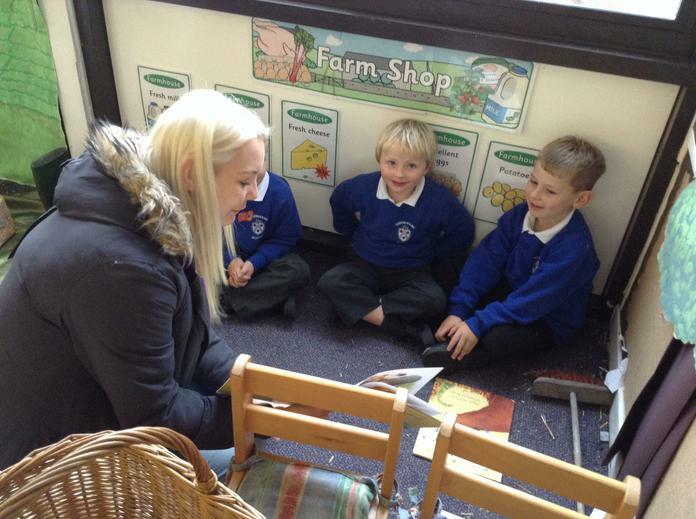 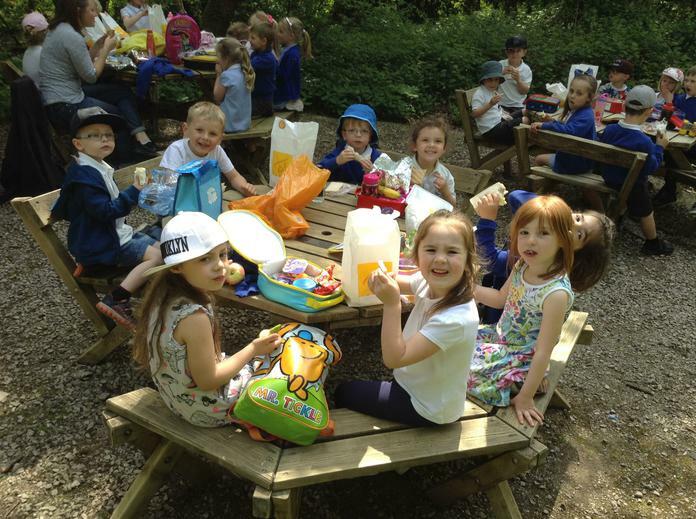 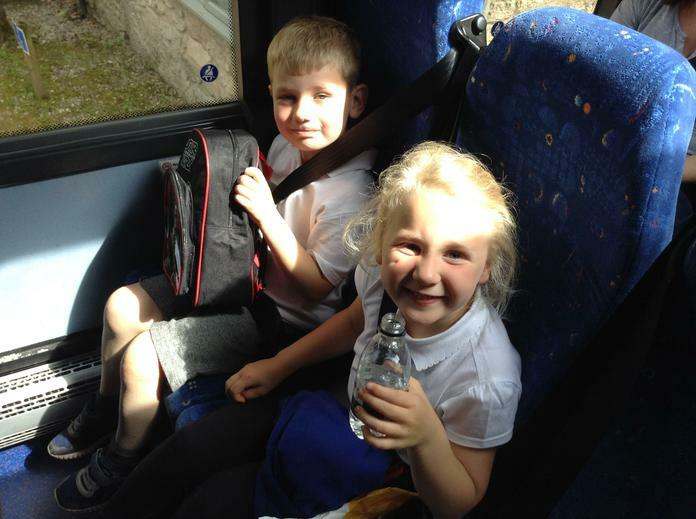 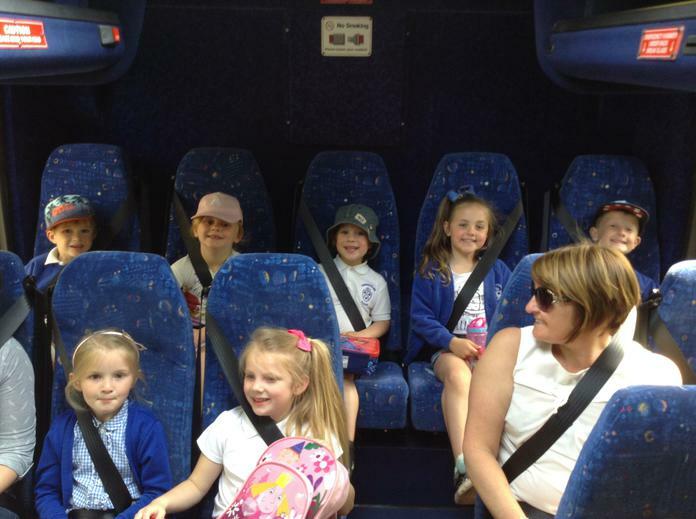 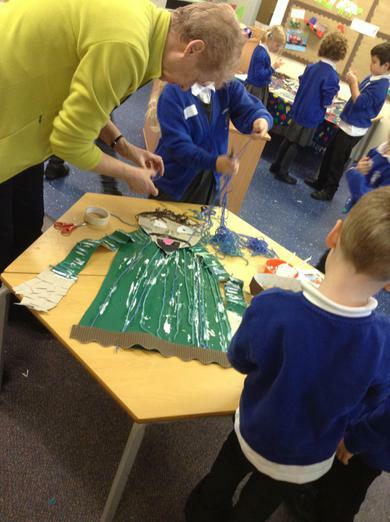 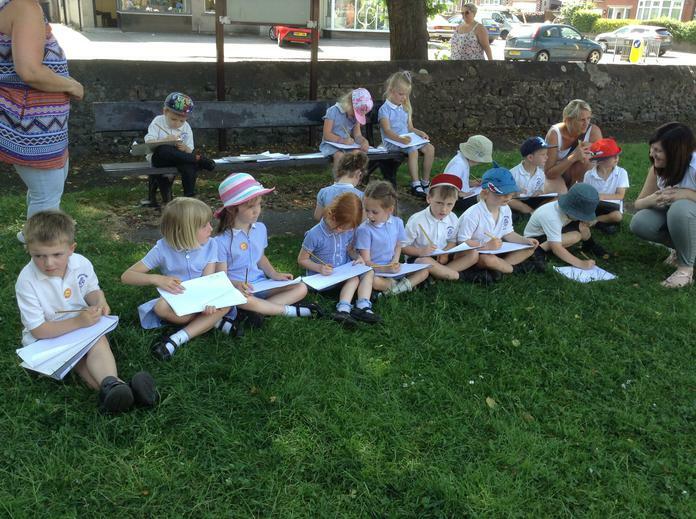 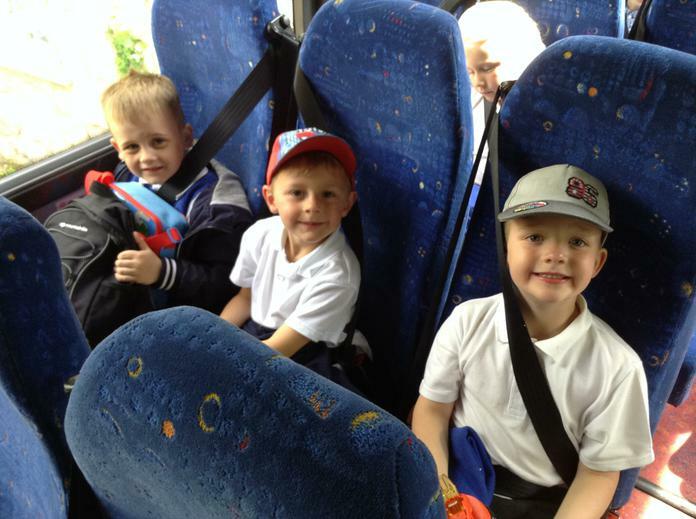 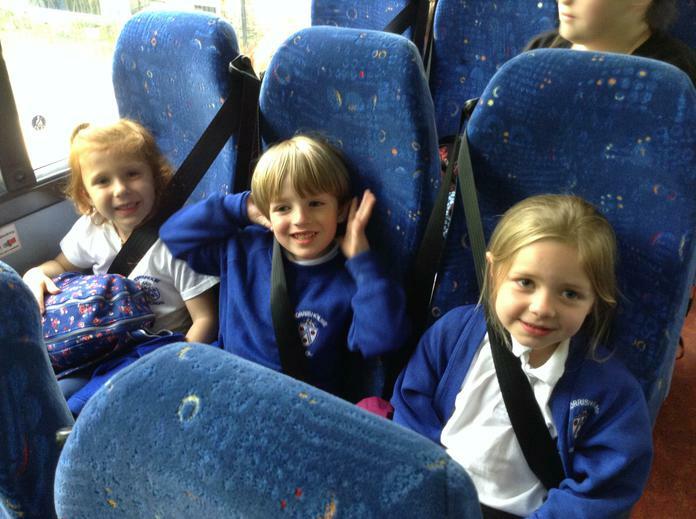 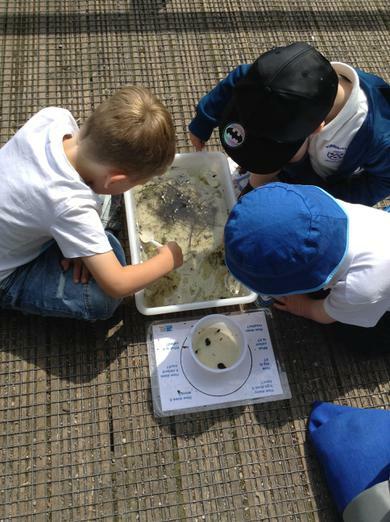 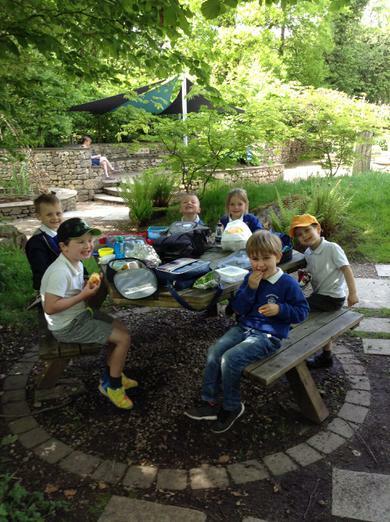 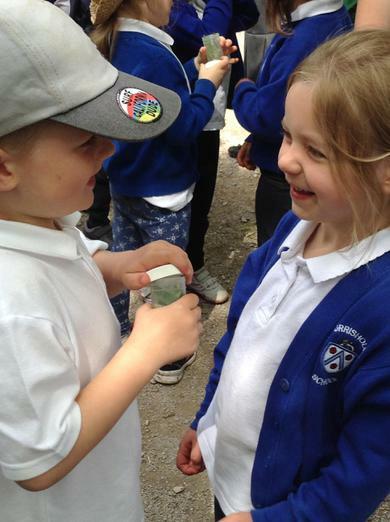 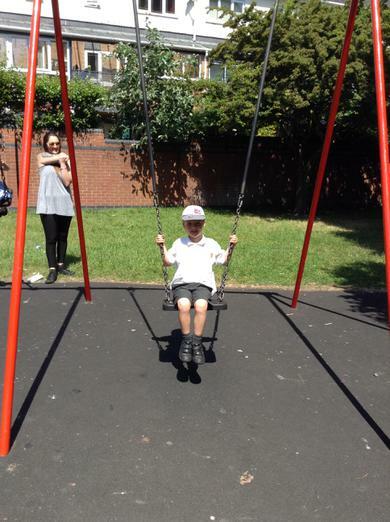 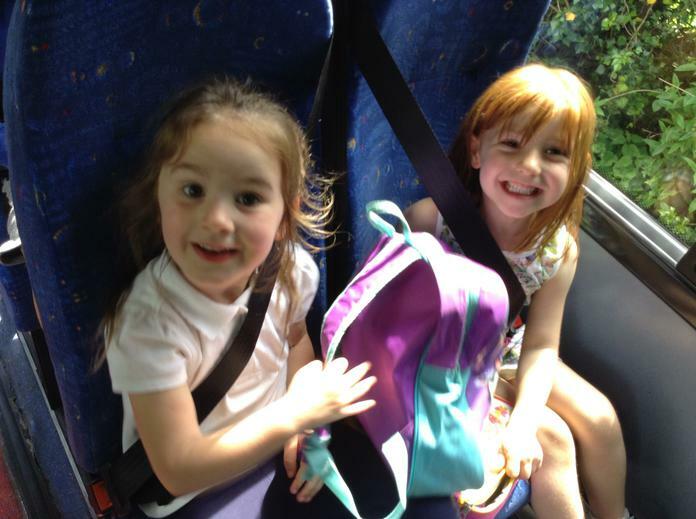 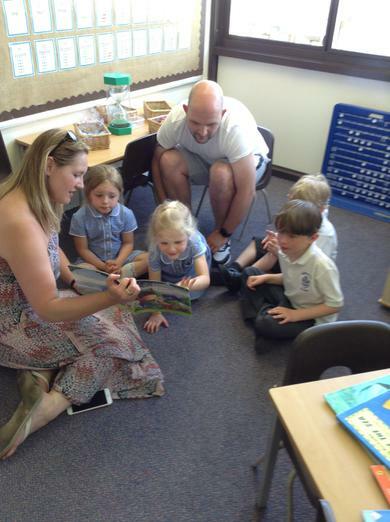 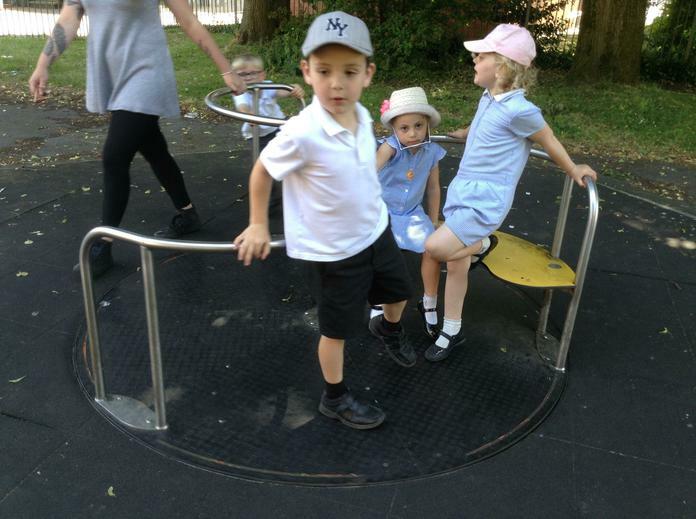 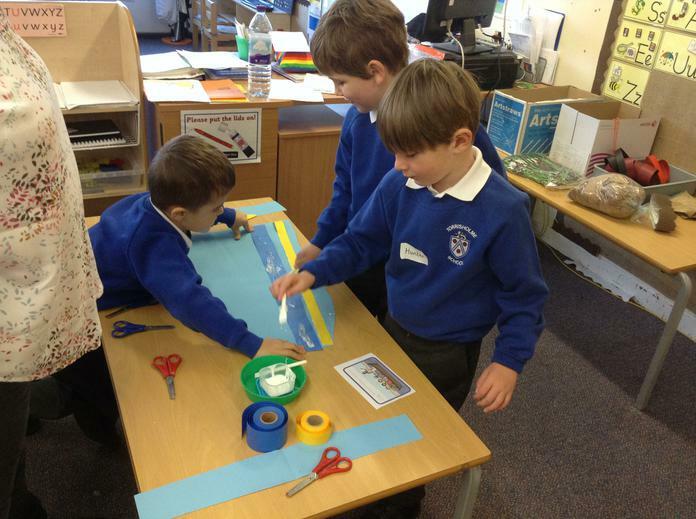 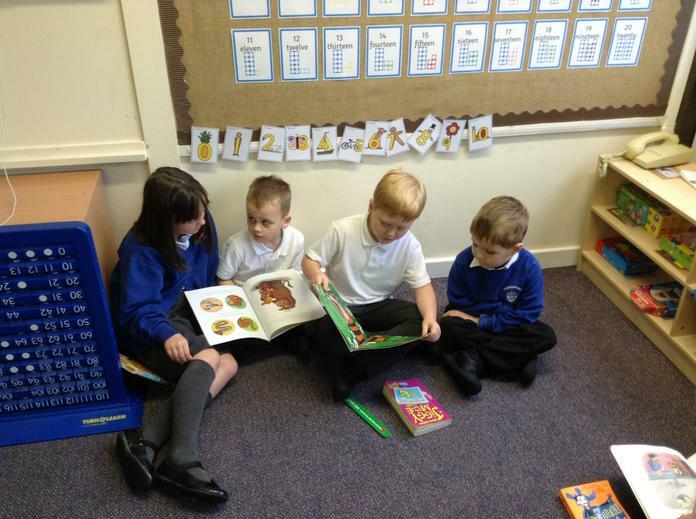 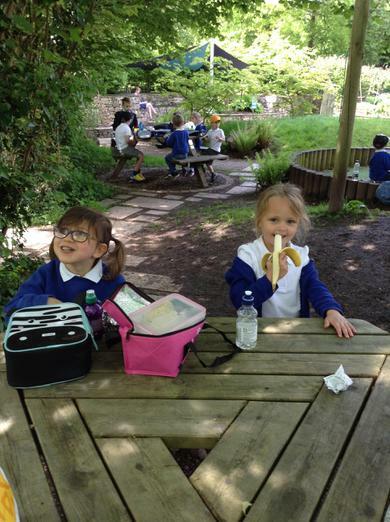 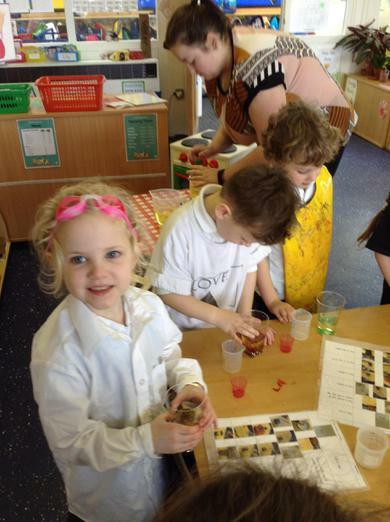 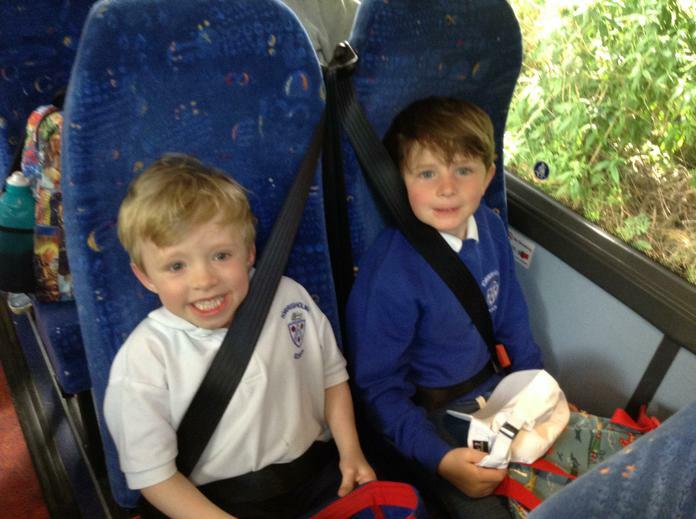 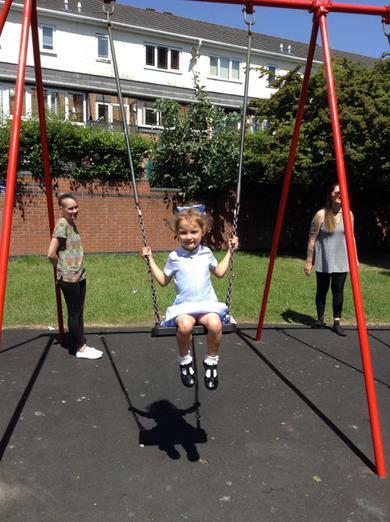 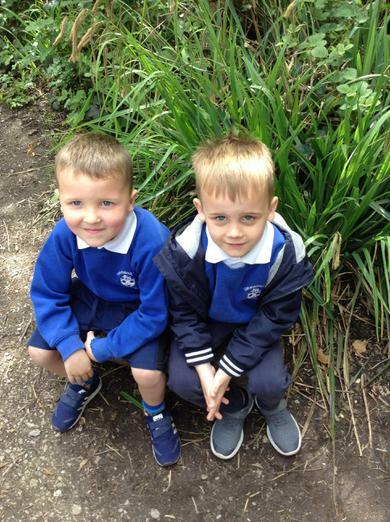 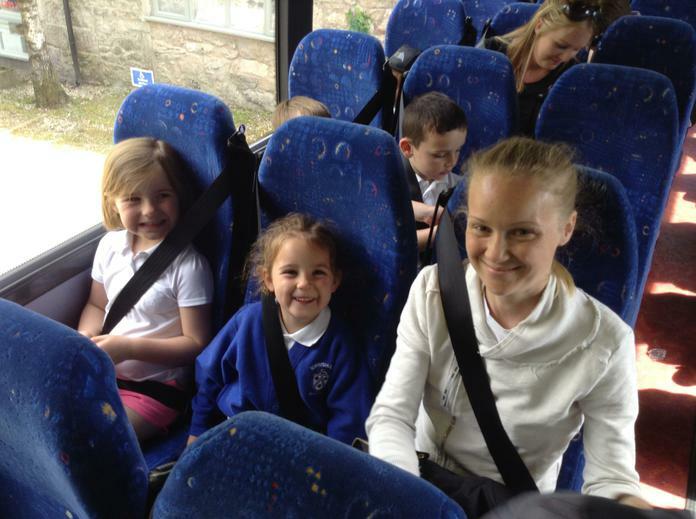 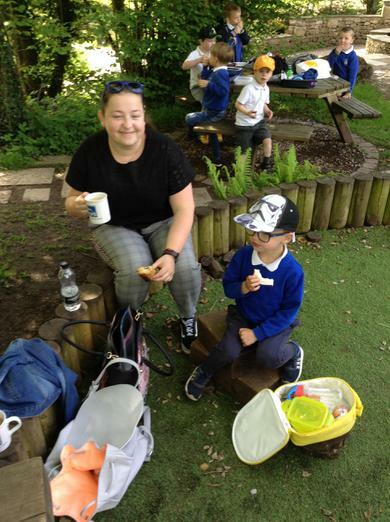 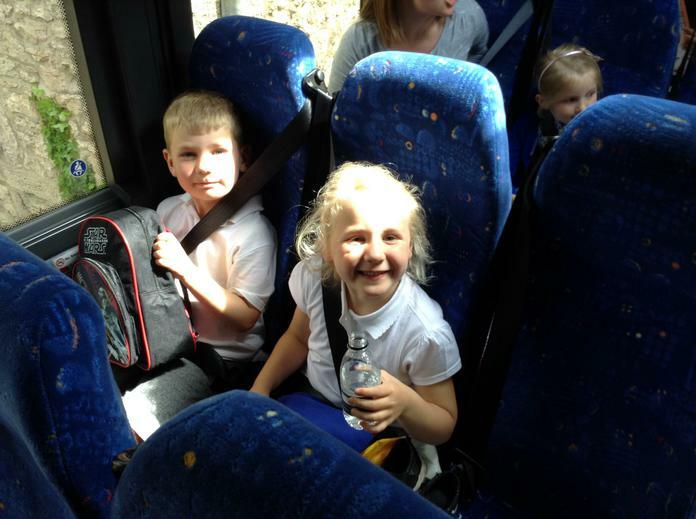 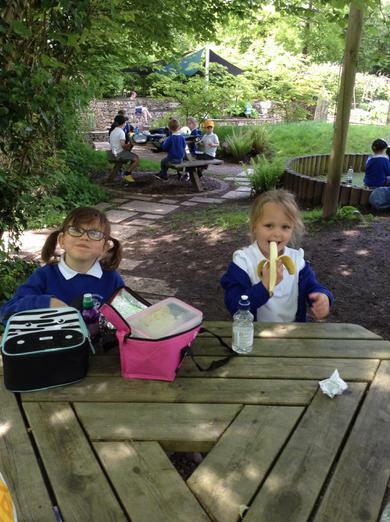 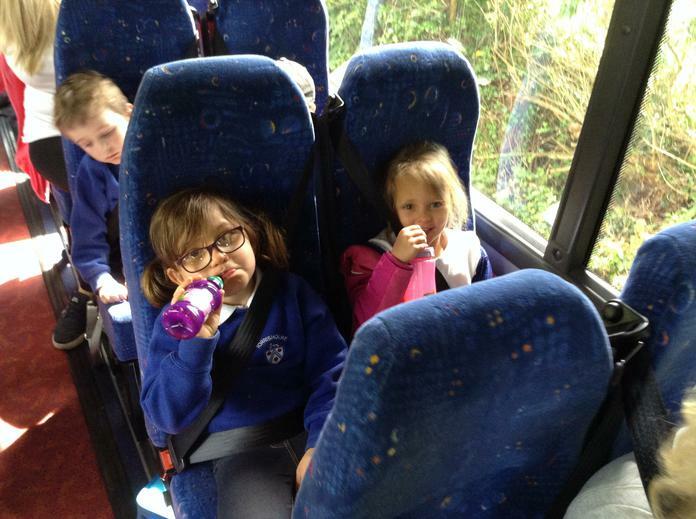 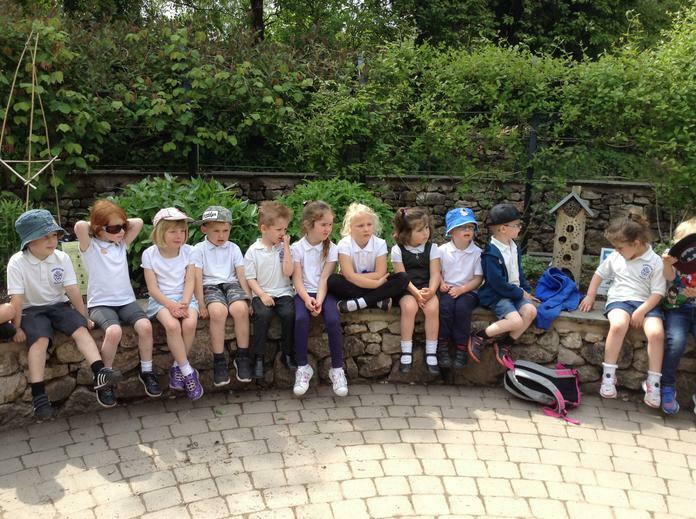 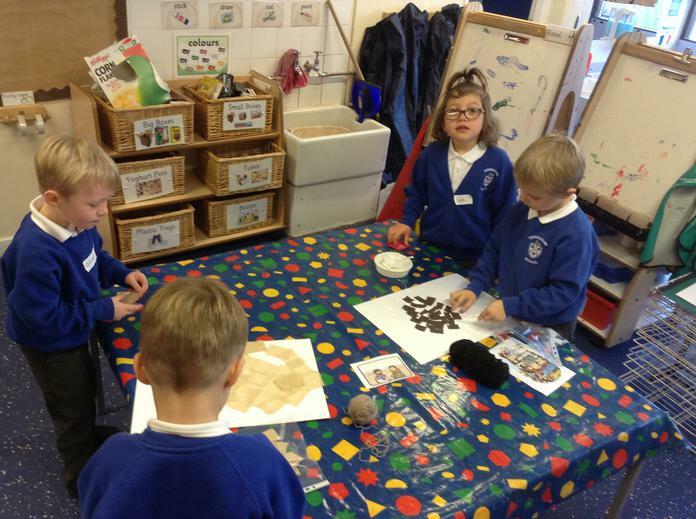 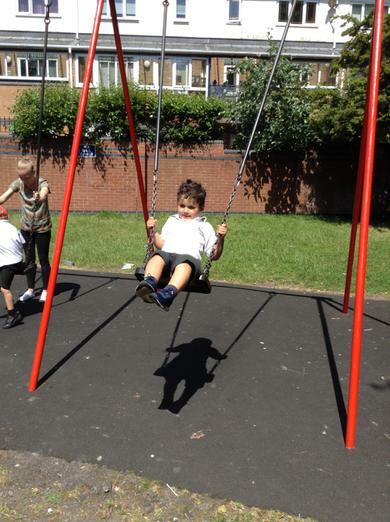 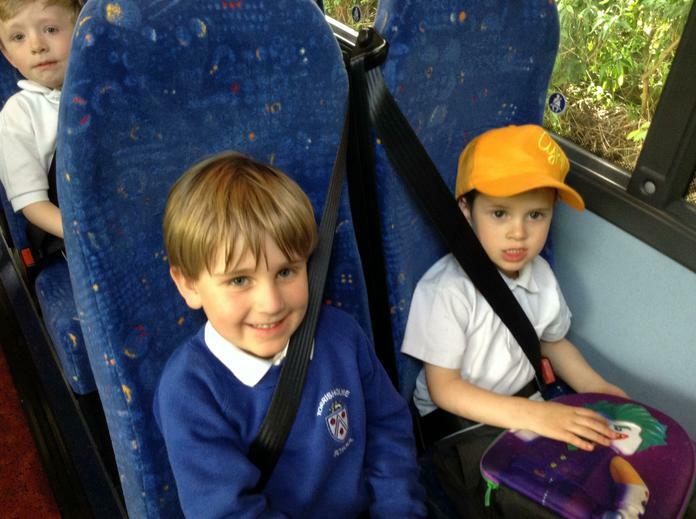 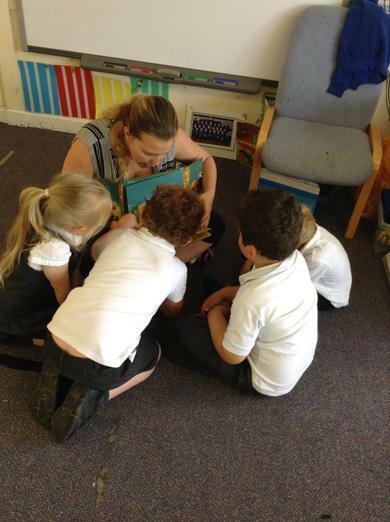 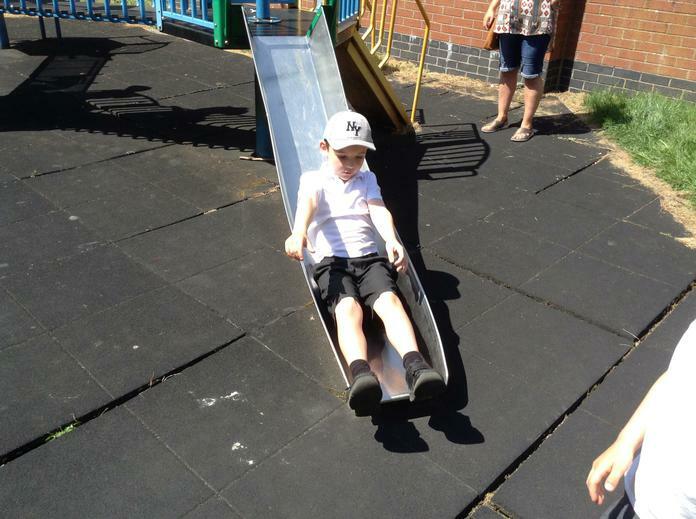 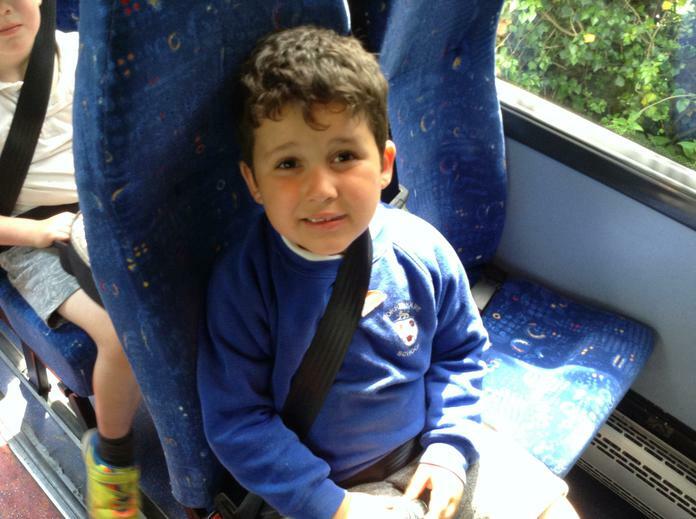 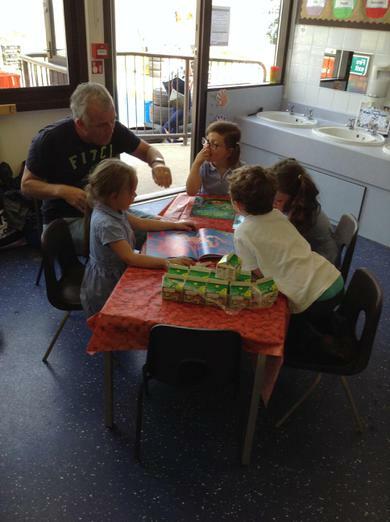 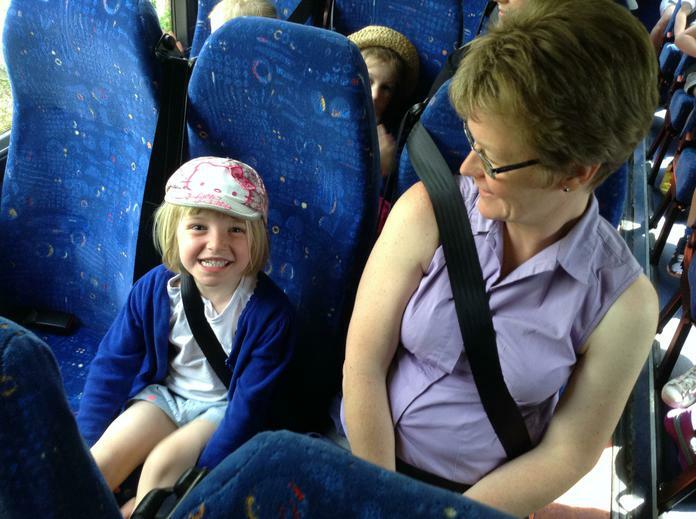 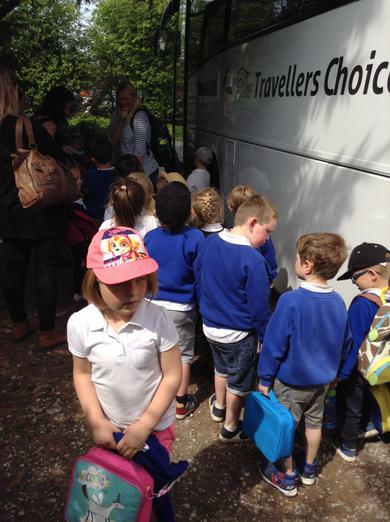 We have two Reception classes that work very closely together. 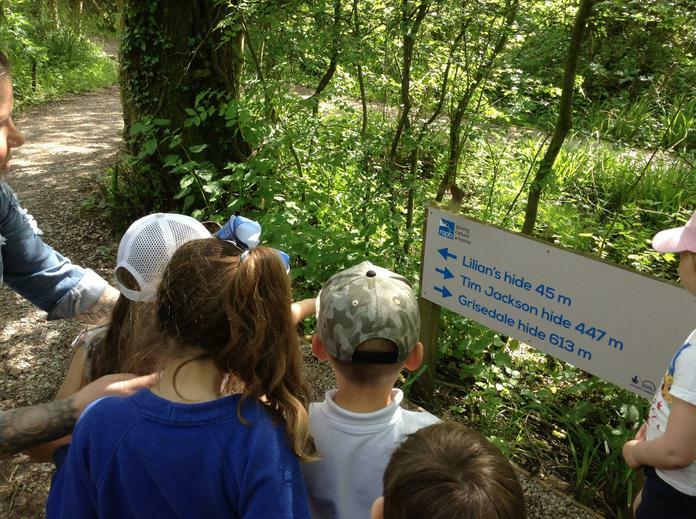 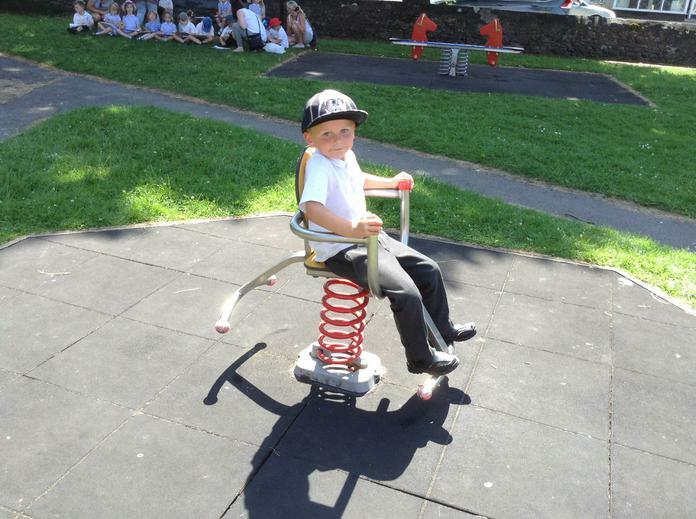 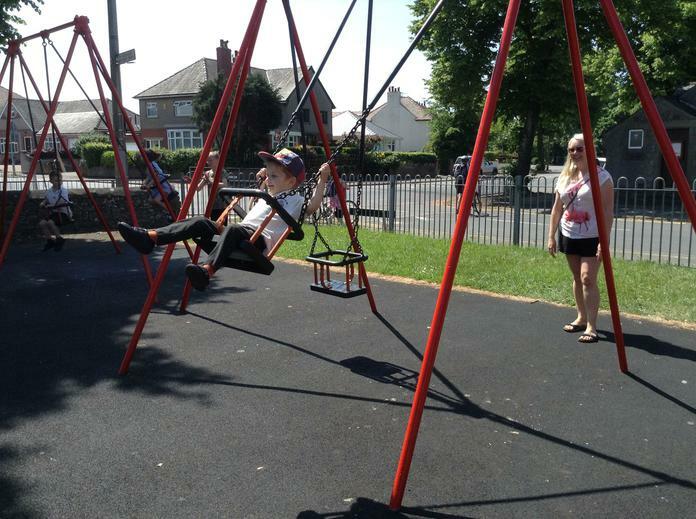 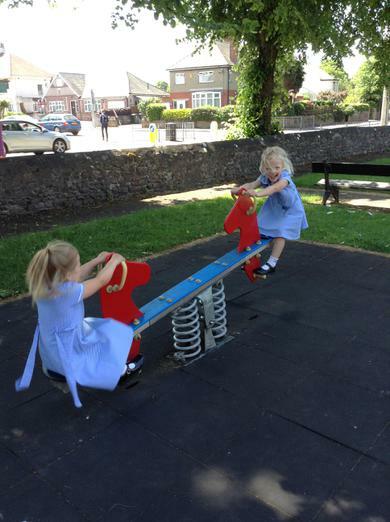 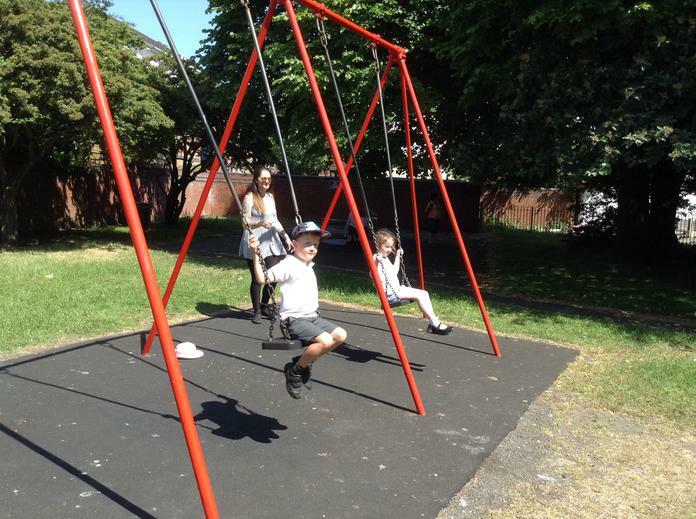 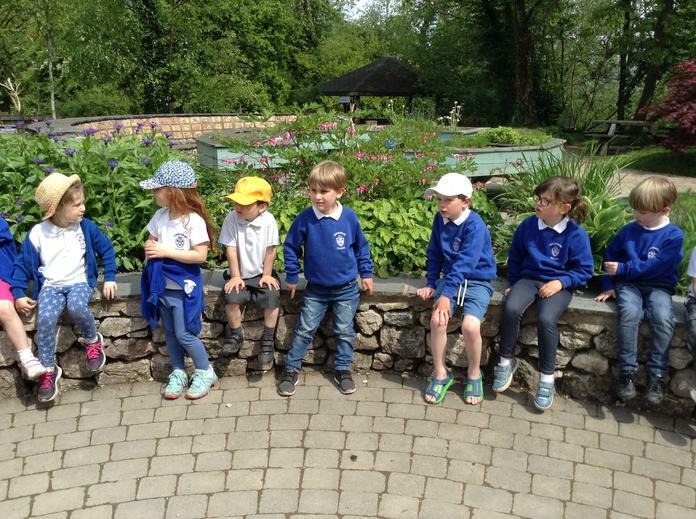 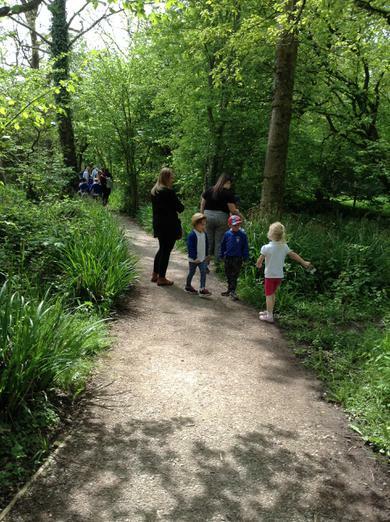 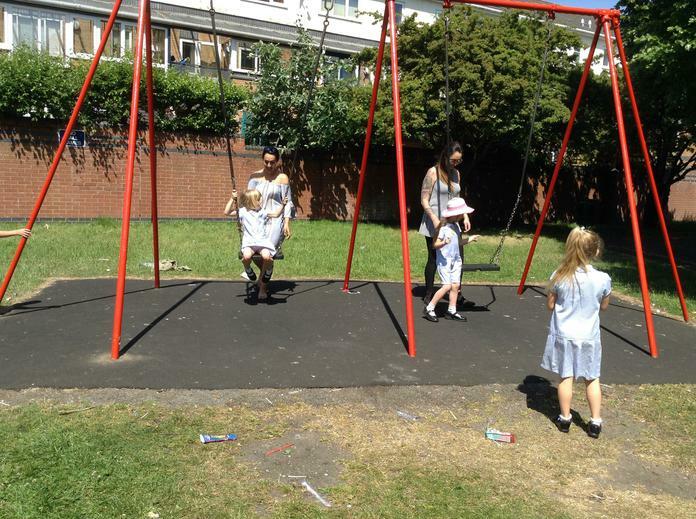 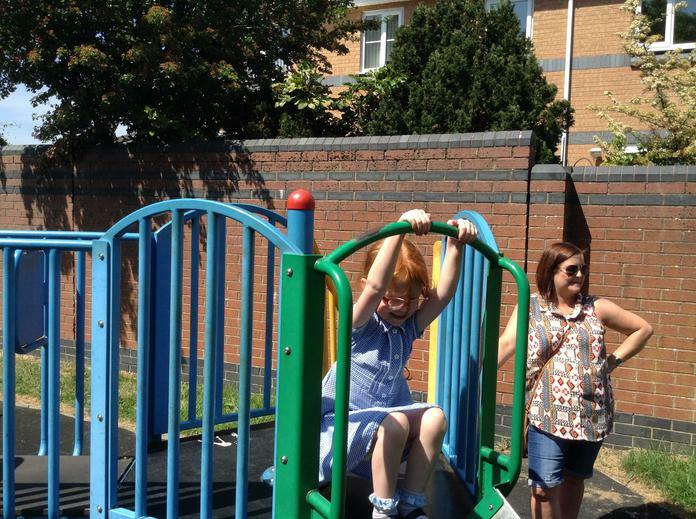 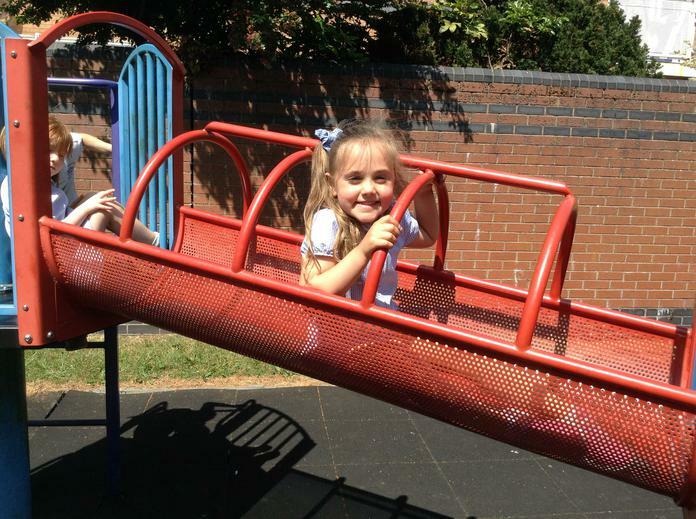 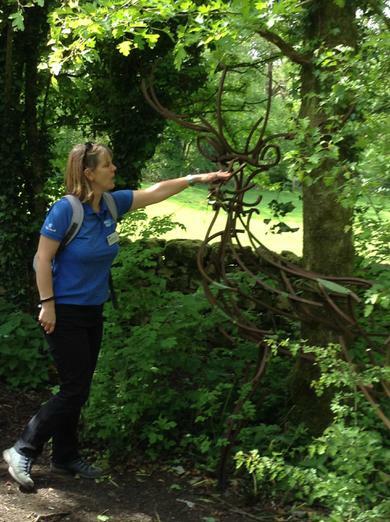 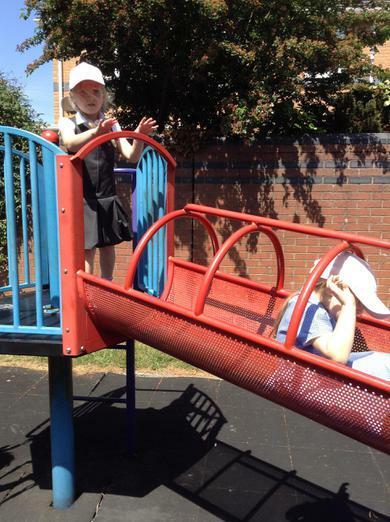 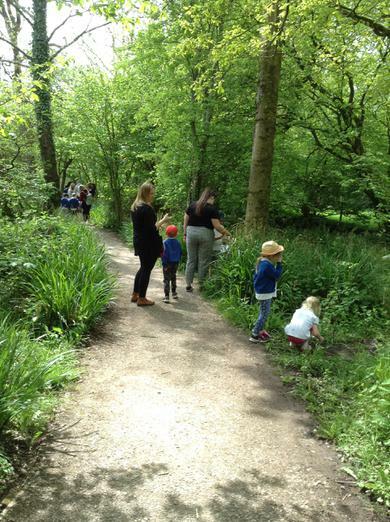 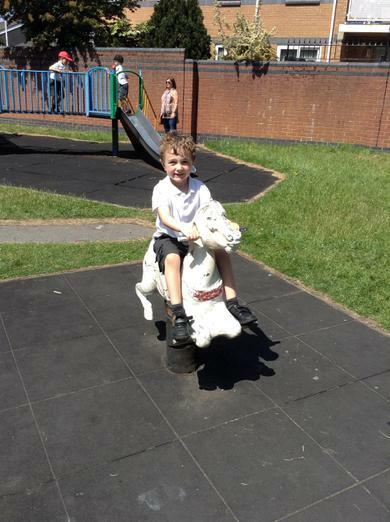 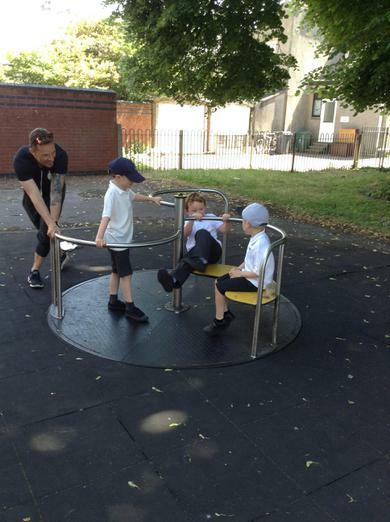 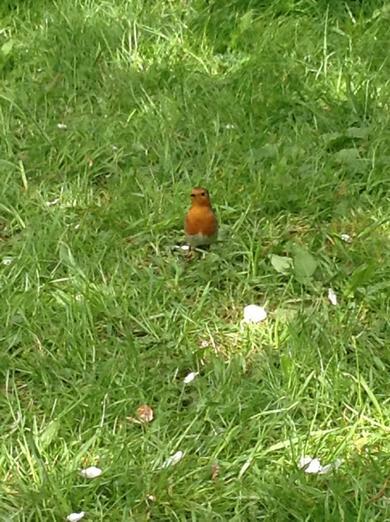 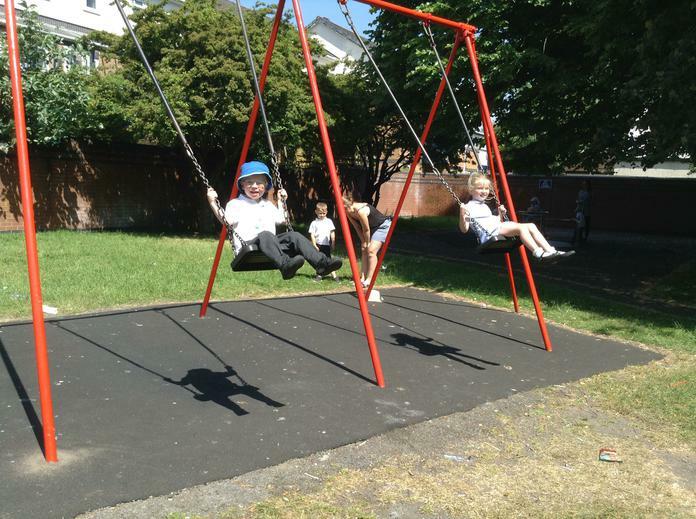 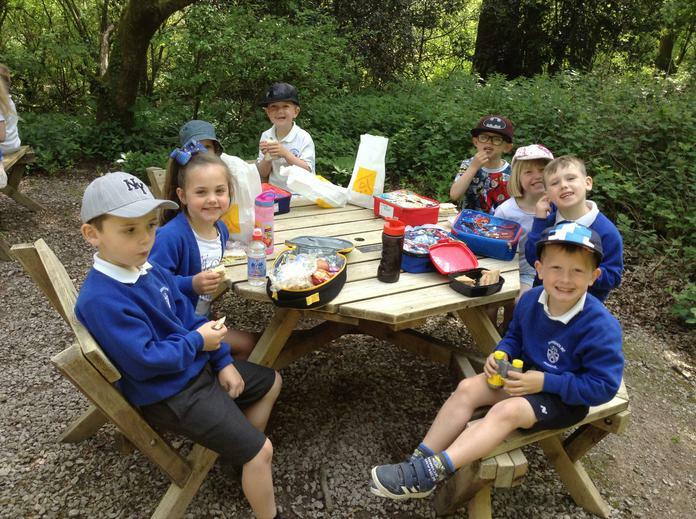 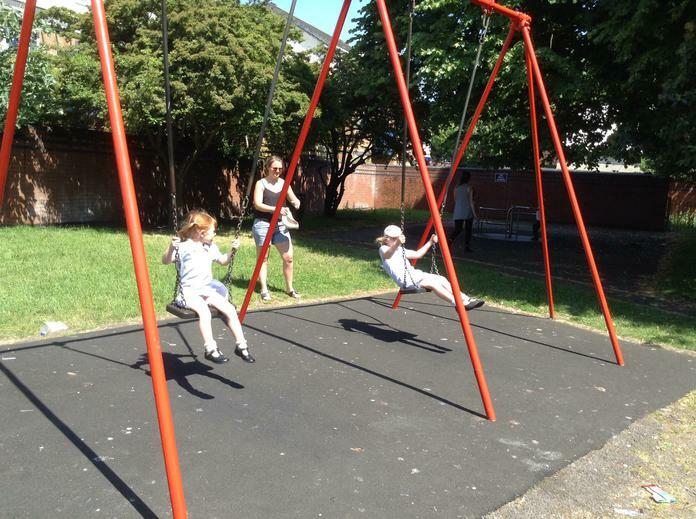 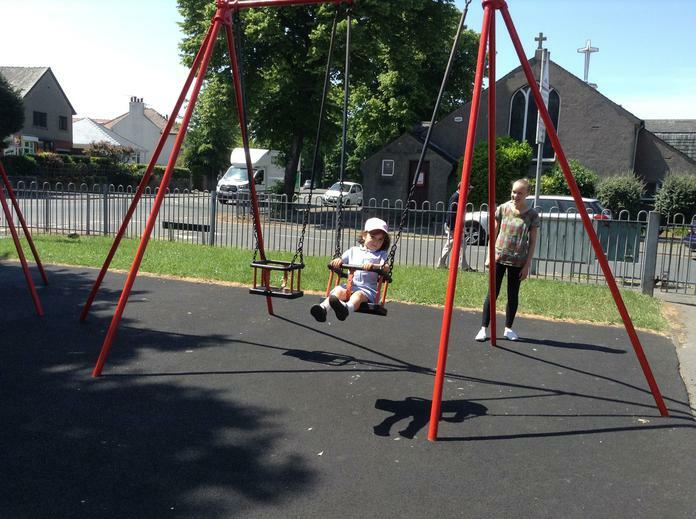 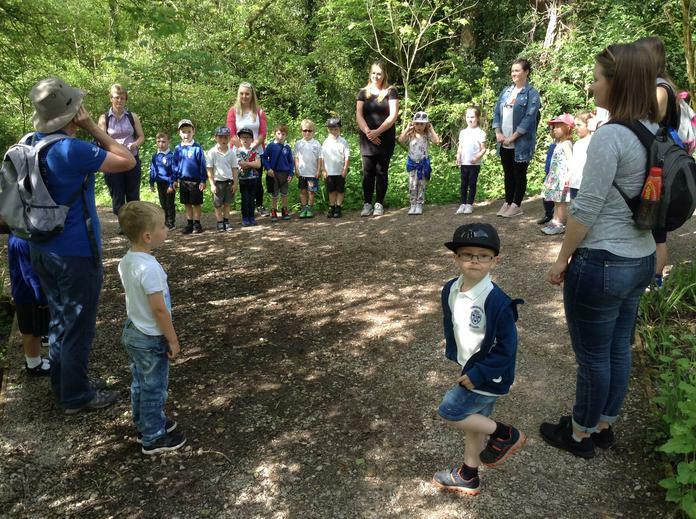 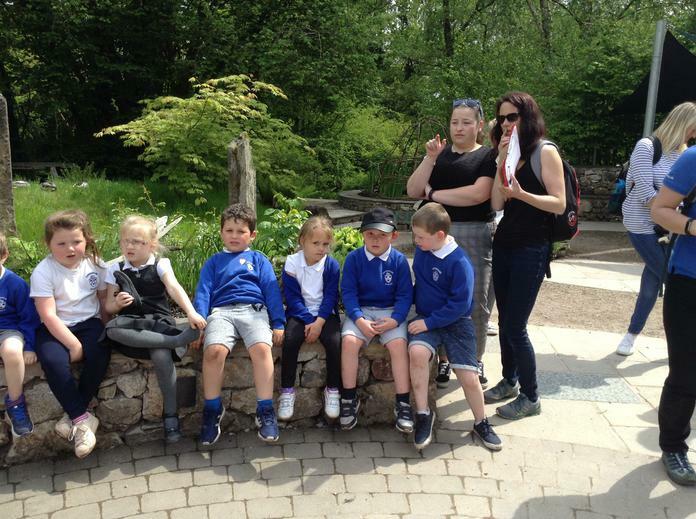 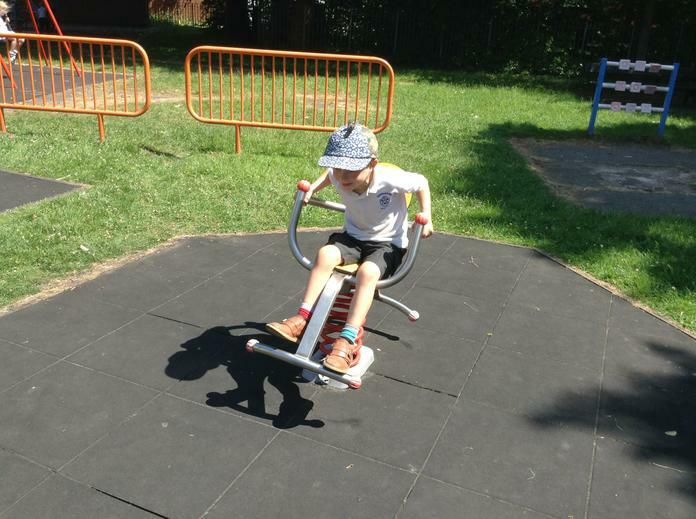 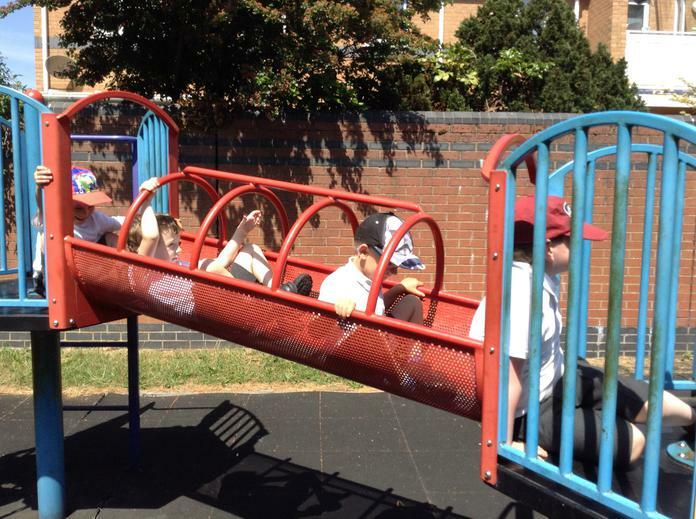 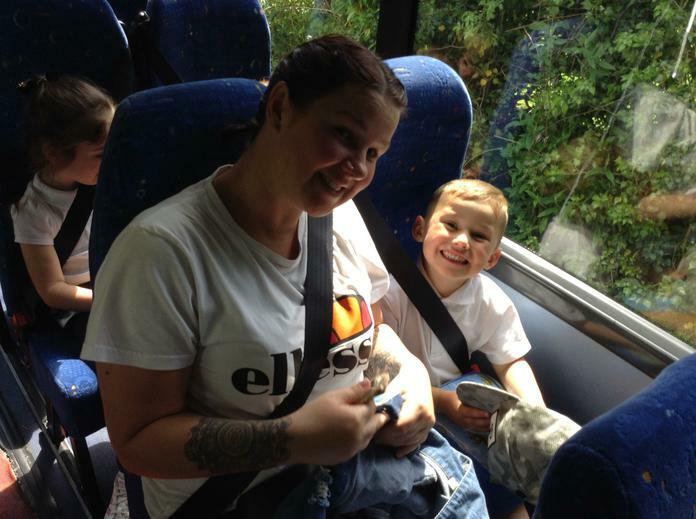 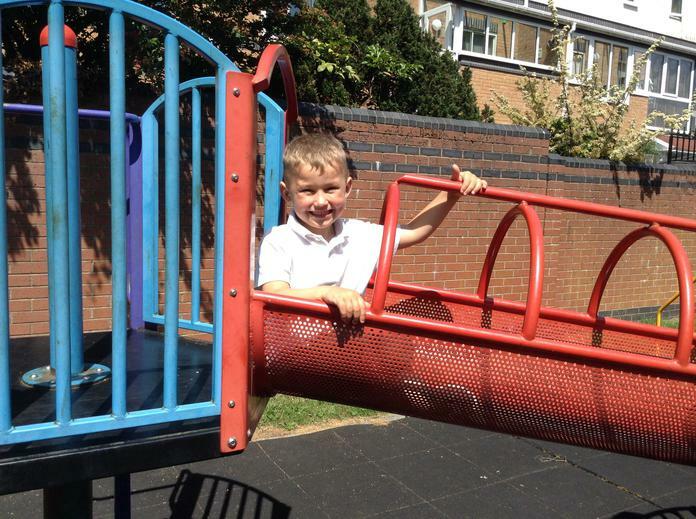 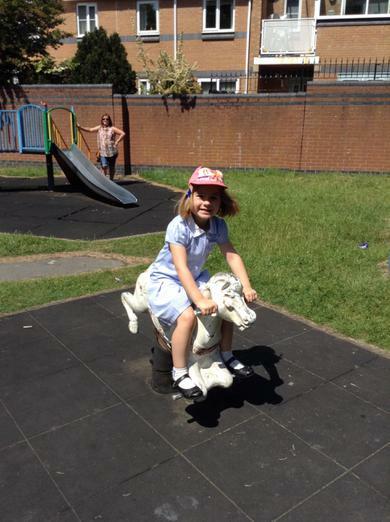 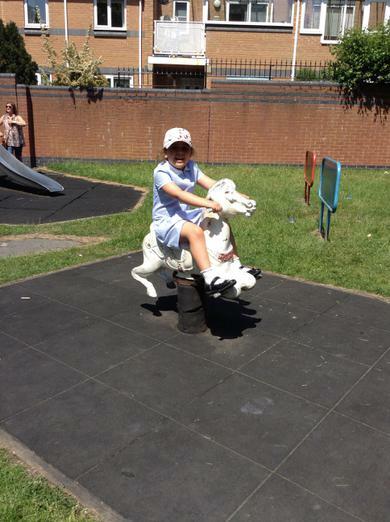 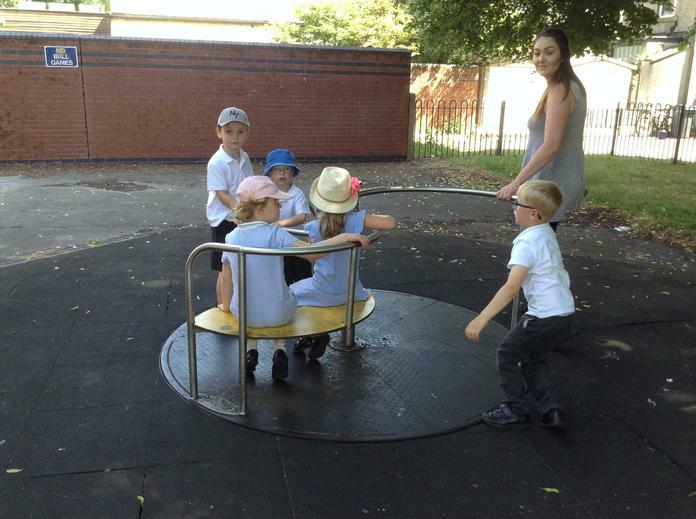 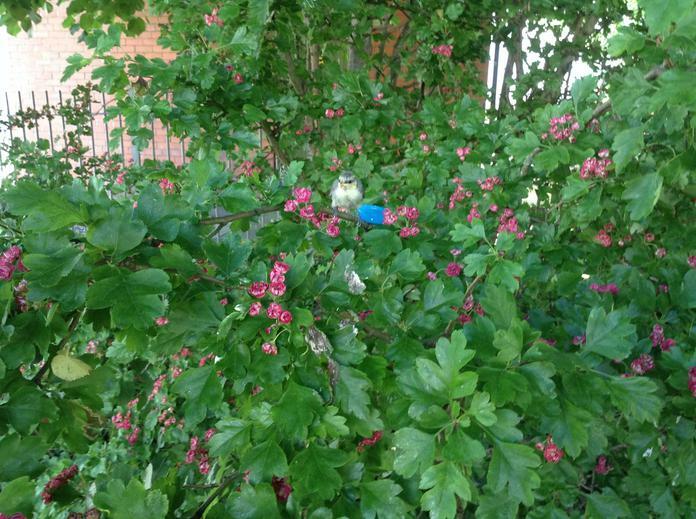 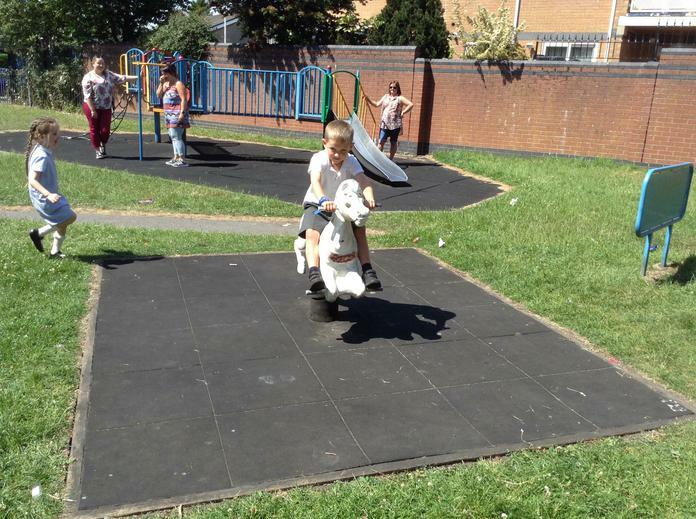 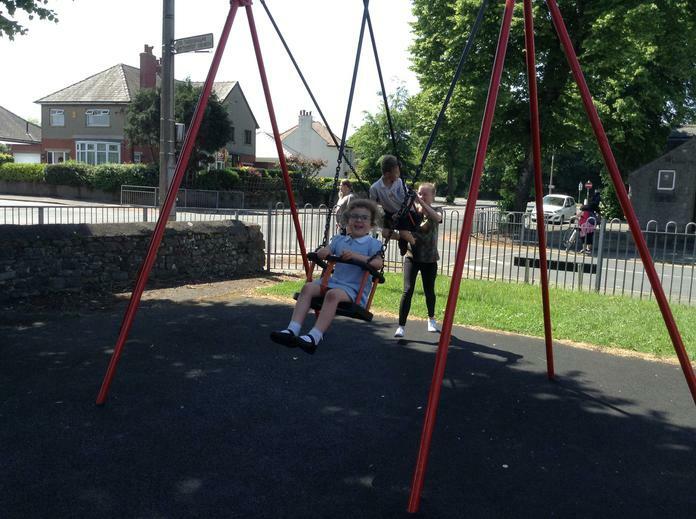 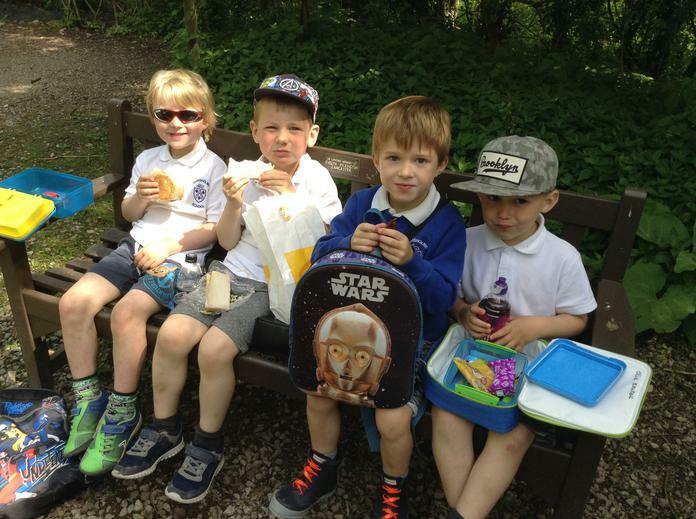 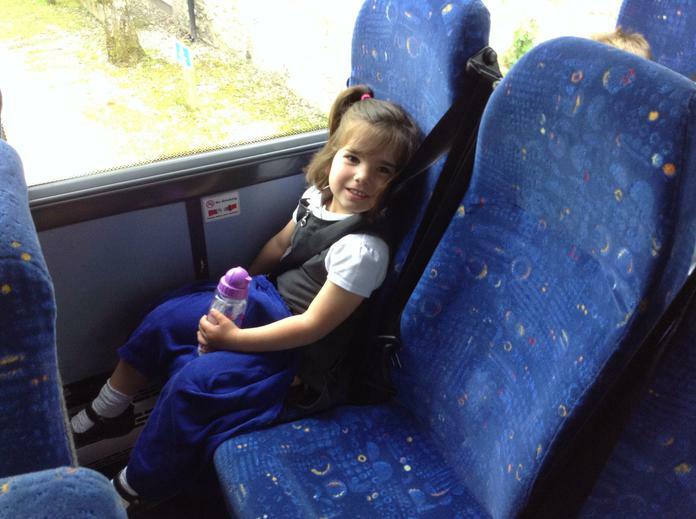 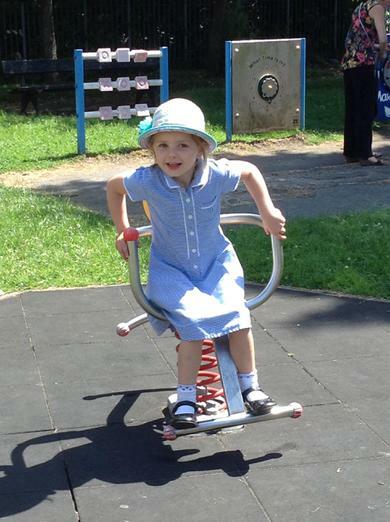 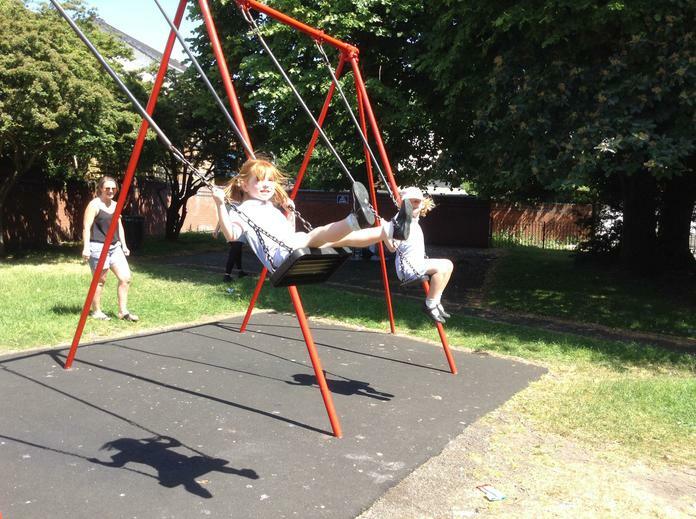 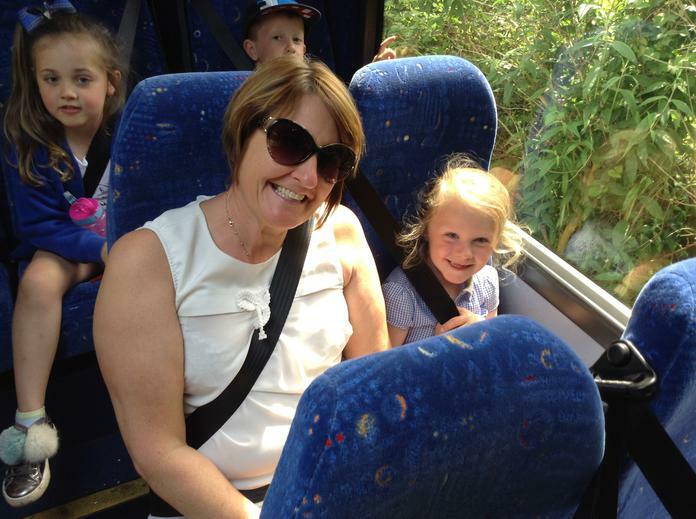 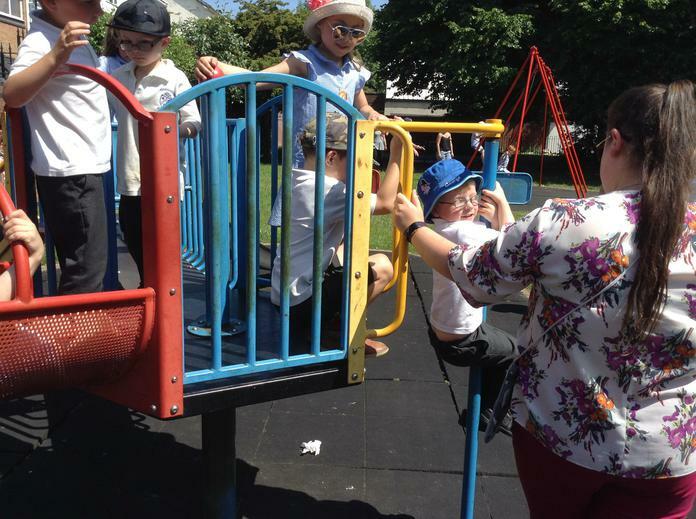 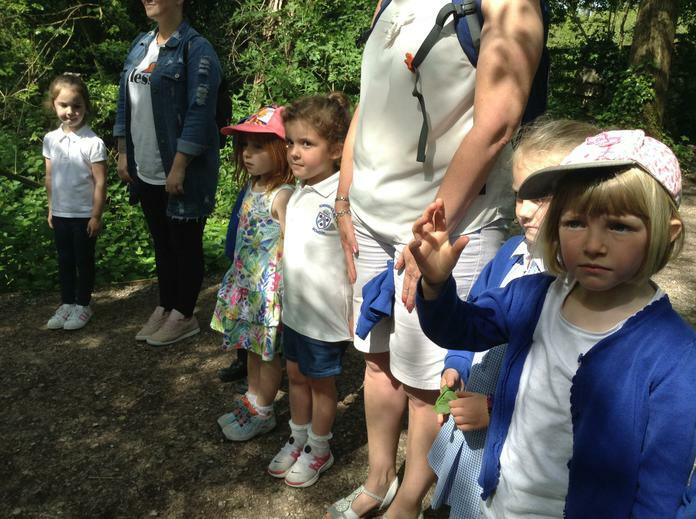 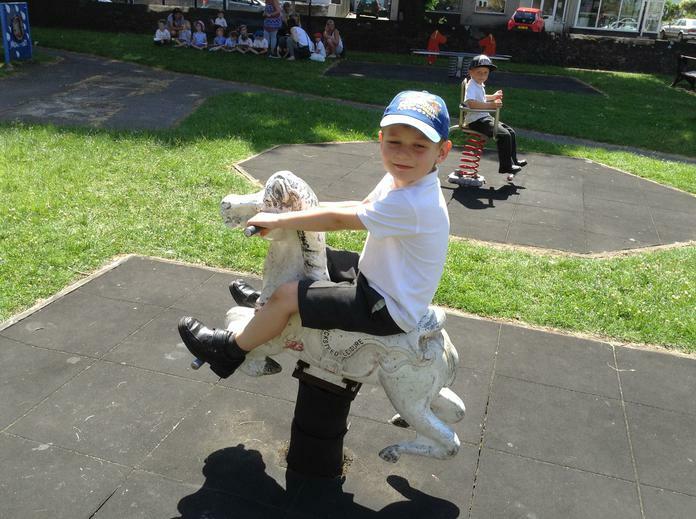 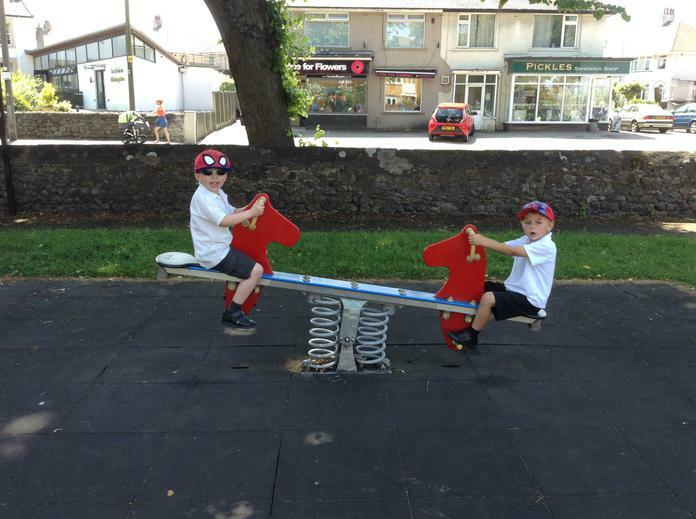 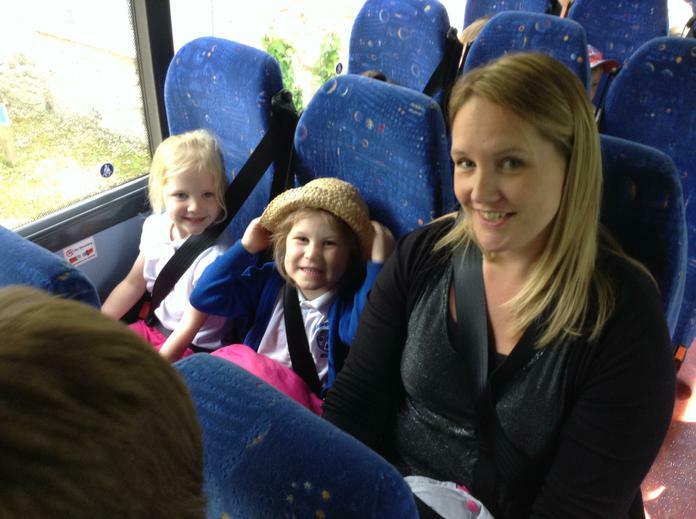 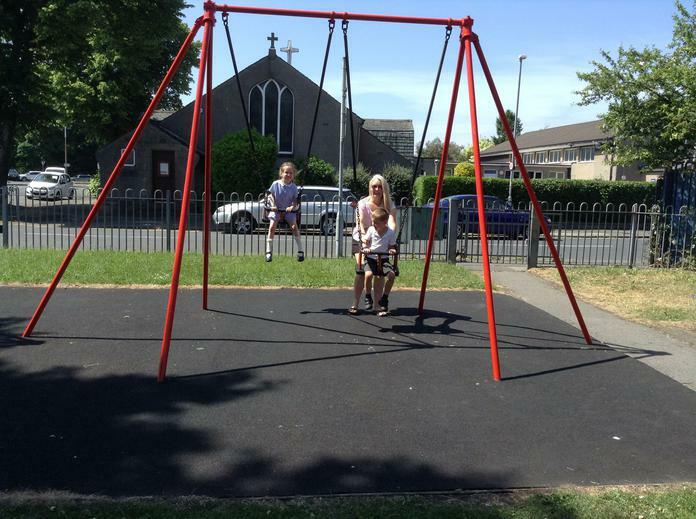 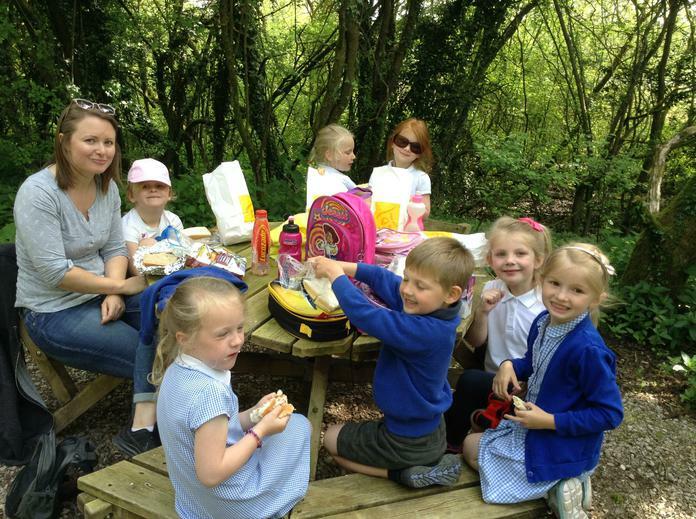 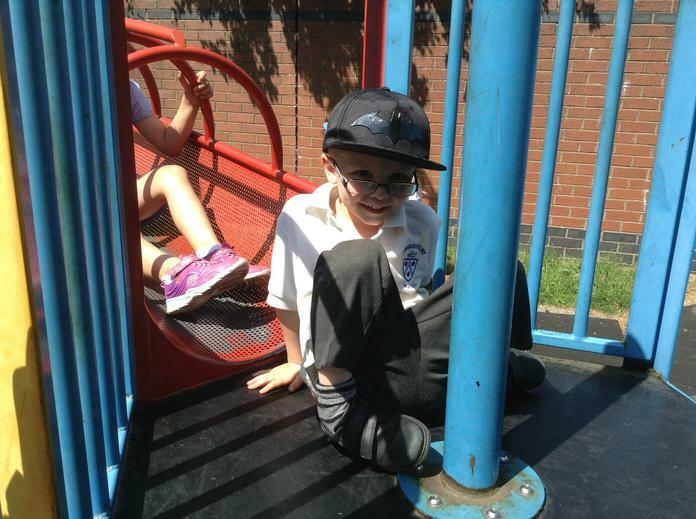 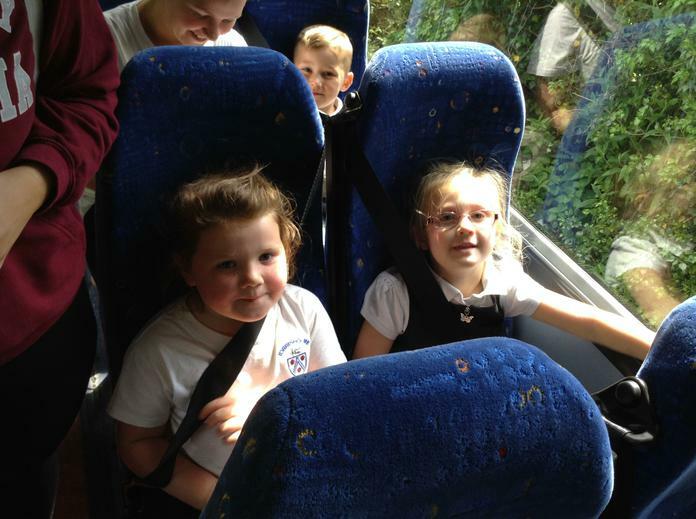 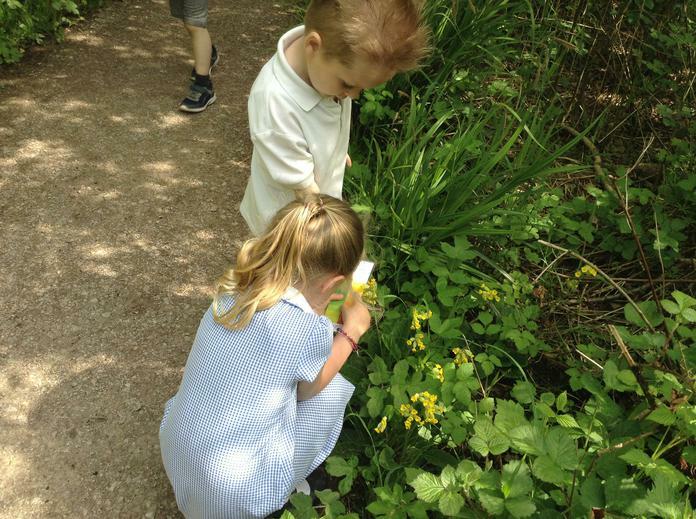 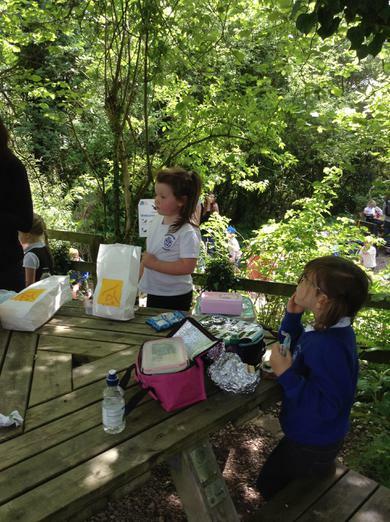 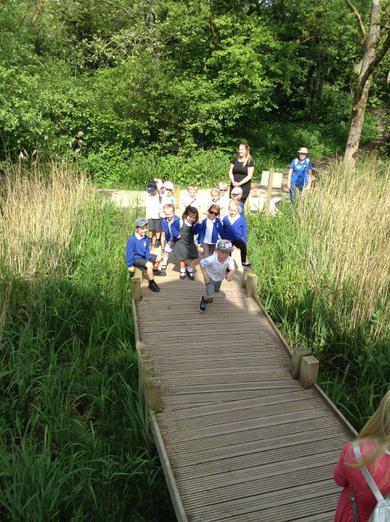 We had a great time exploring Torrisholme Park checking out its current features! 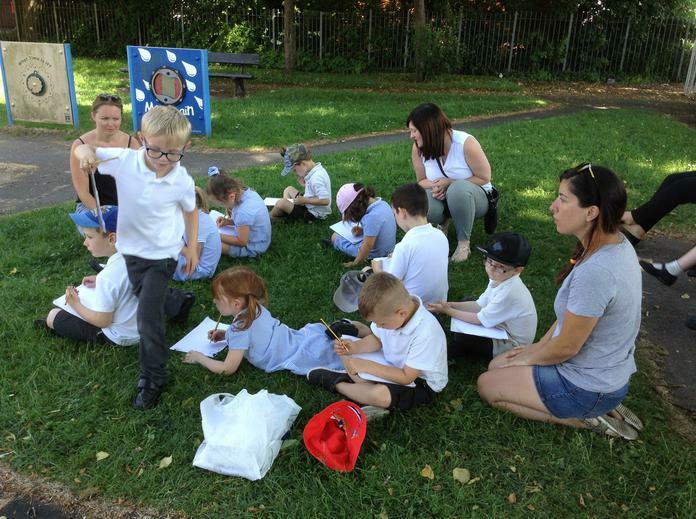 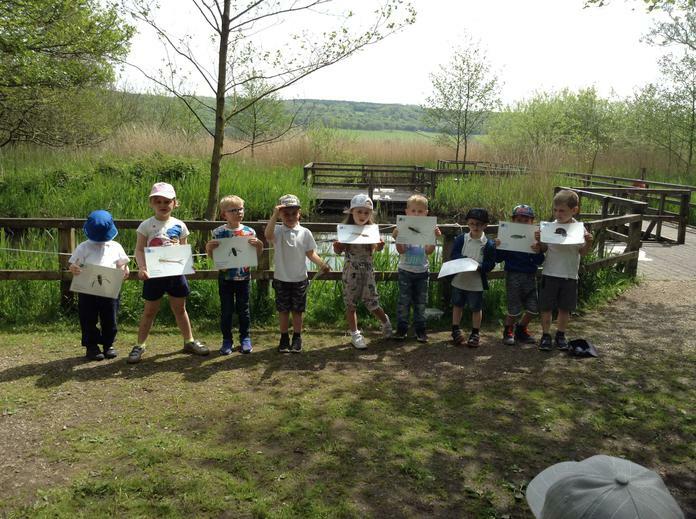 We then discussed how the park could be improved and created 3D paper designs. 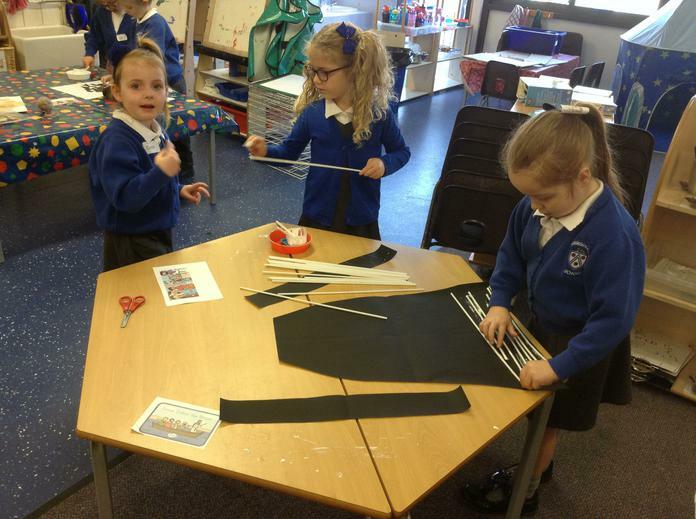 We have enjoyed having a go at sewing during history week! 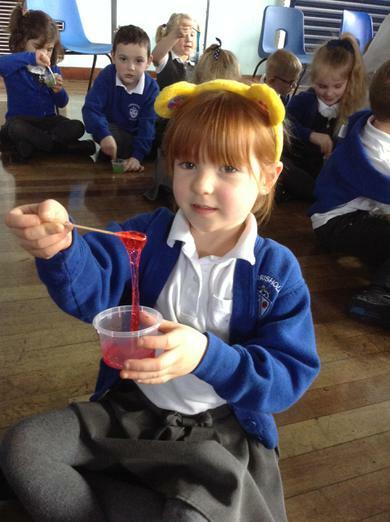 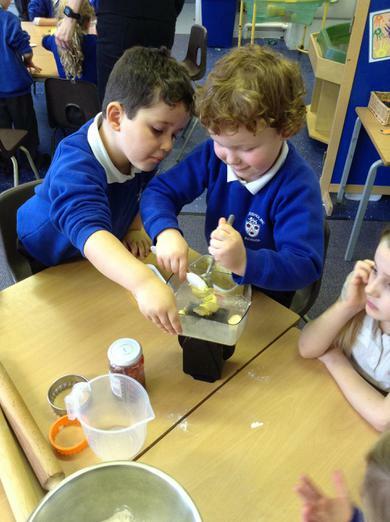 We have had lots of fun playing games from the past and making our own play dough. 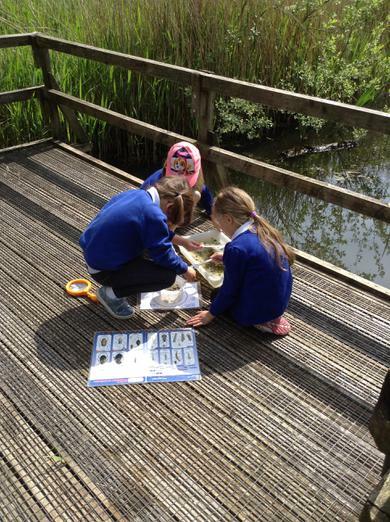 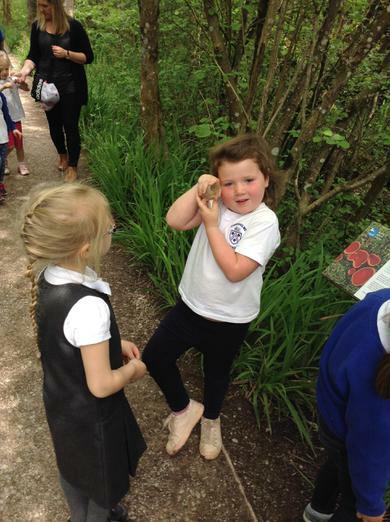 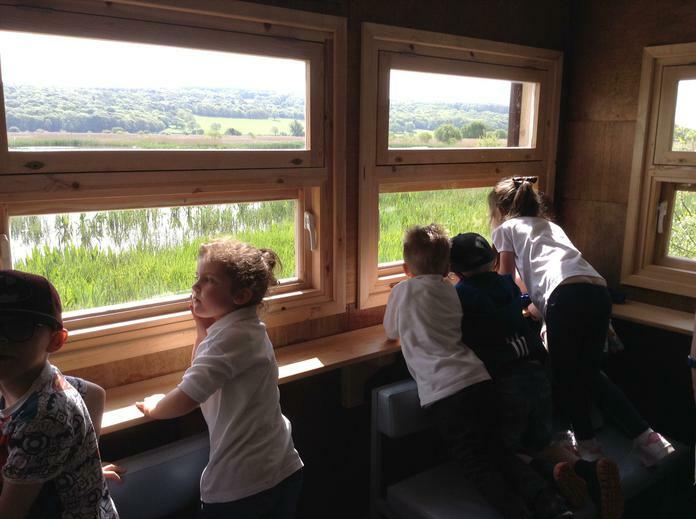 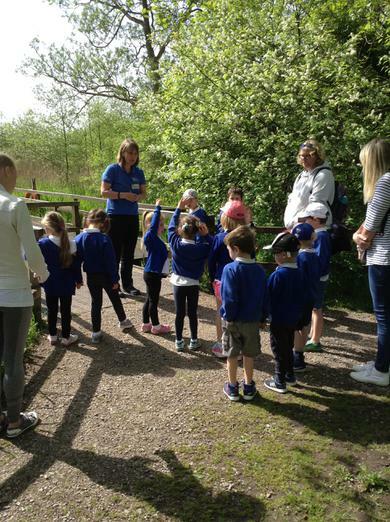 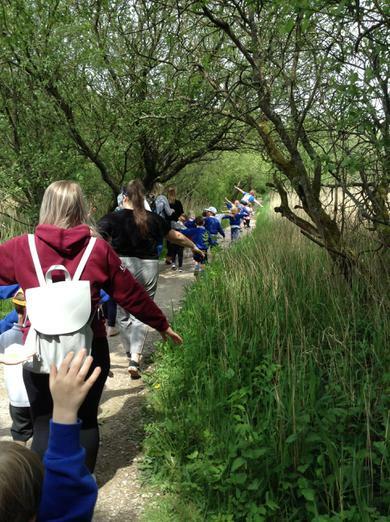 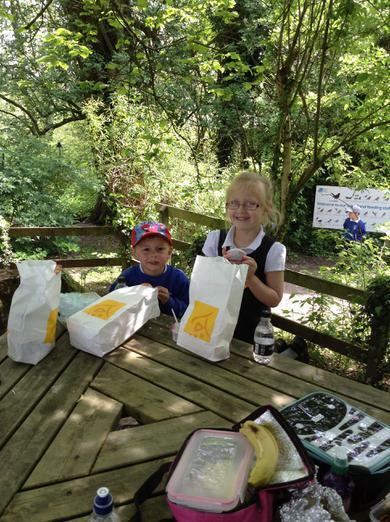 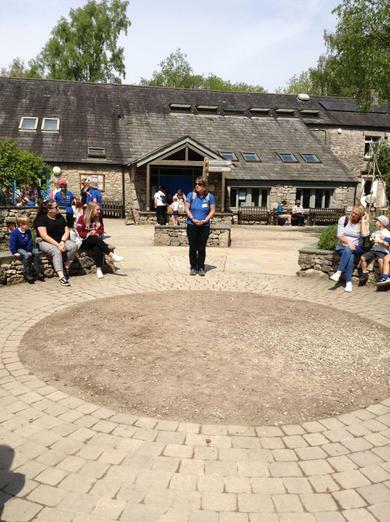 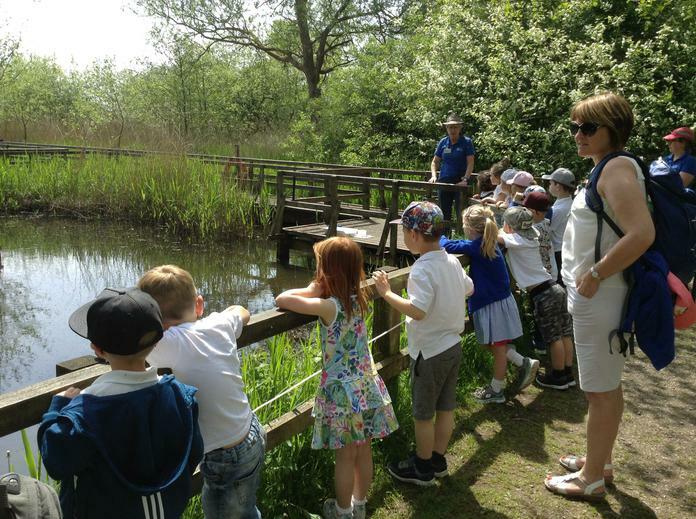 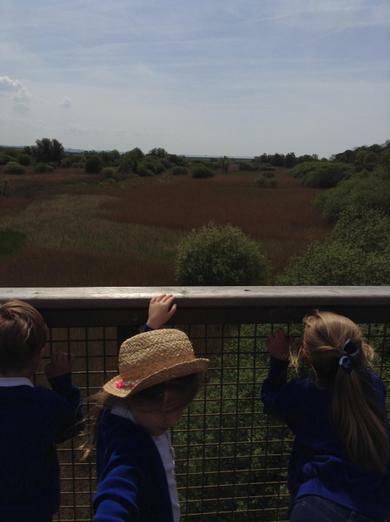 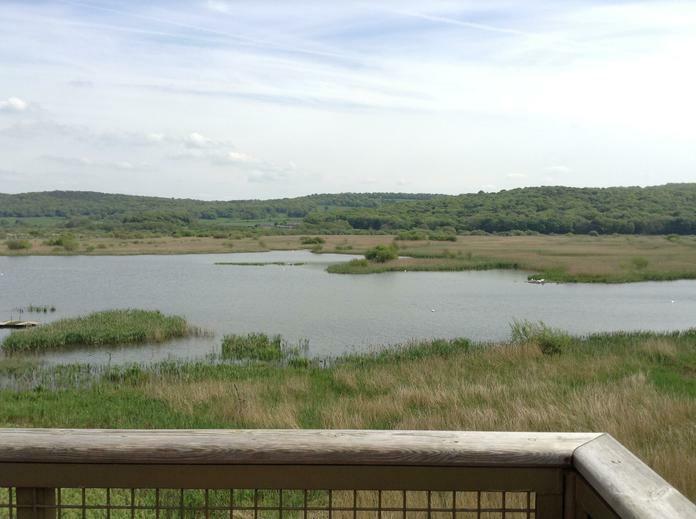 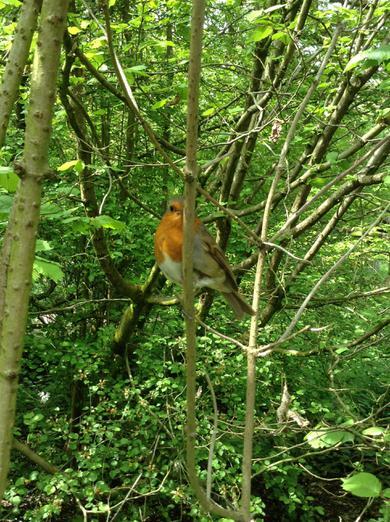 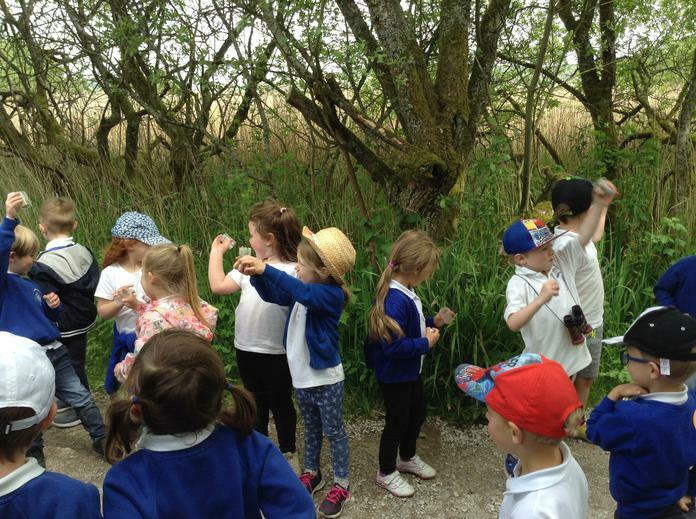 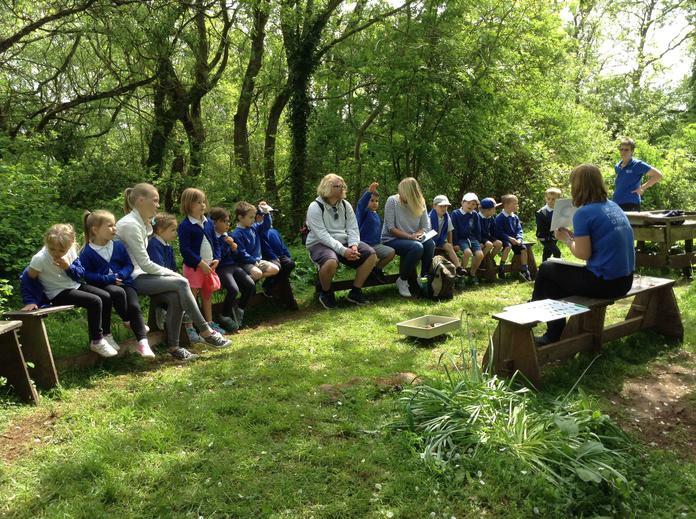 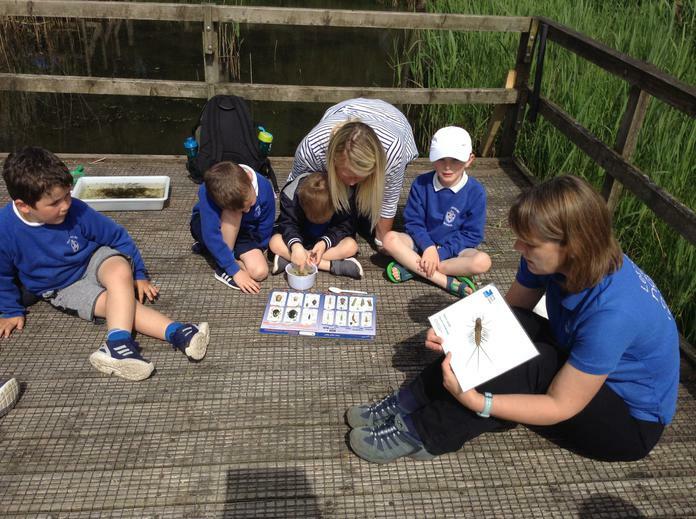 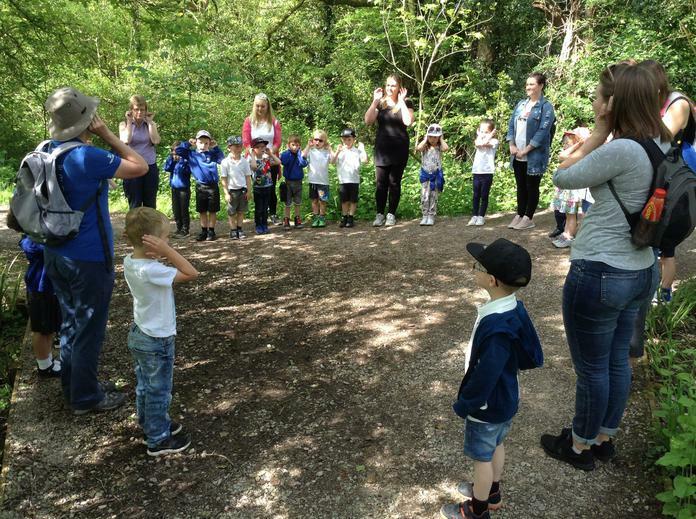 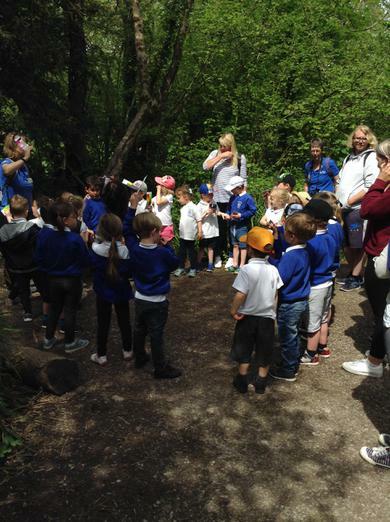 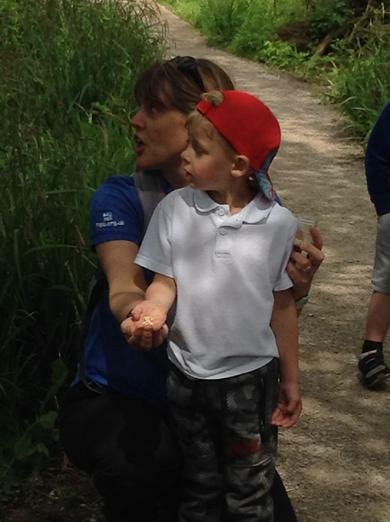 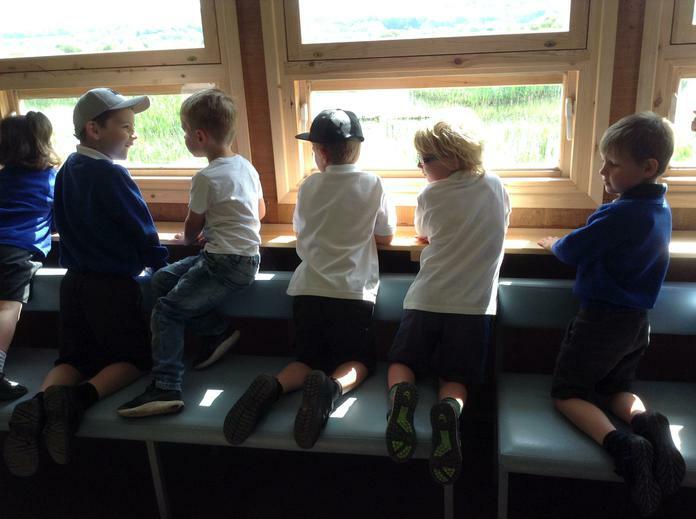 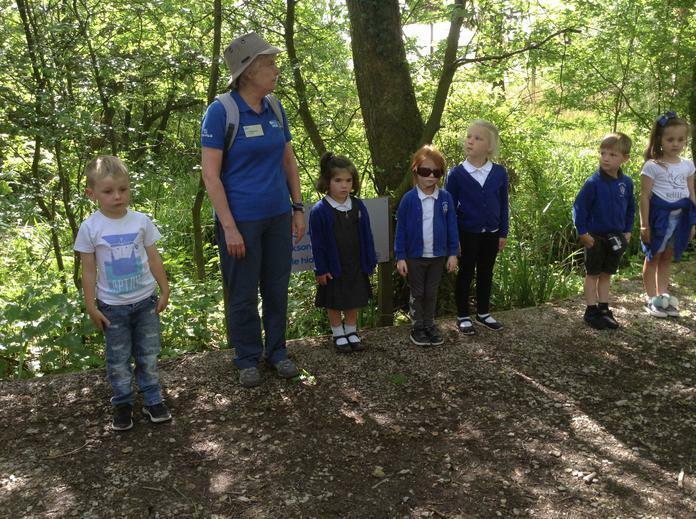 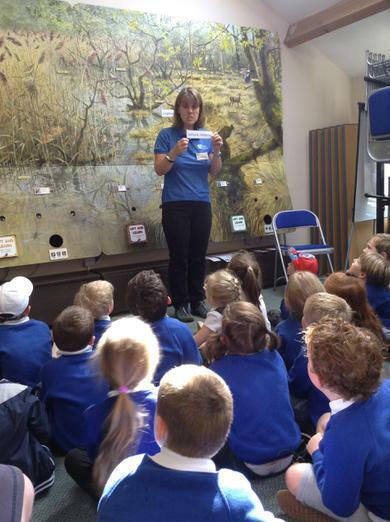 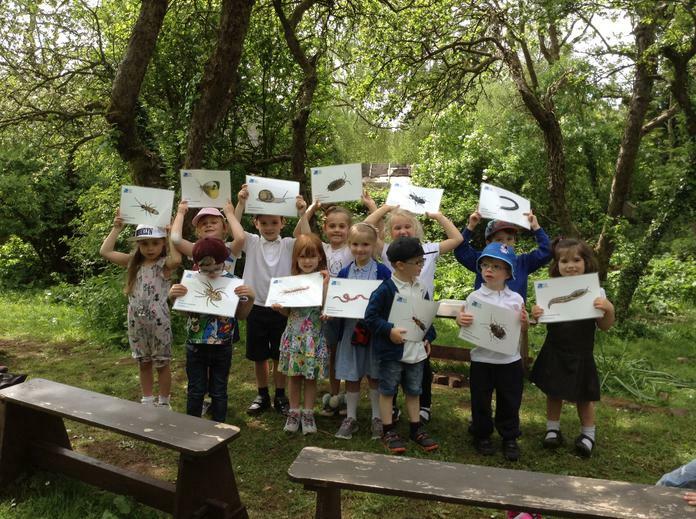 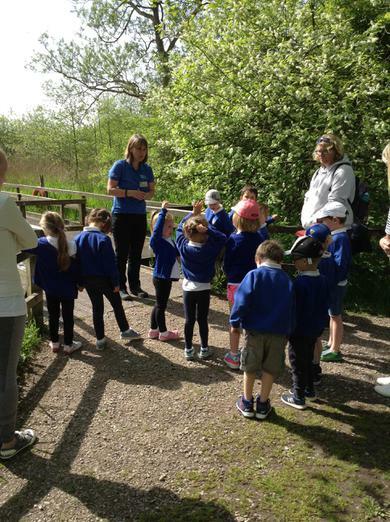 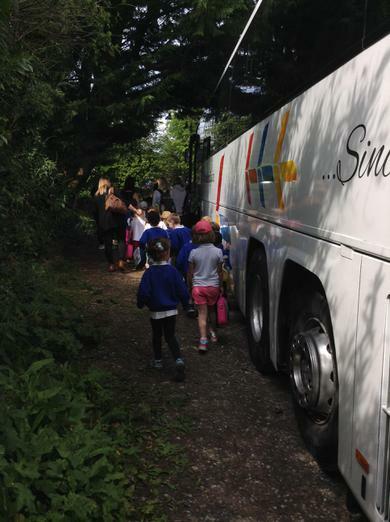 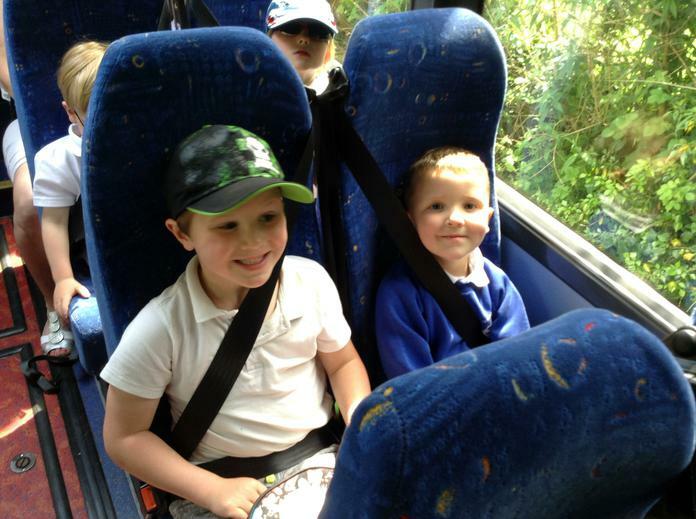 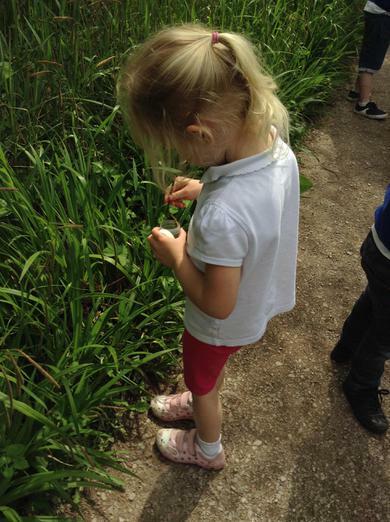 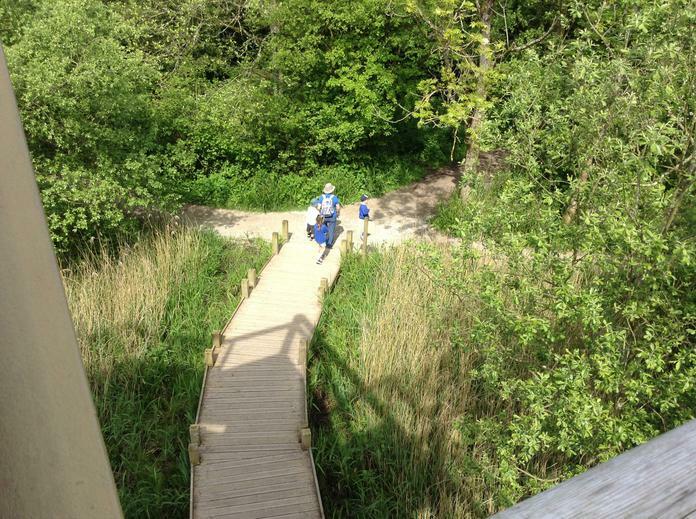 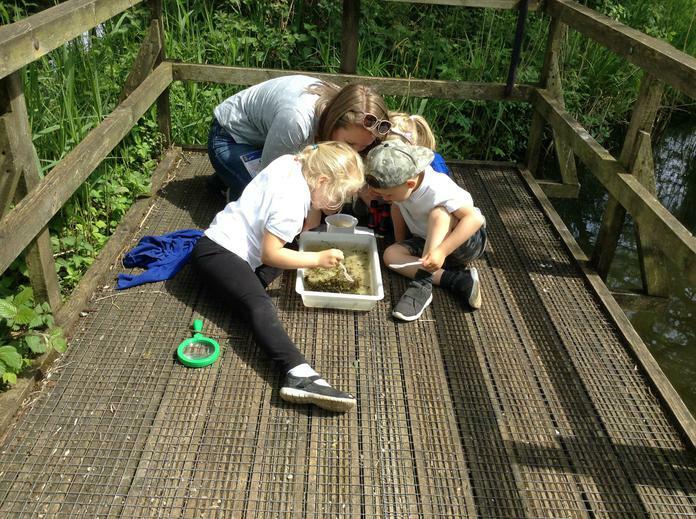 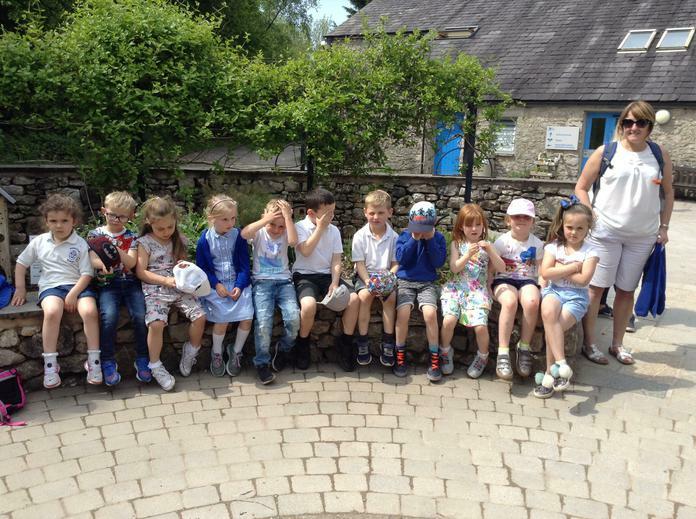 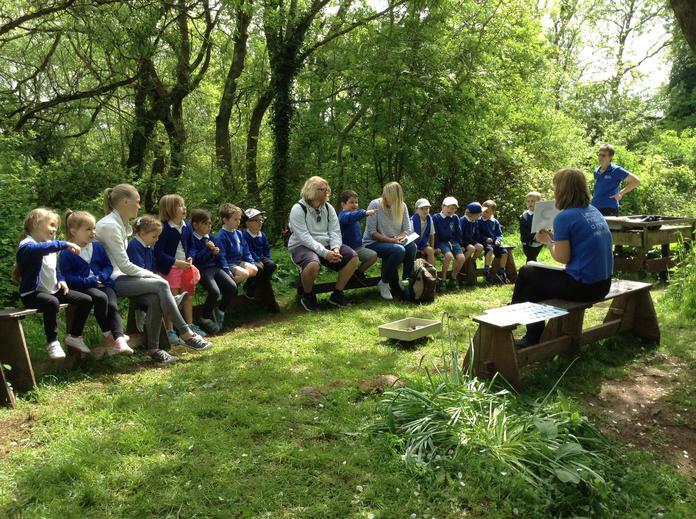 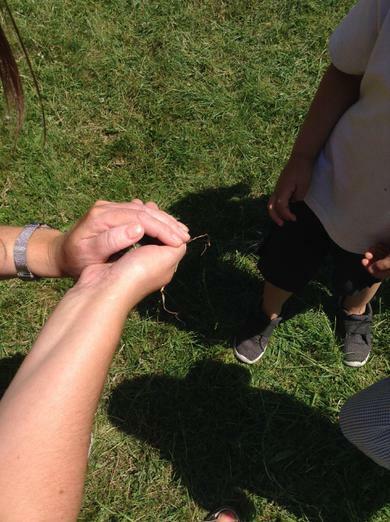 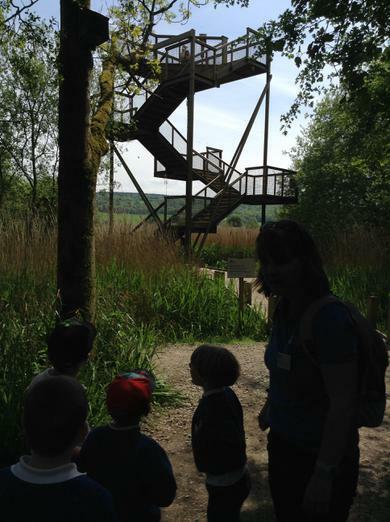 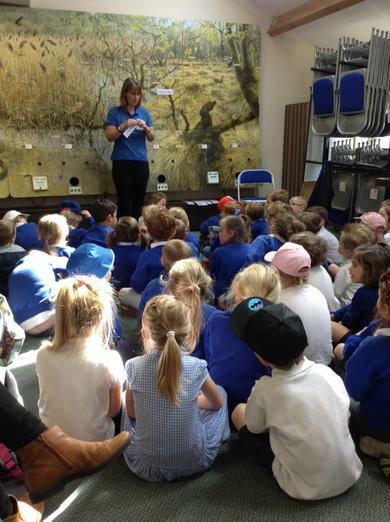 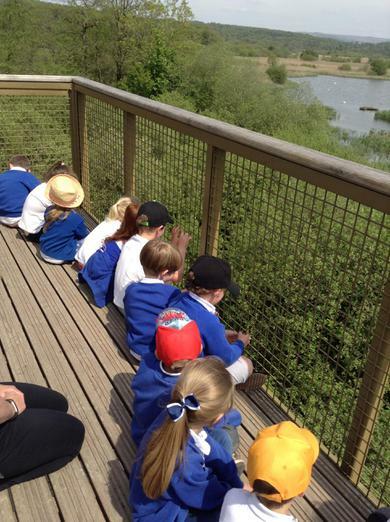 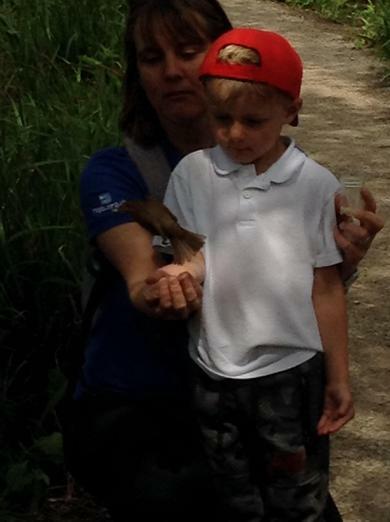 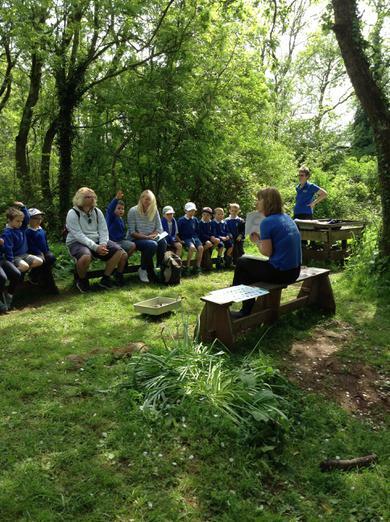 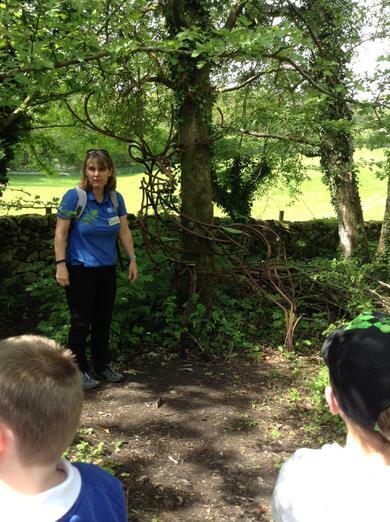 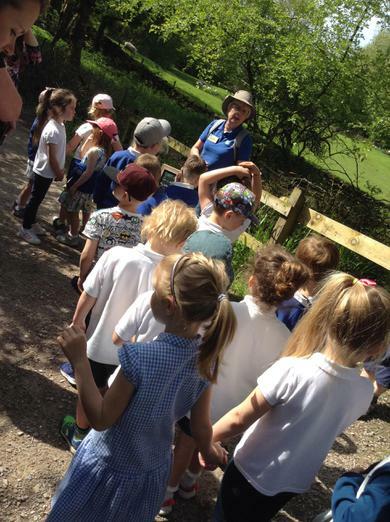 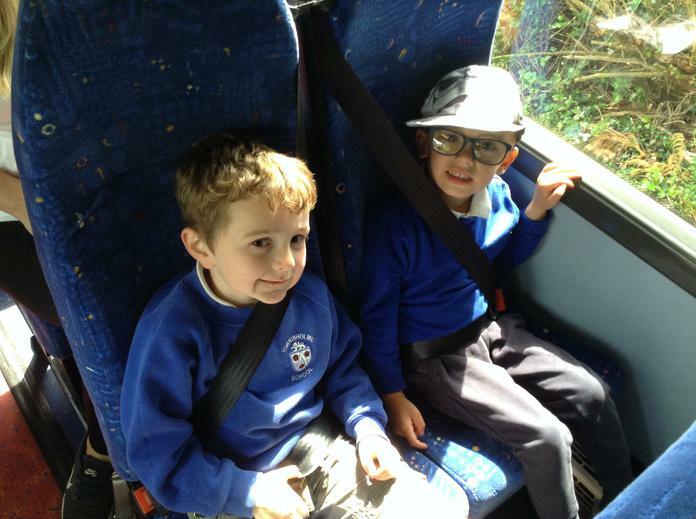 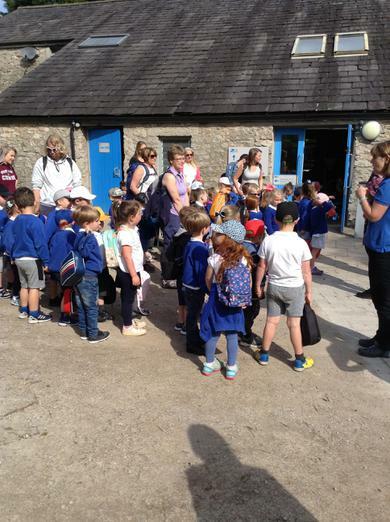 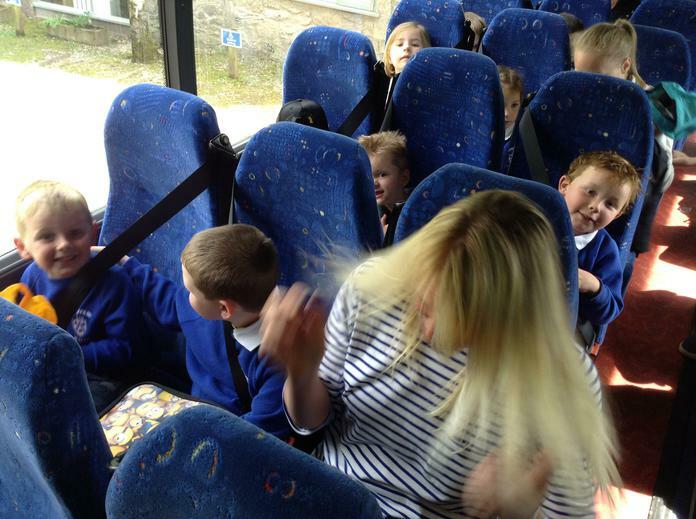 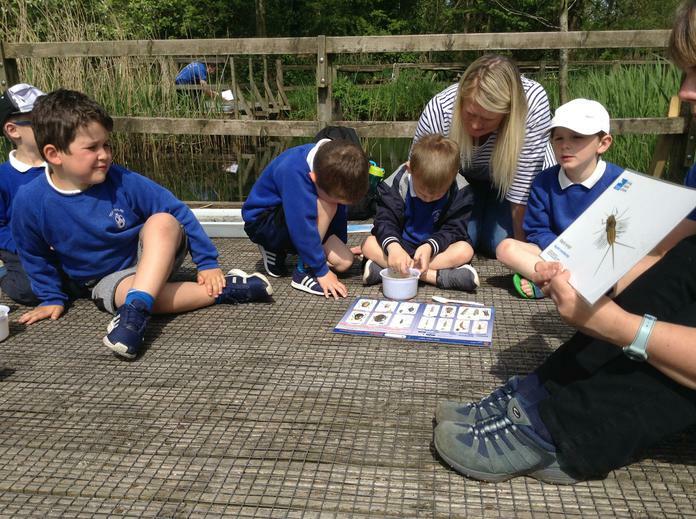 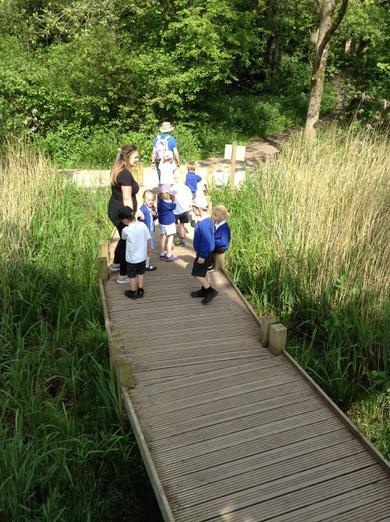 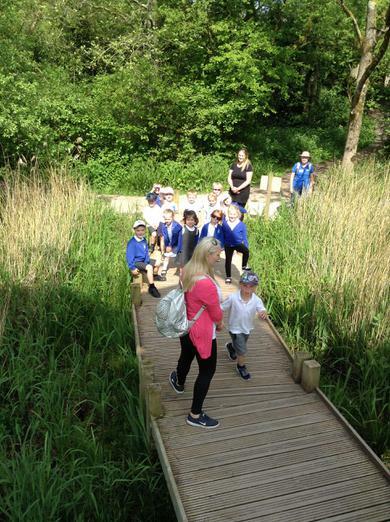 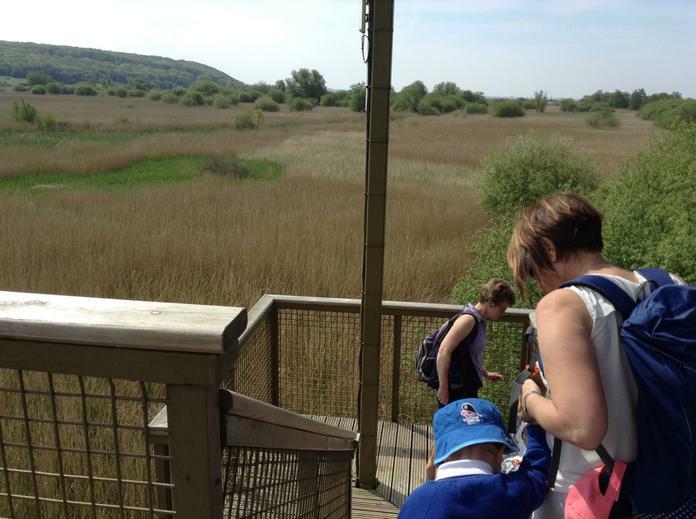 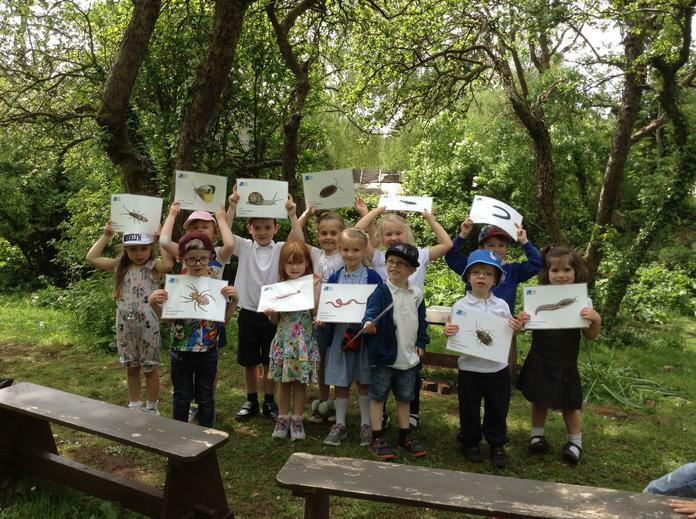 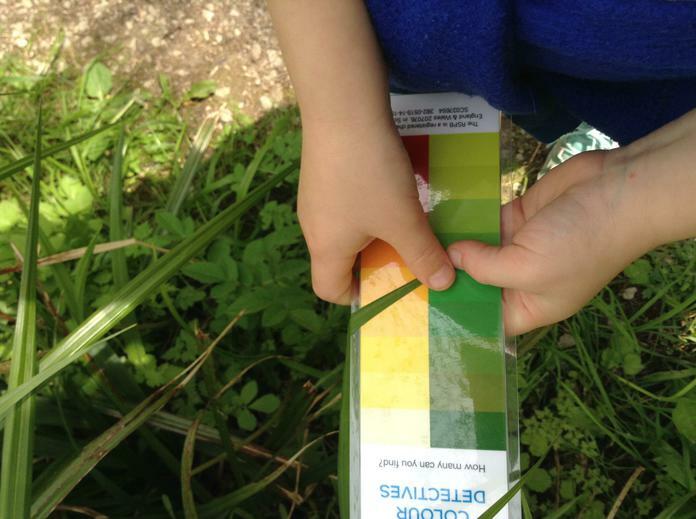 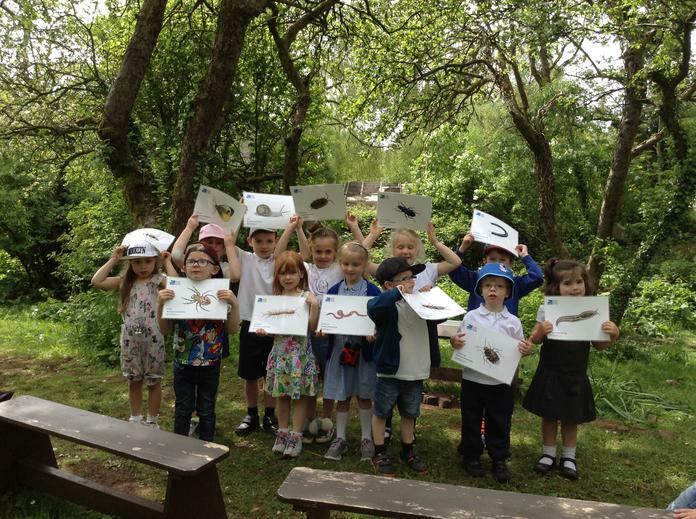 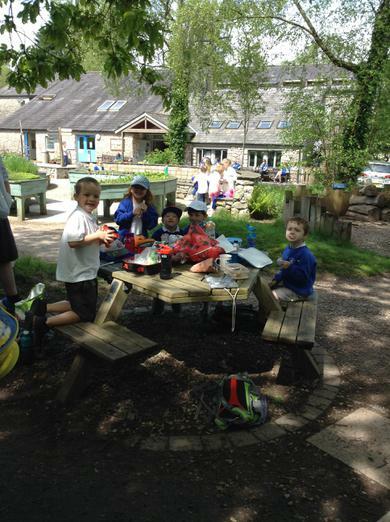 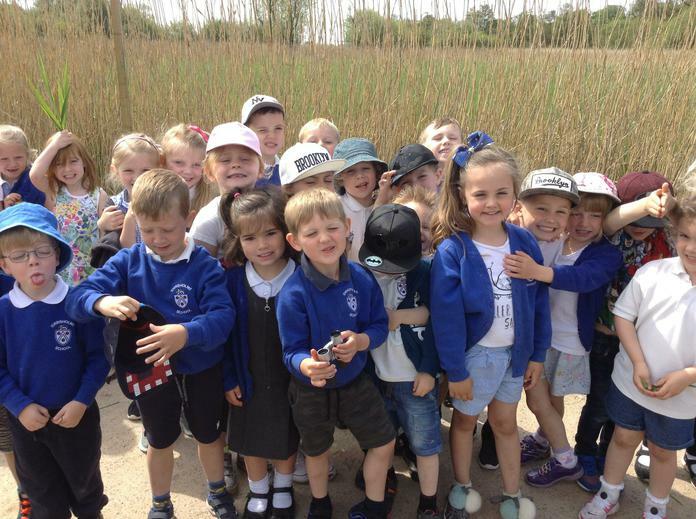 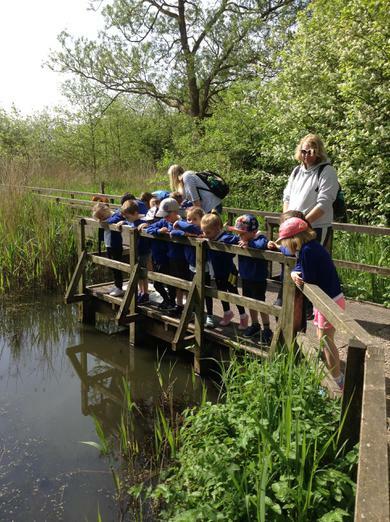 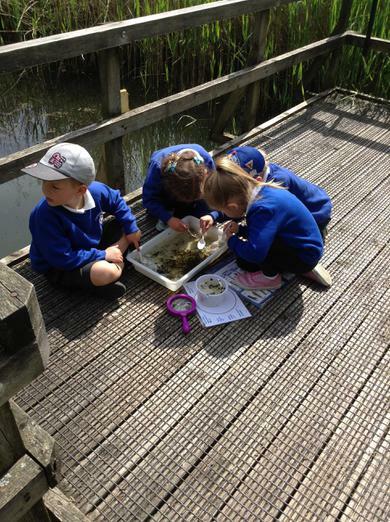 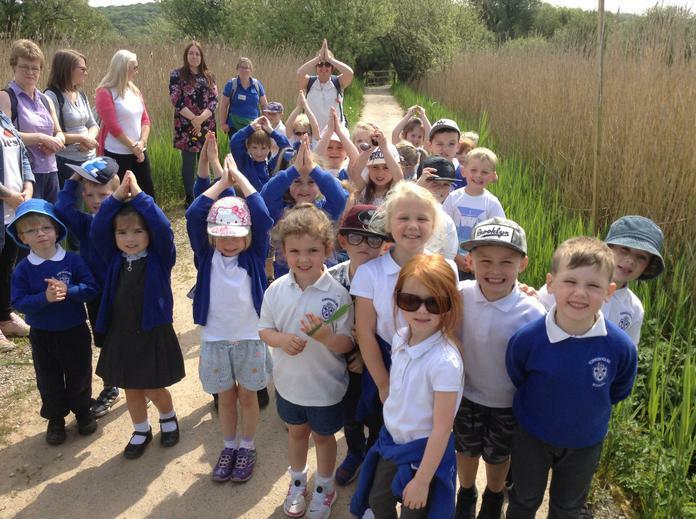 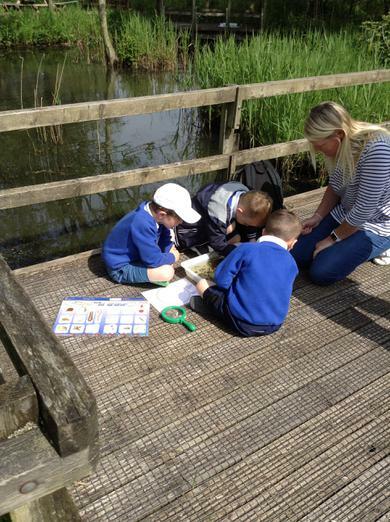 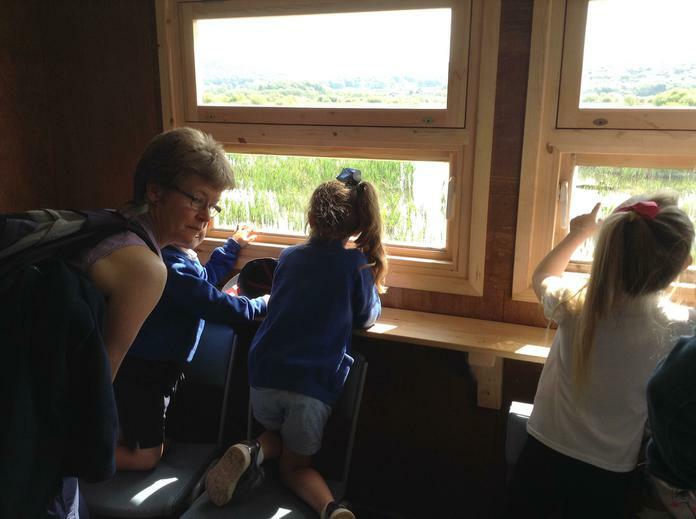 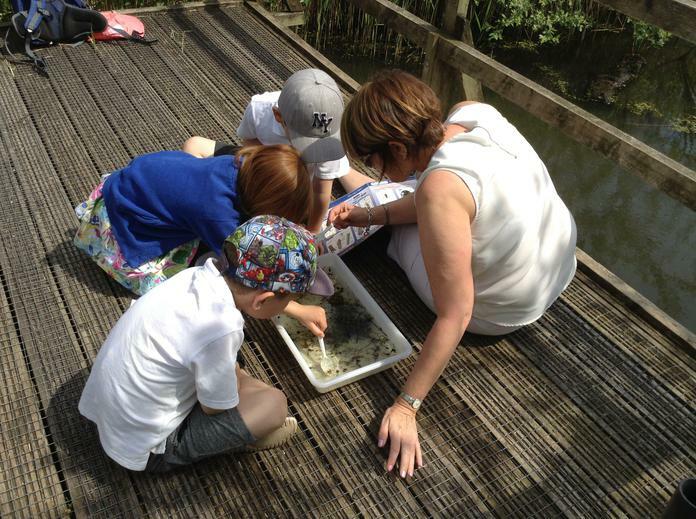 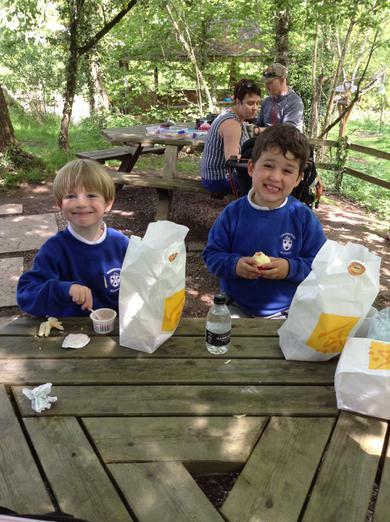 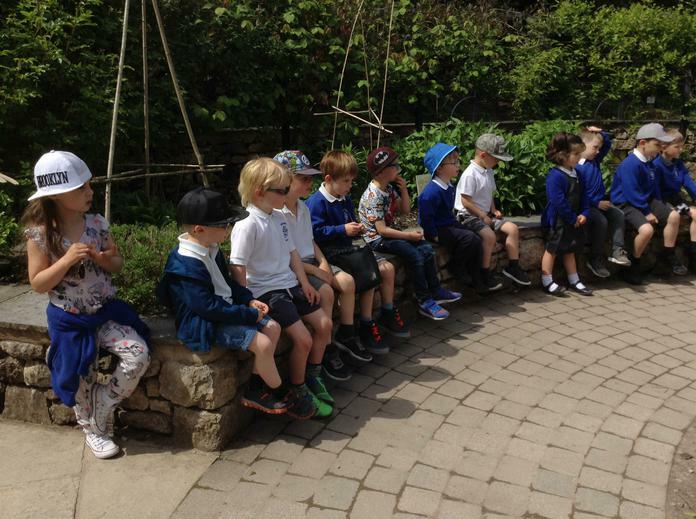 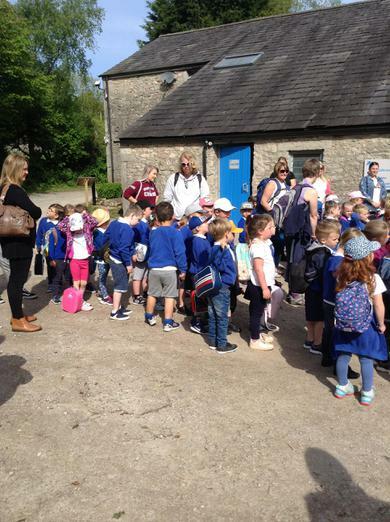 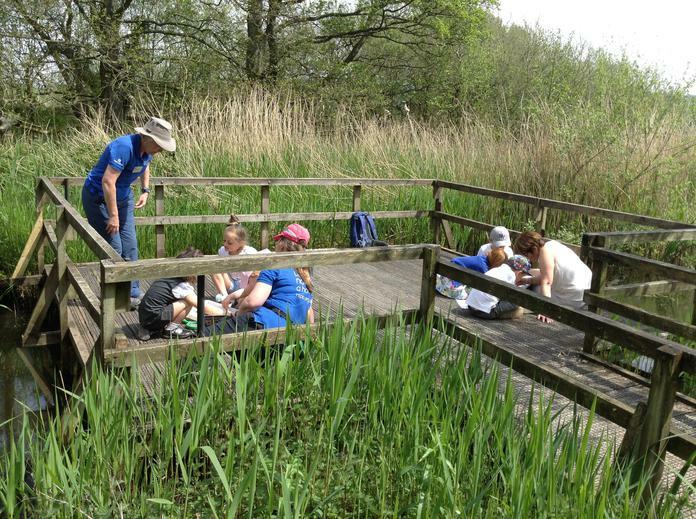 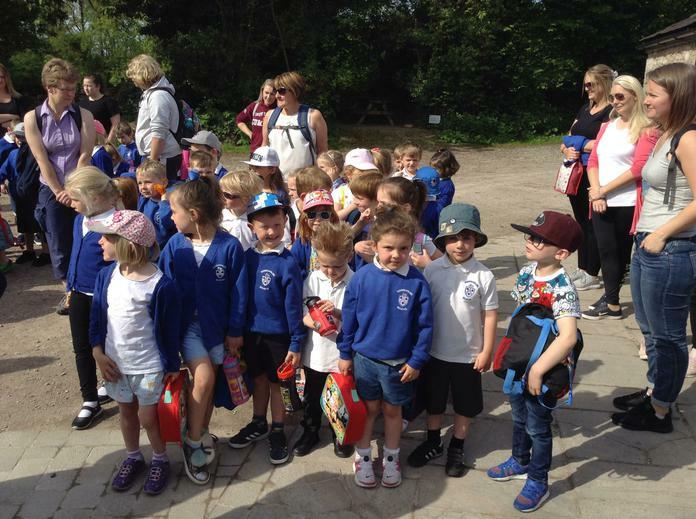 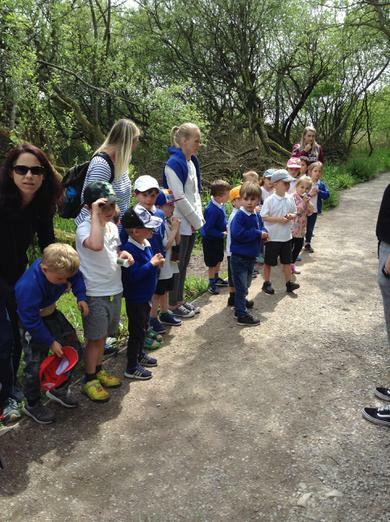 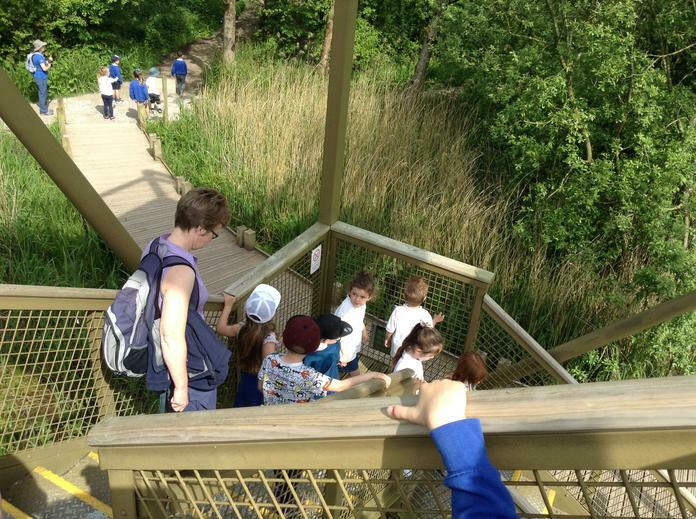 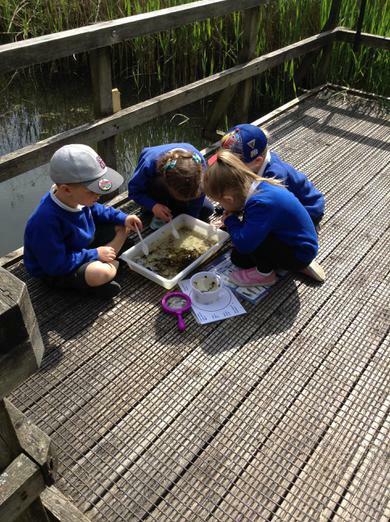 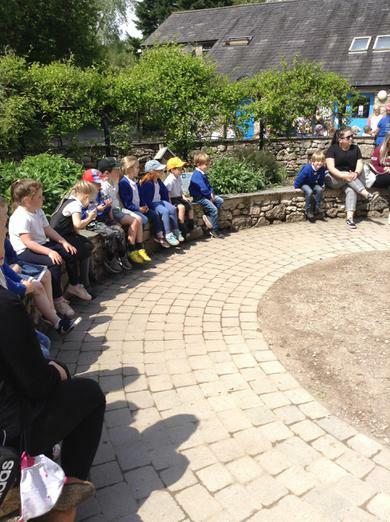 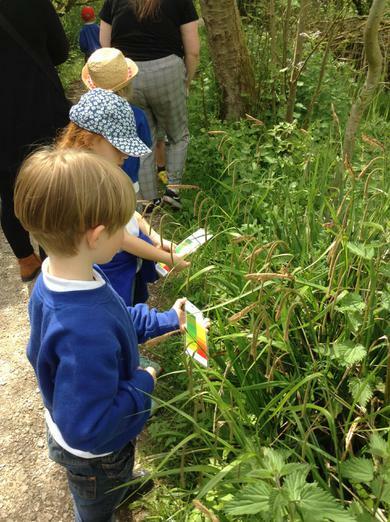 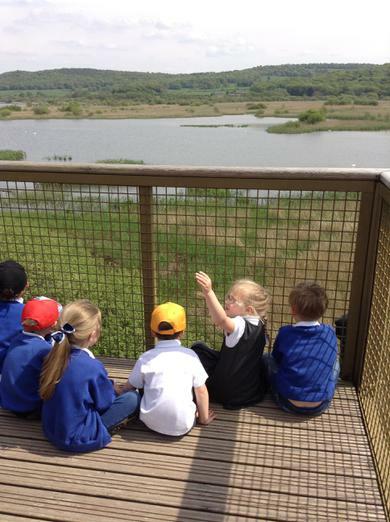 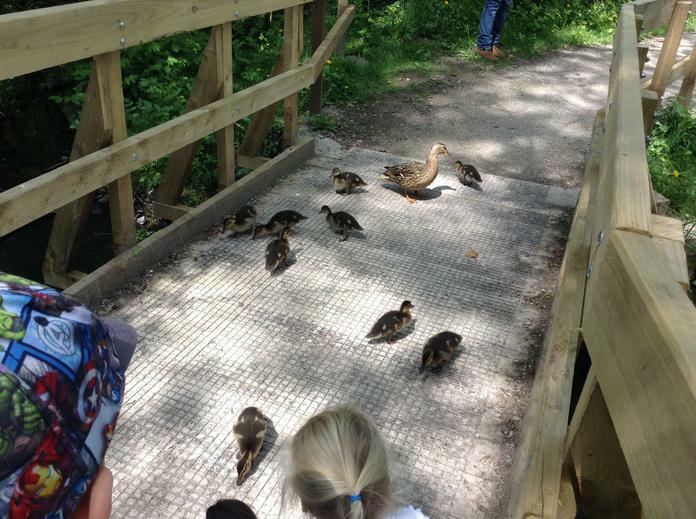 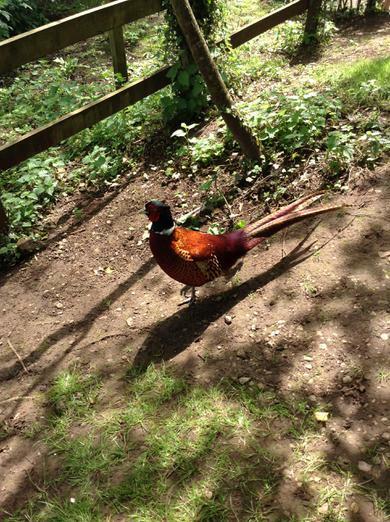 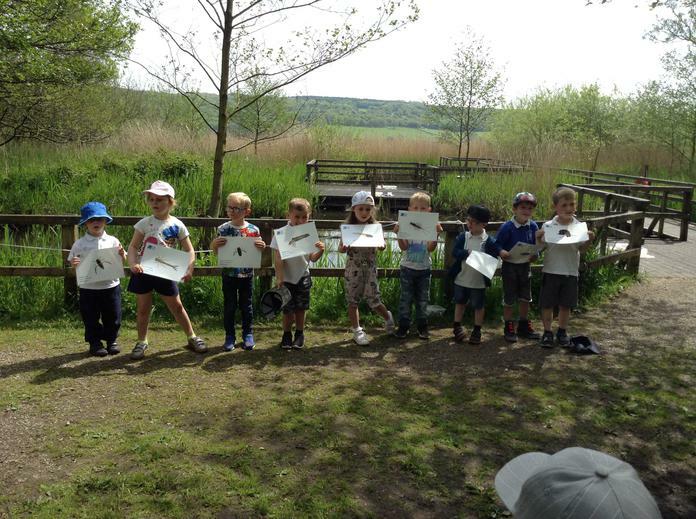 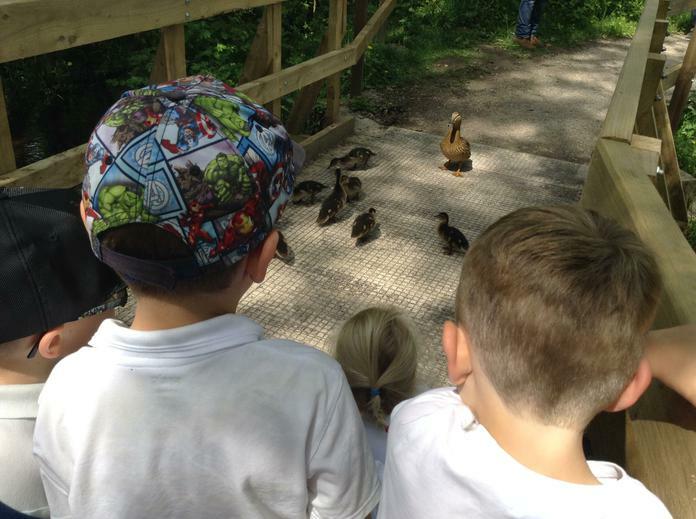 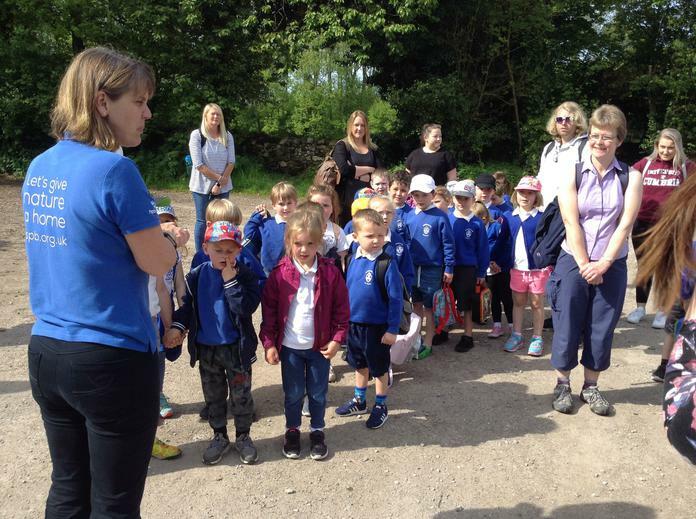 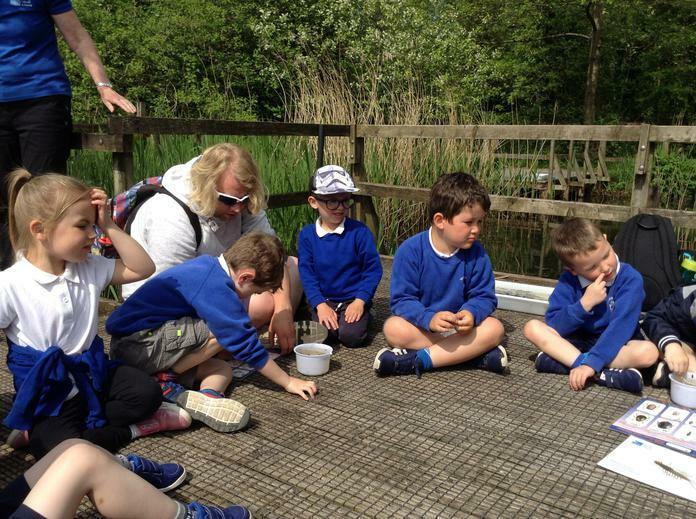 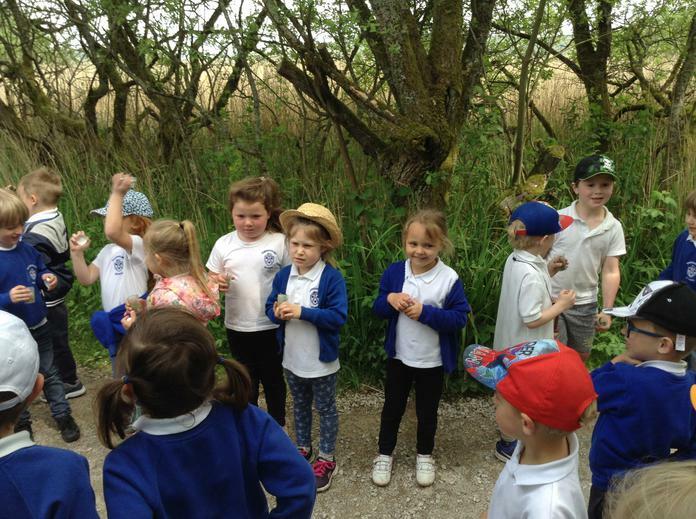 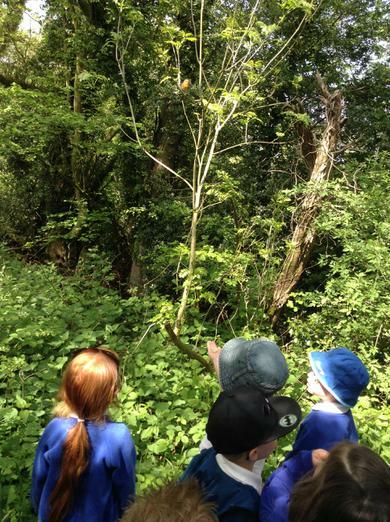 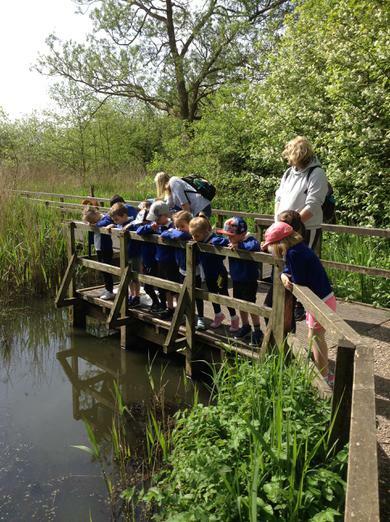 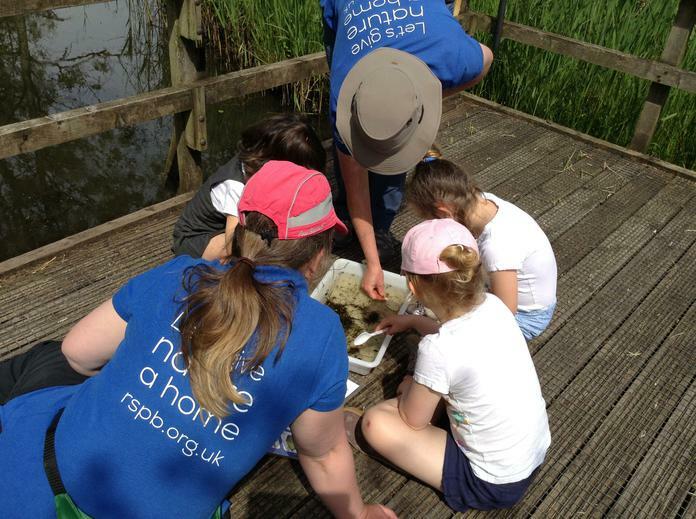 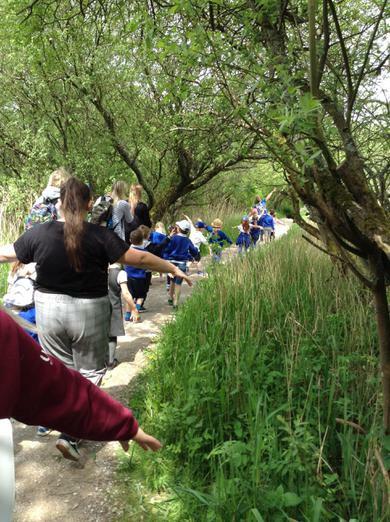 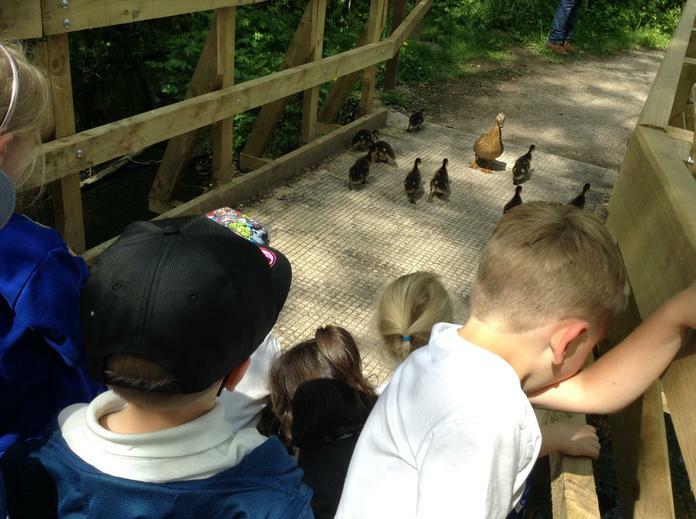 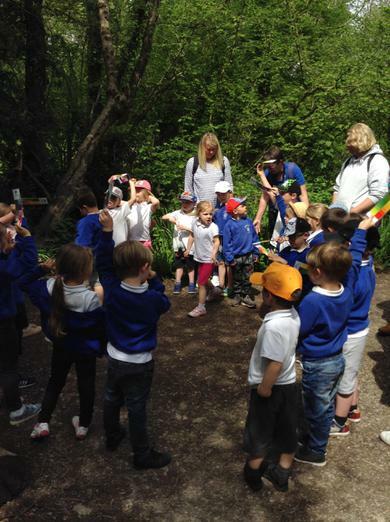 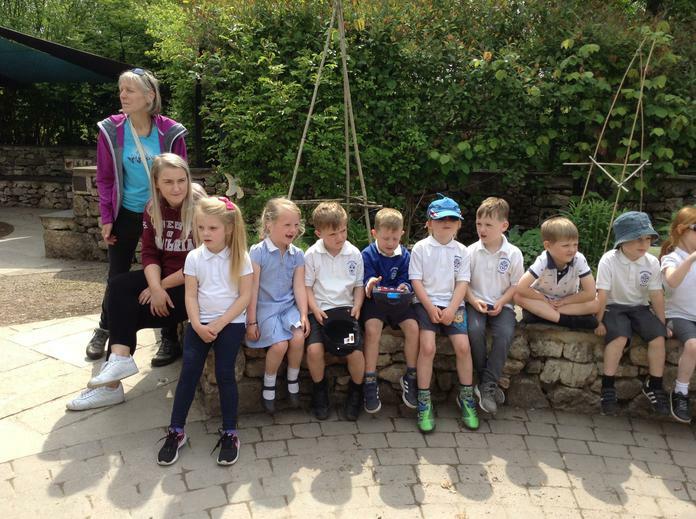 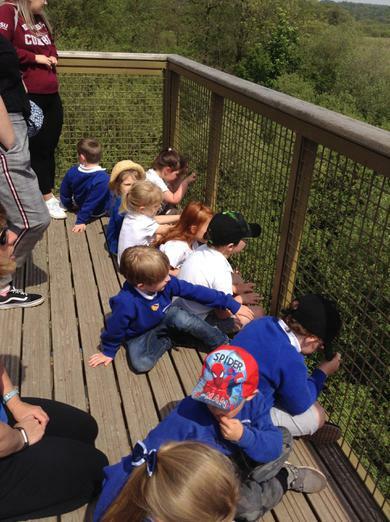 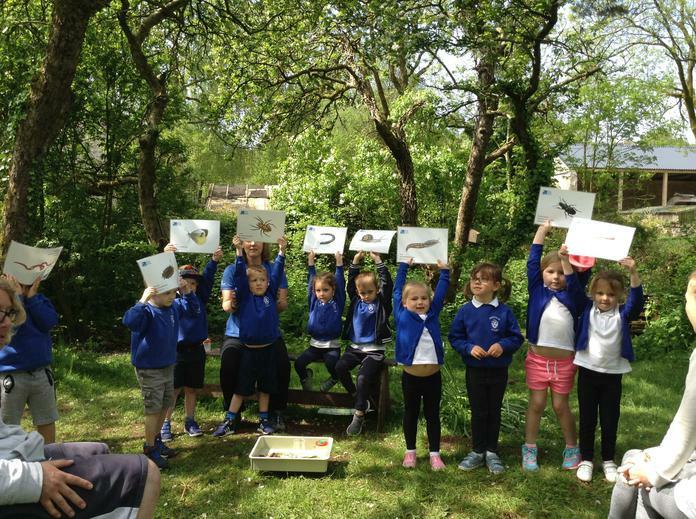 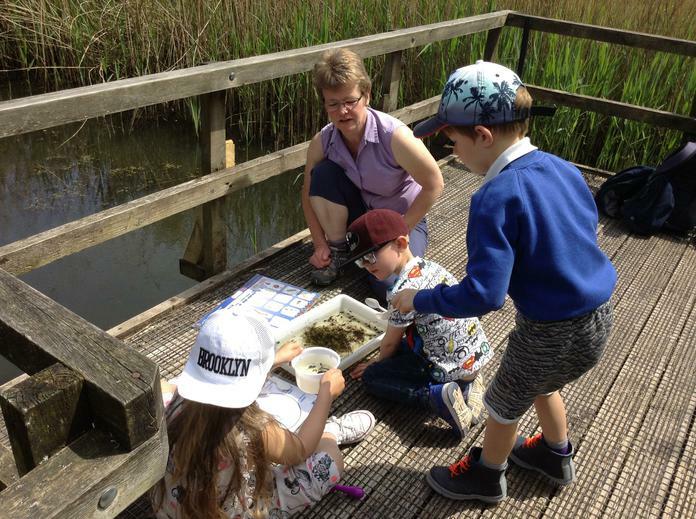 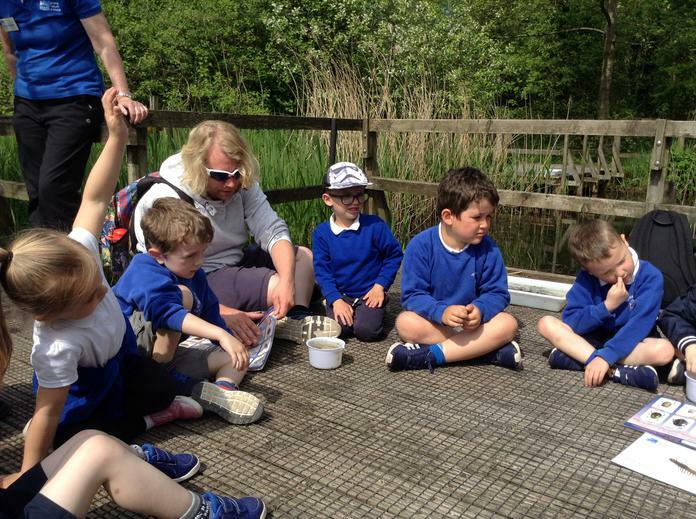 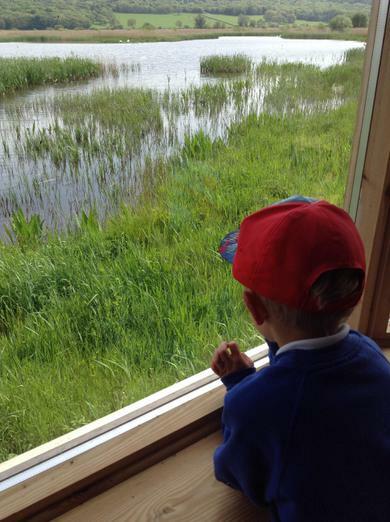 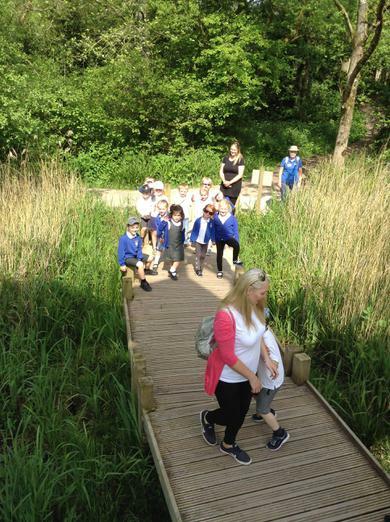 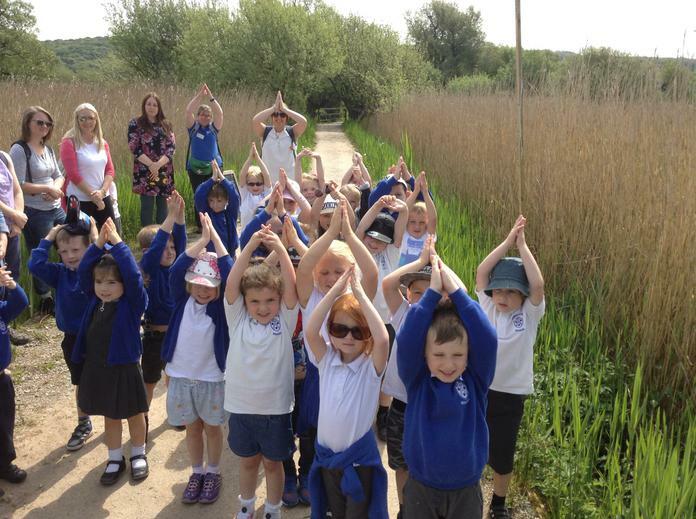 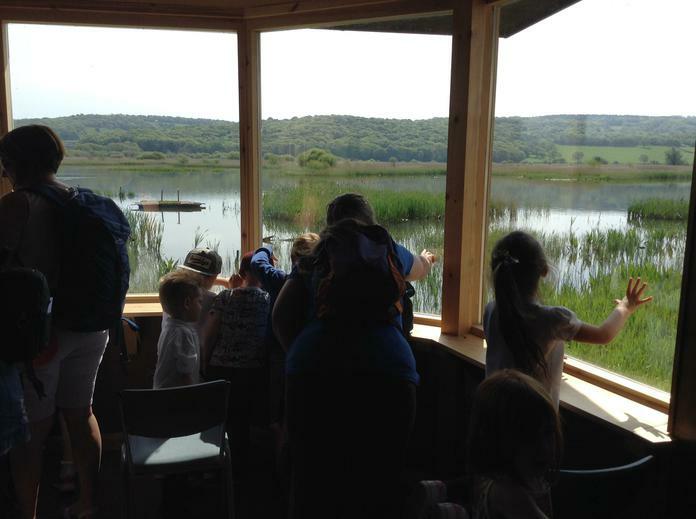 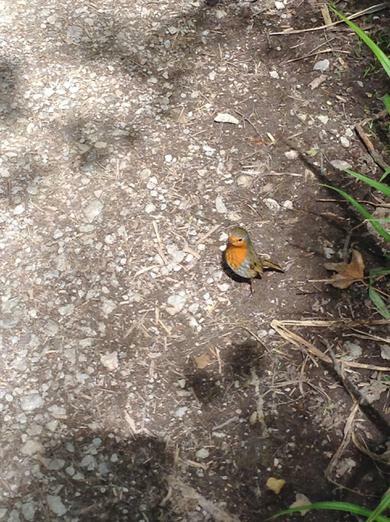 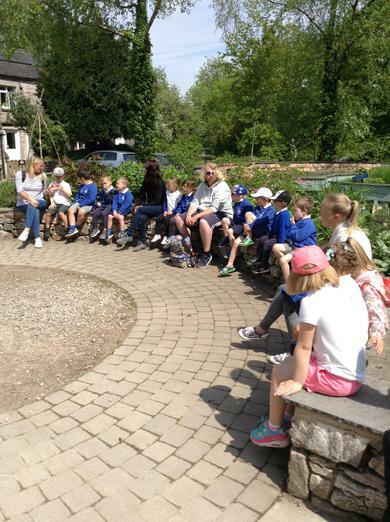 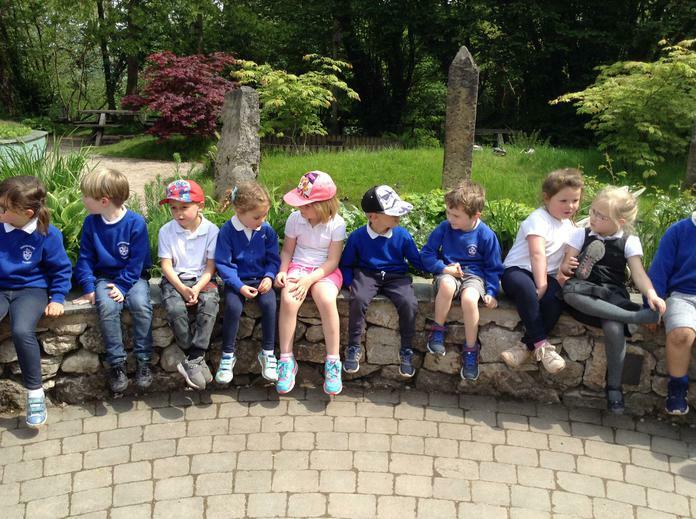 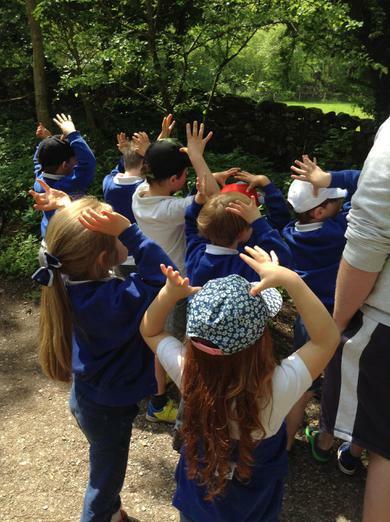 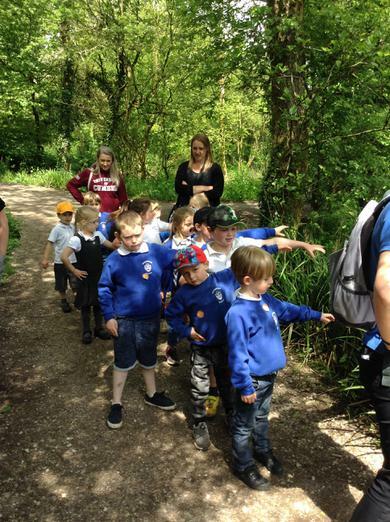 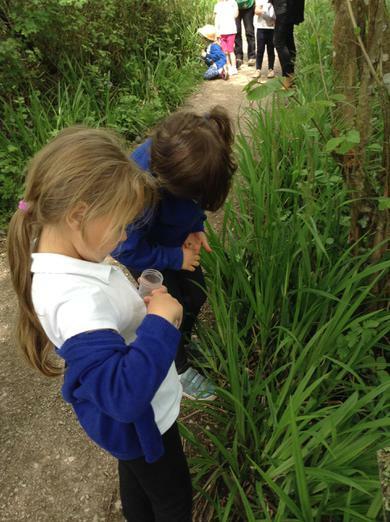 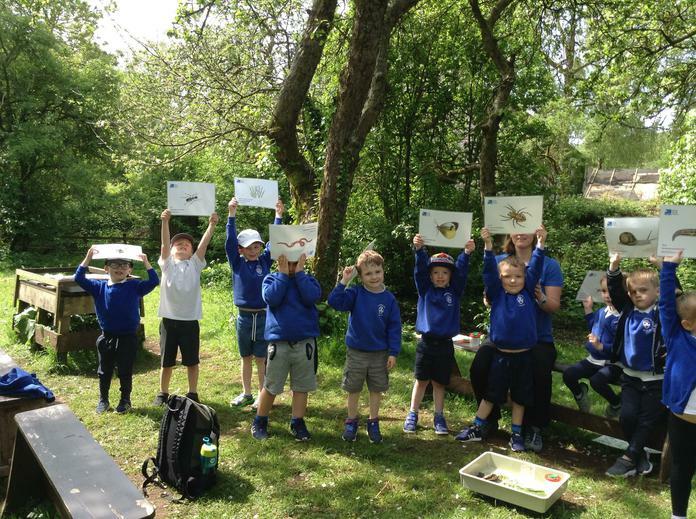 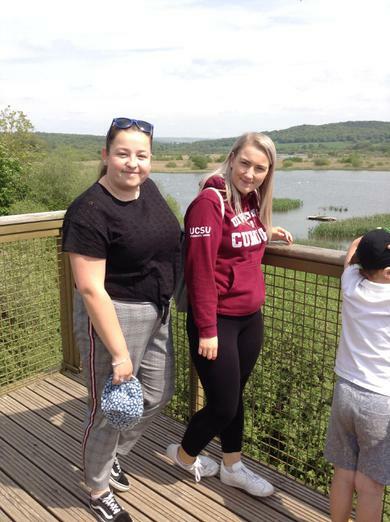 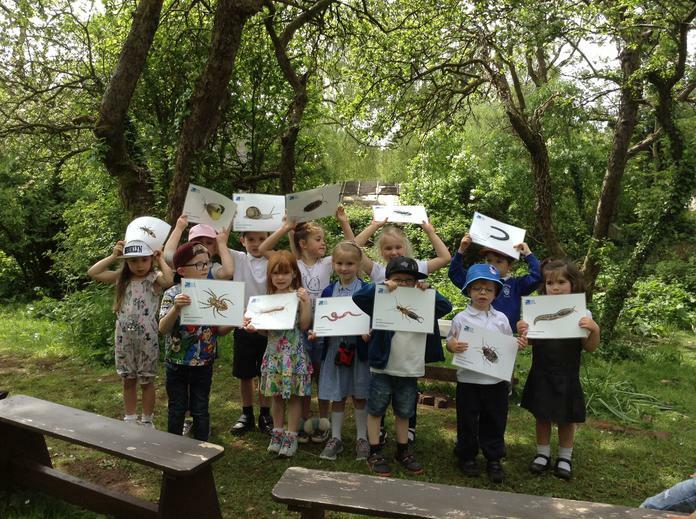 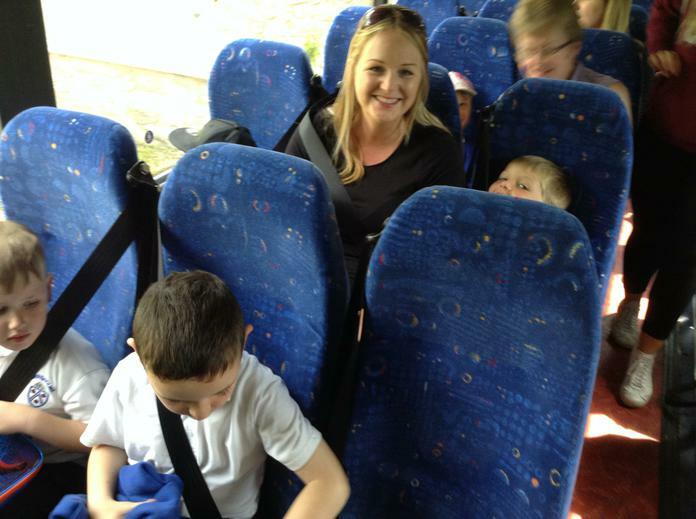 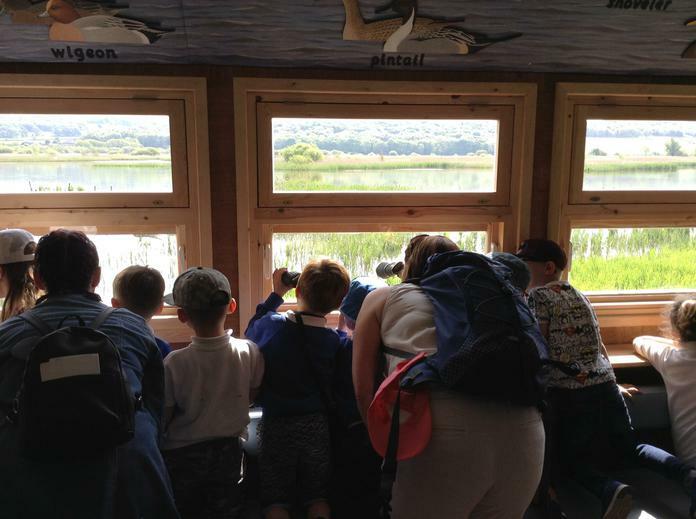 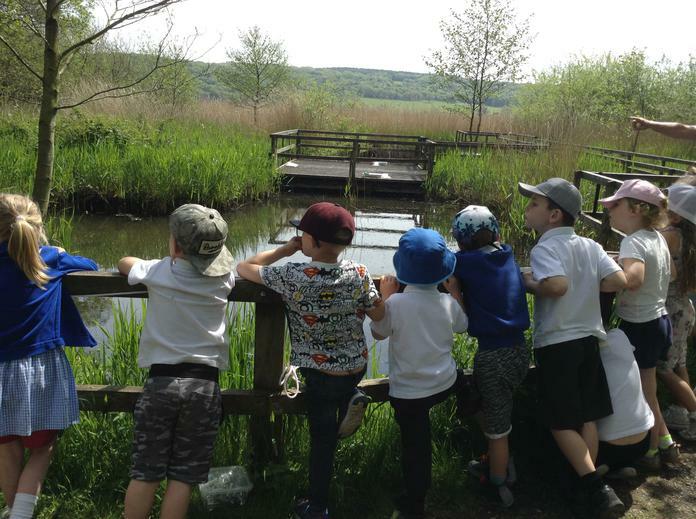 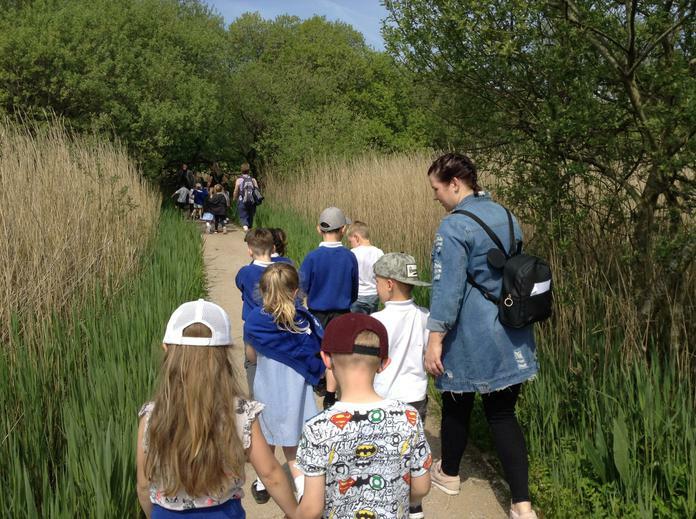 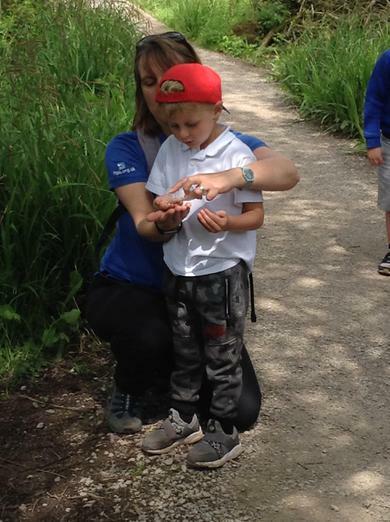 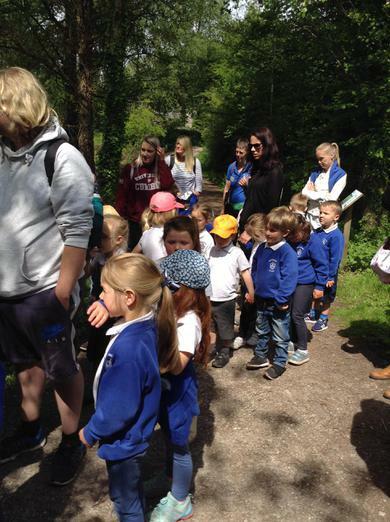 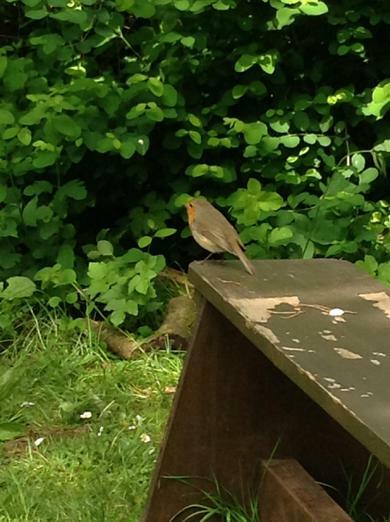 We had such a fun day learning all about wildlife at Leighton Moss! 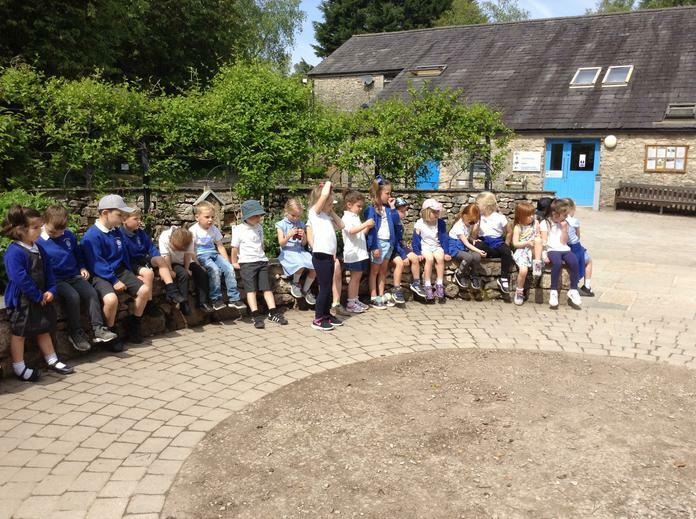 The sunshine even came out for us! 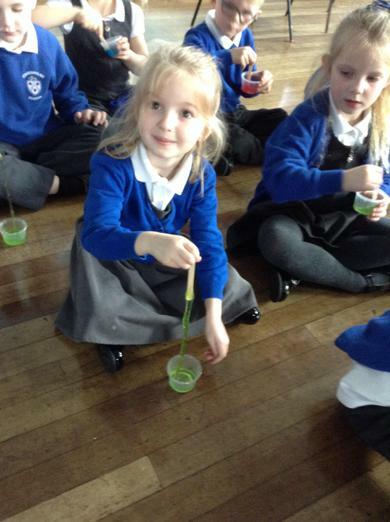 We are learning about plants and growth. 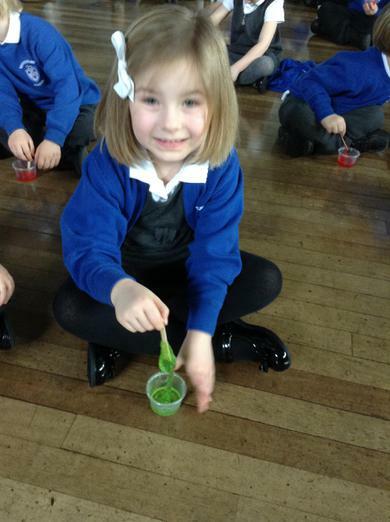 We have planted beans today. 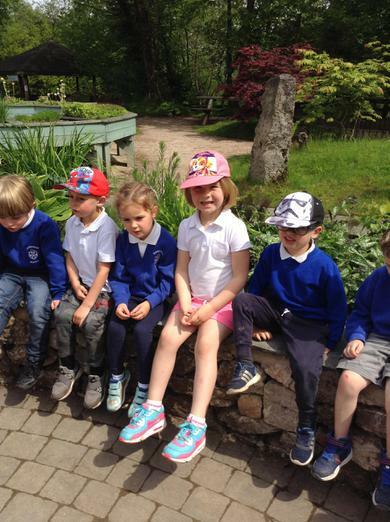 We can't wait for them start growing! 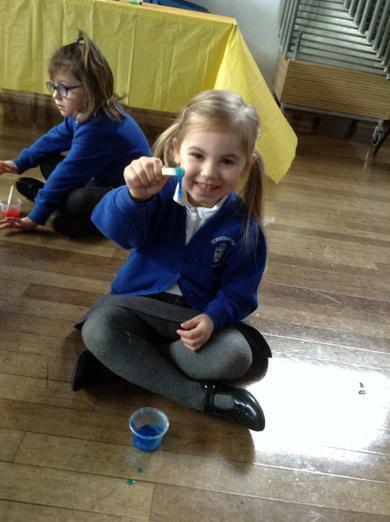 Thank you to all the parents who came to our Numicon workshop WOW day! 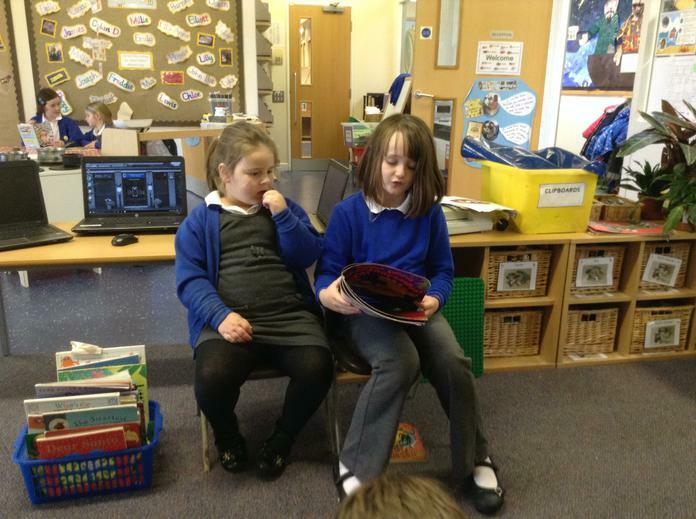 The children were so excited to share our new maths resource with you all! 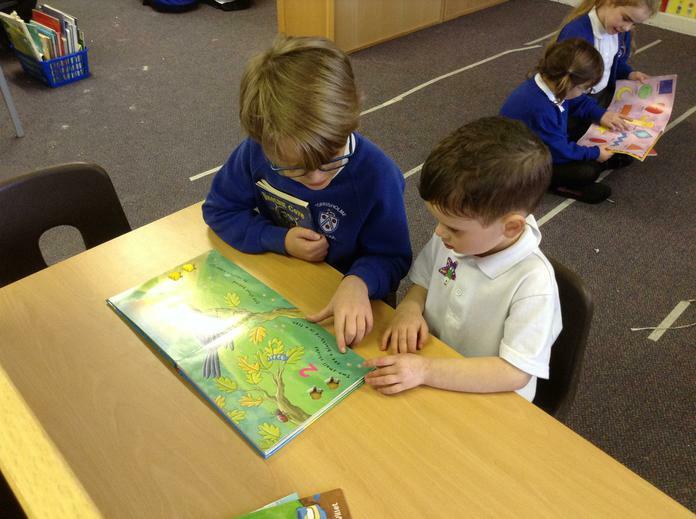 World Book Day! 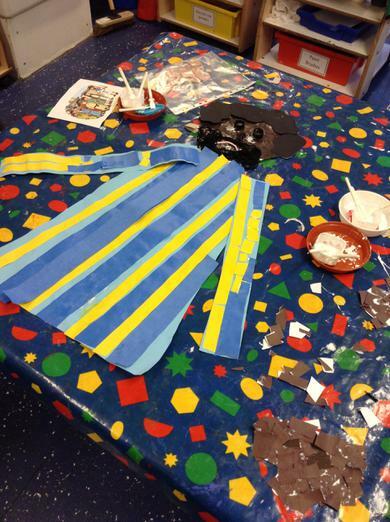 Look at all of our amazing costumes! 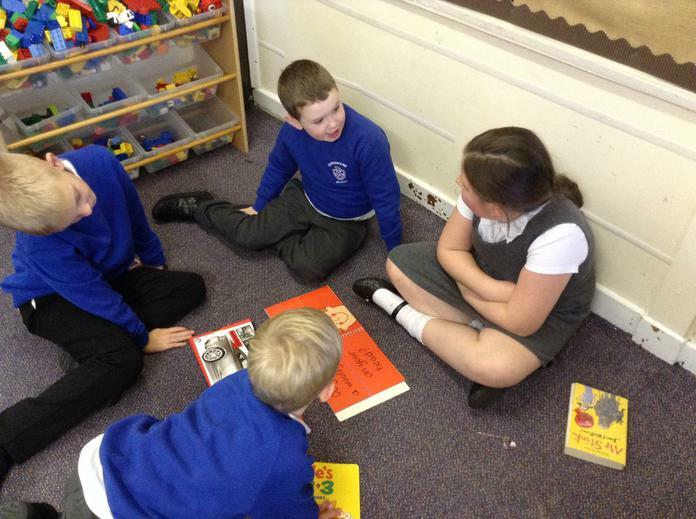 We all shared the book that our character was from. 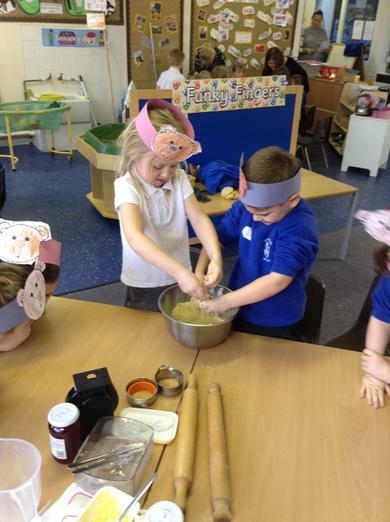 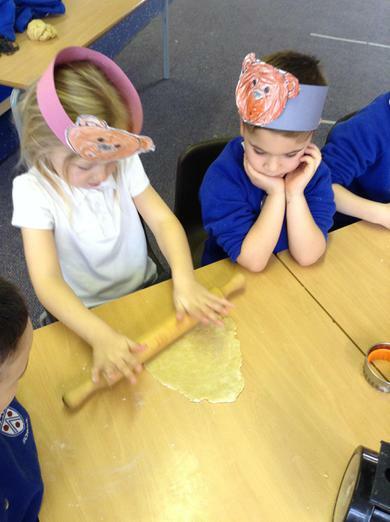 We loved baking gingerbread men after learning the story in literacy! 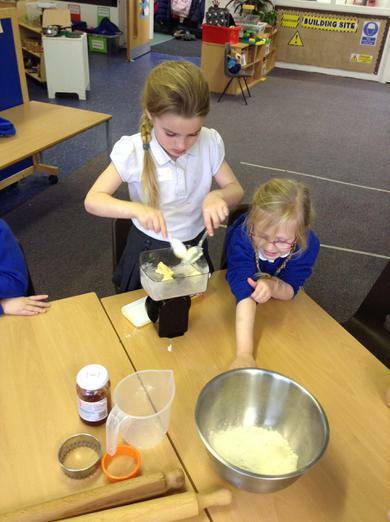 We talked about hand washing to begin, ingredients and how to follow a receipe. 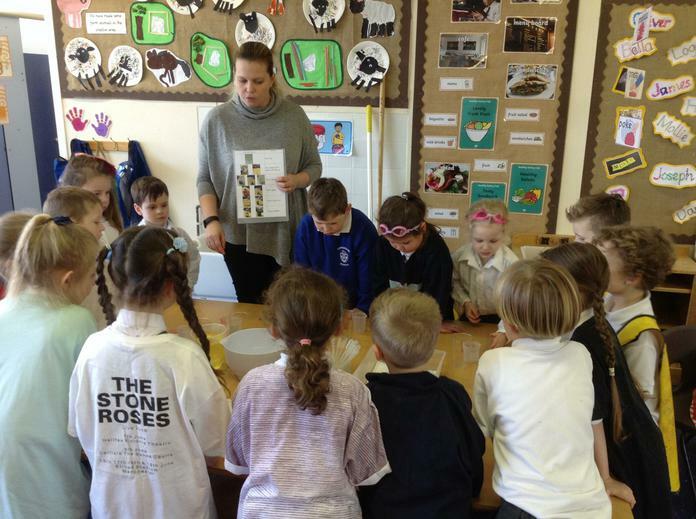 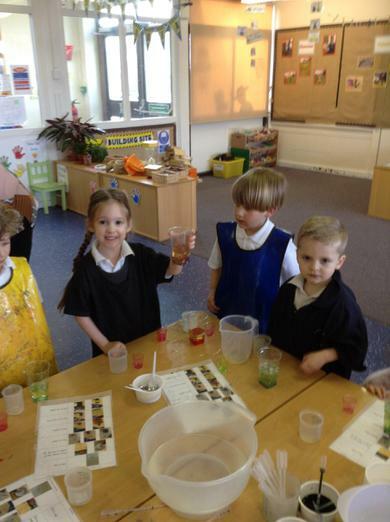 We have enjoyed exploring the bubbly colour changing reaction between vinegar and baking soda! 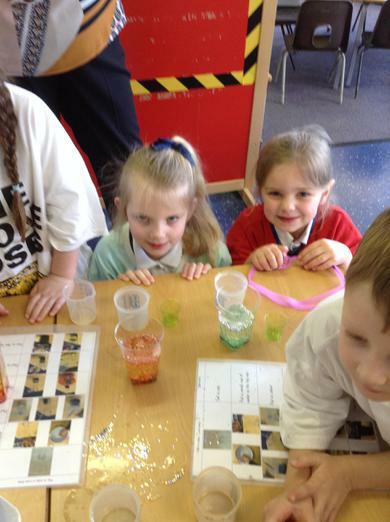 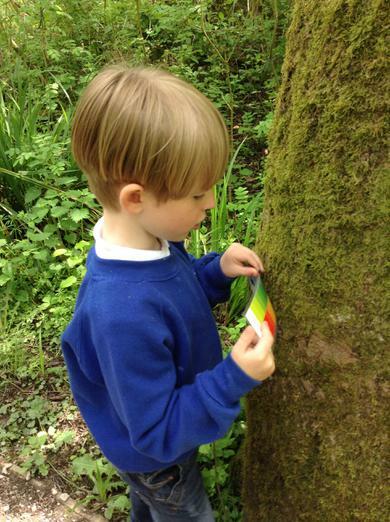 Look at our amazing rainbow pattern colour experiment! 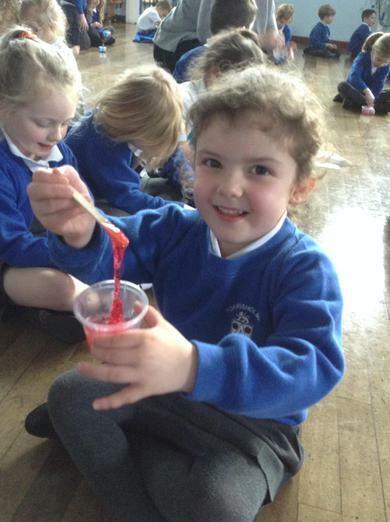 We followed instructions and measured out ingredients to make our own SLIME!! 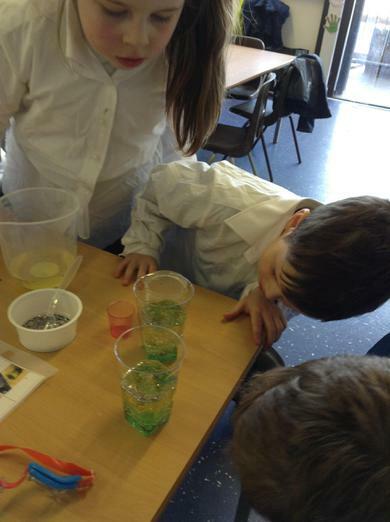 We have LOVED our first day of Science week! 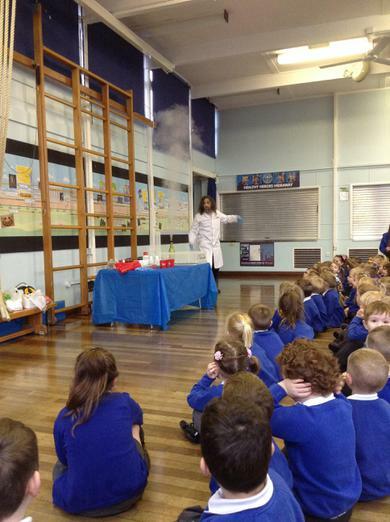 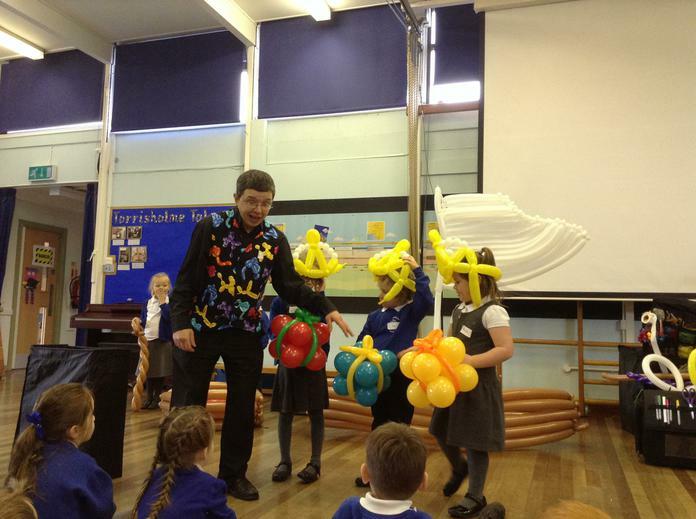 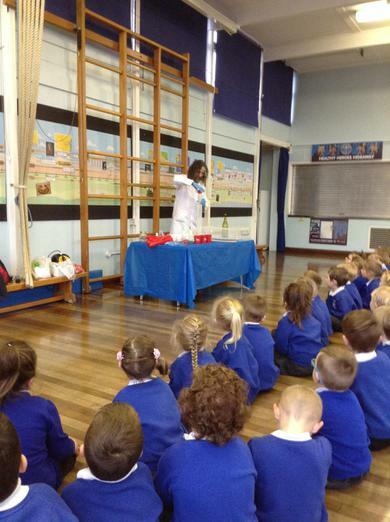 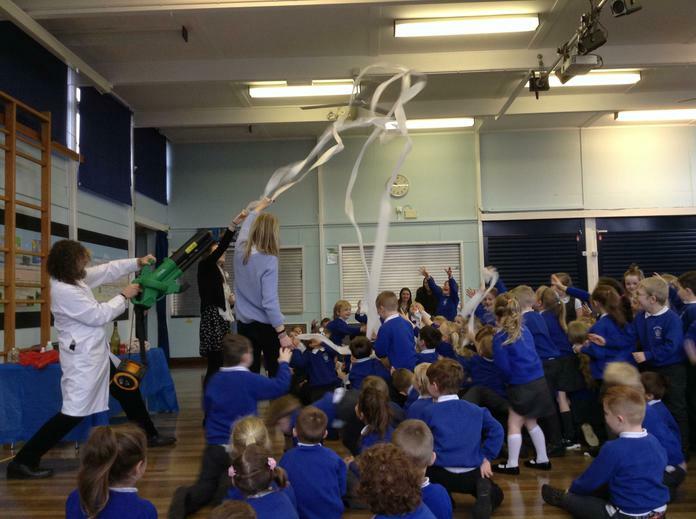 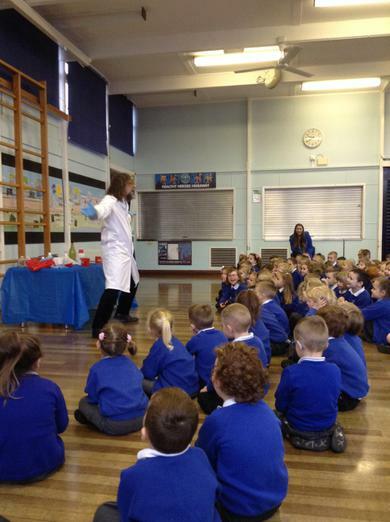 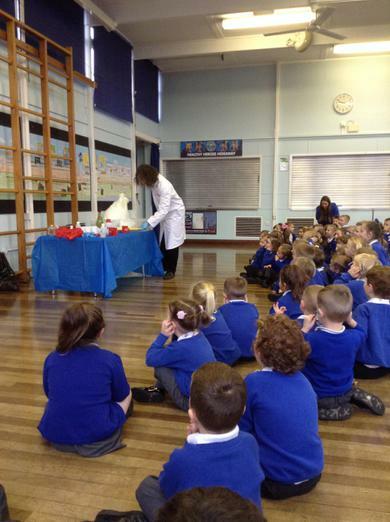 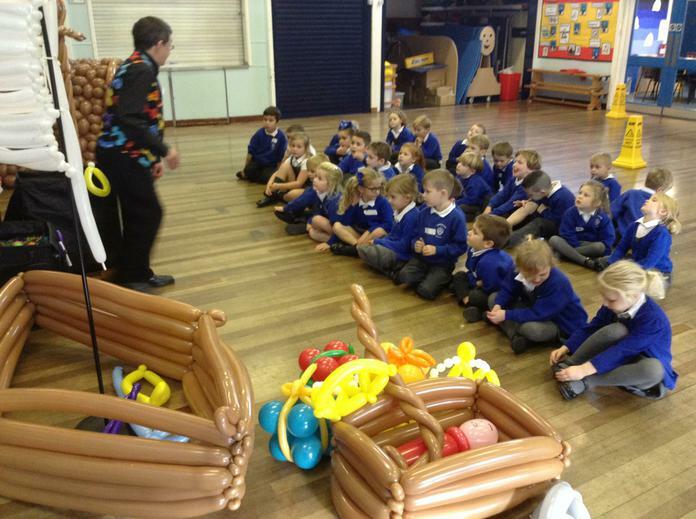 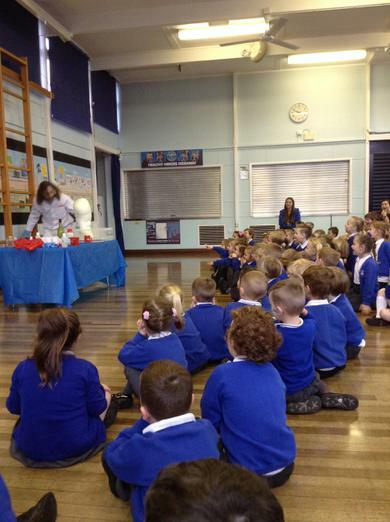 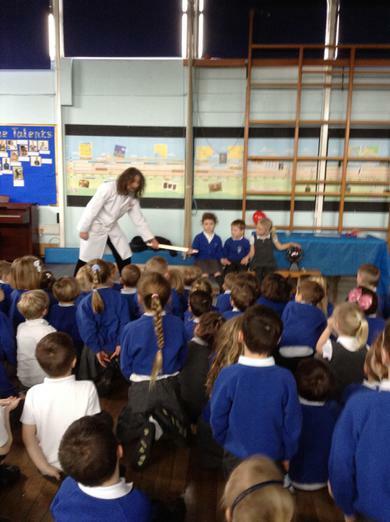 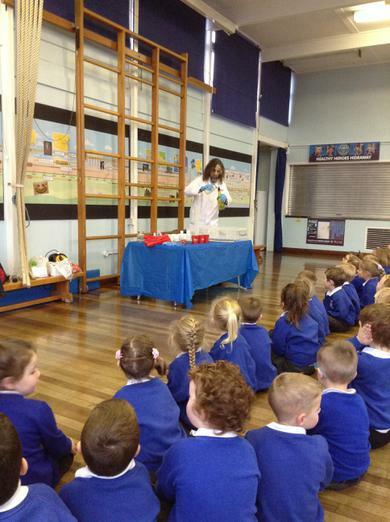 The day began with an assembly full of experiments which WOWED us. 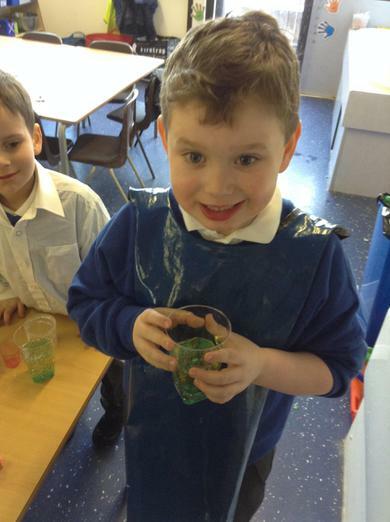 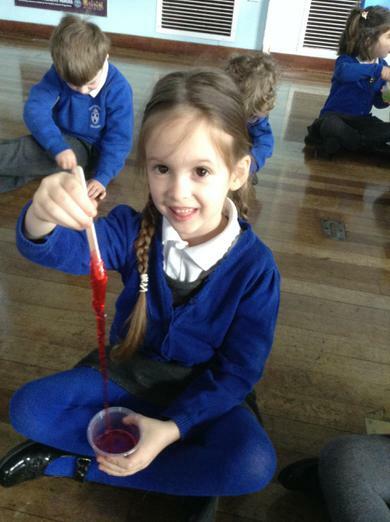 We then spent the afternoon in class making our own lava lamps, slime and other experiments! 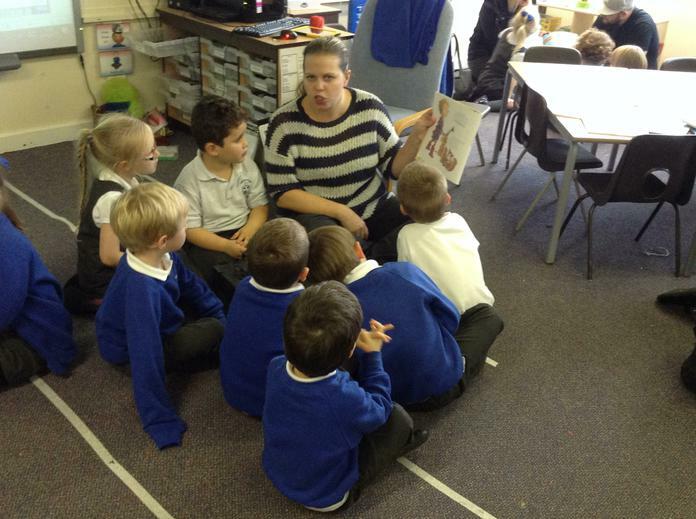 We enjoyed our 'Share a story' session today. 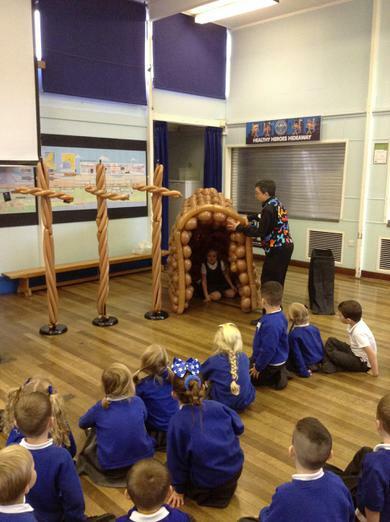 Thanks to all parents/grandparents that attended. 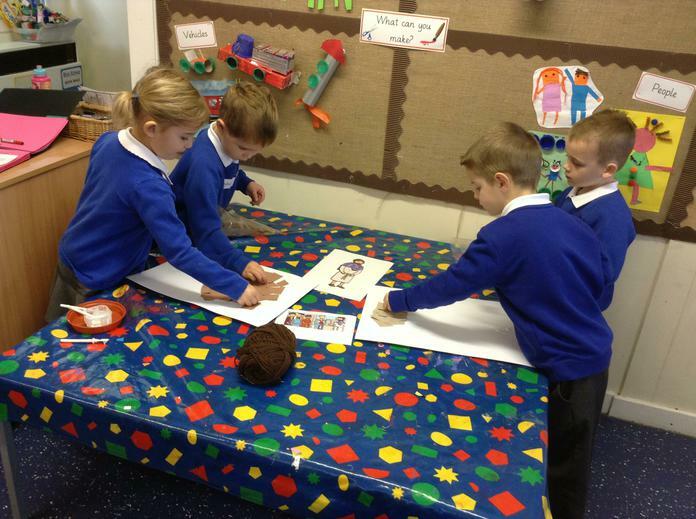 We have been using the computers to draw our own monster creations. 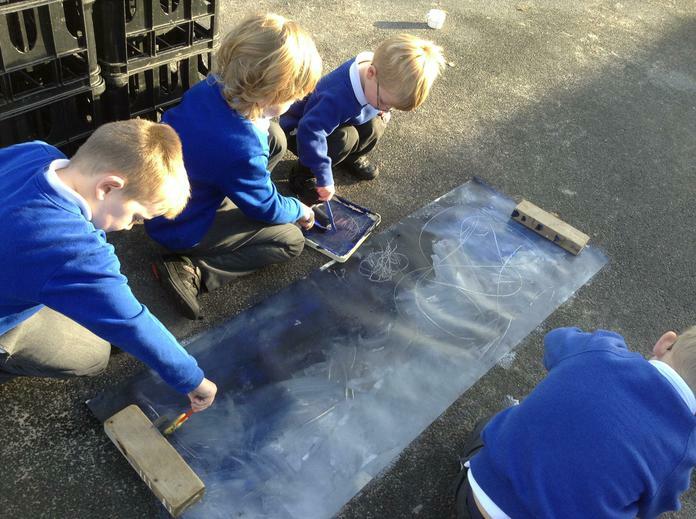 We can use the different tools to drag shapes, draw and choose colours. 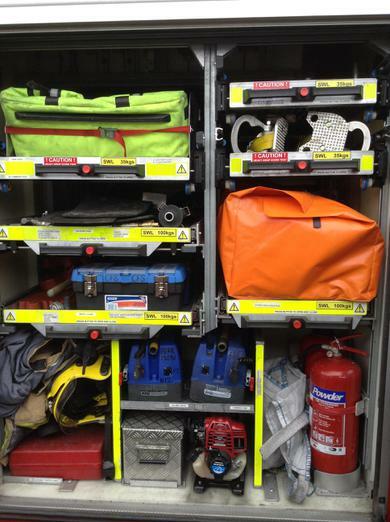 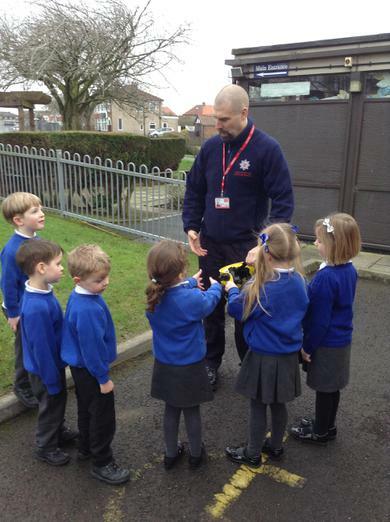 As part of our 'People who help us' topic we enjoyed a visit from a paramedic. 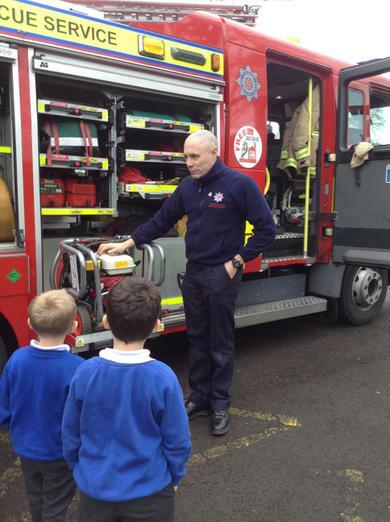 He talked to us about how he helps us and we even got to see an ambulance car! 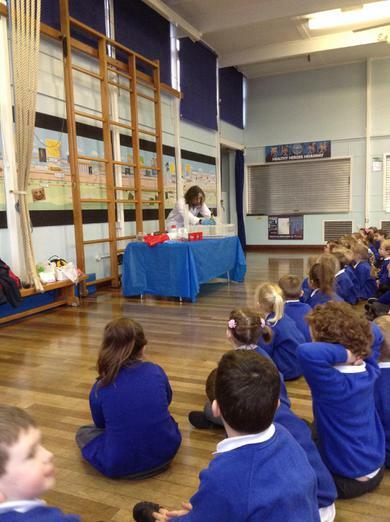 We are learning about dental health! 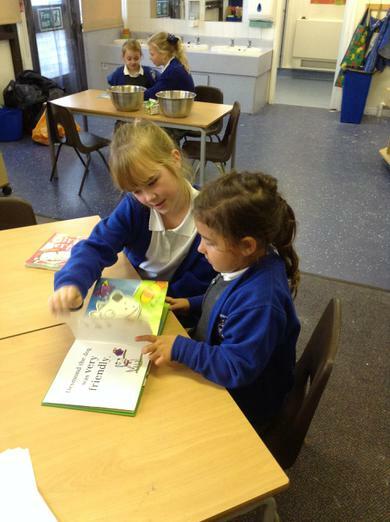 We have really enjoyed our new dentist role play area! 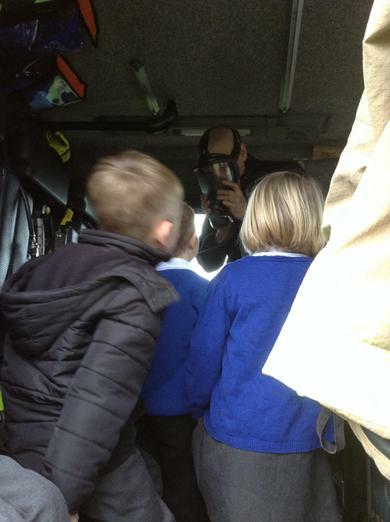 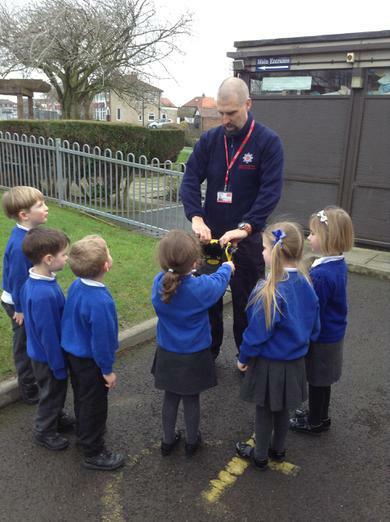 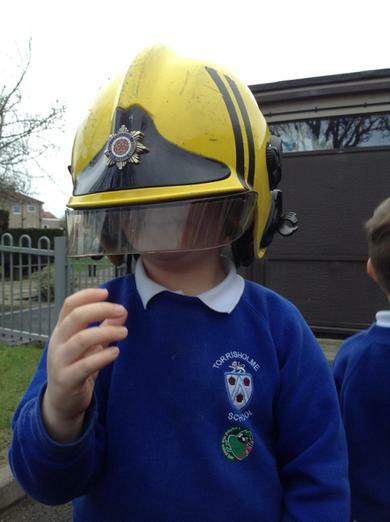 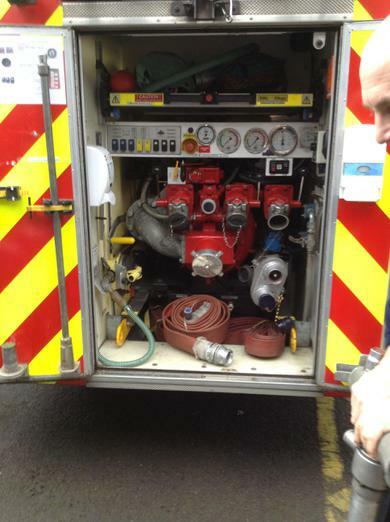 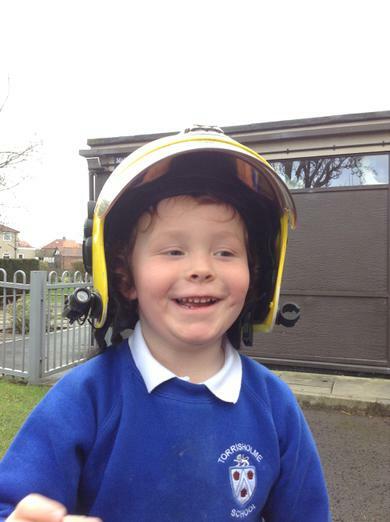 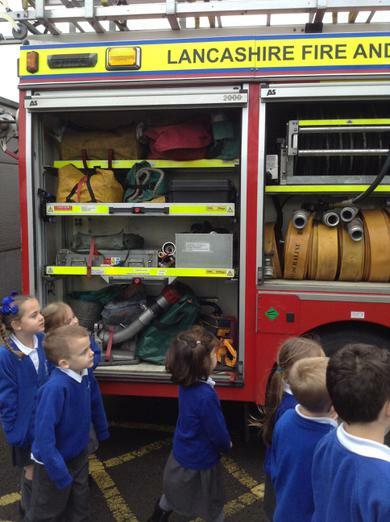 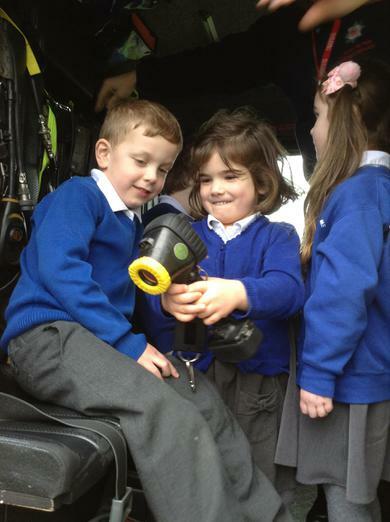 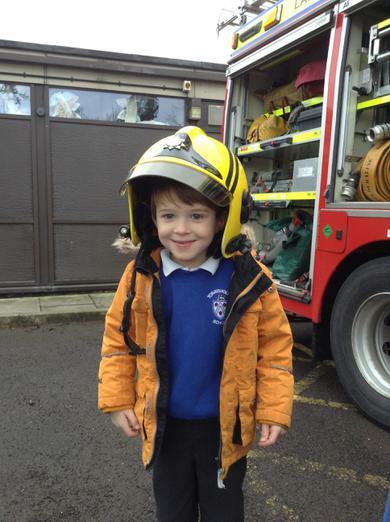 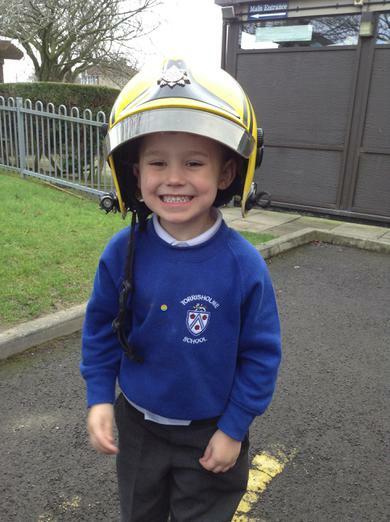 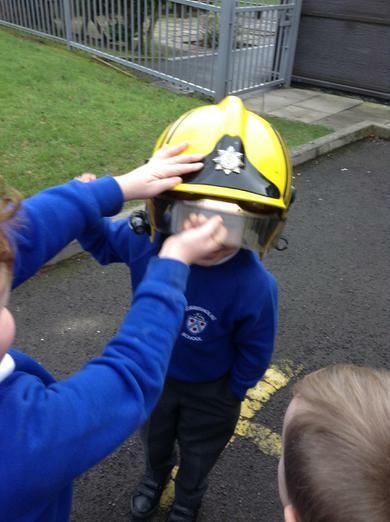 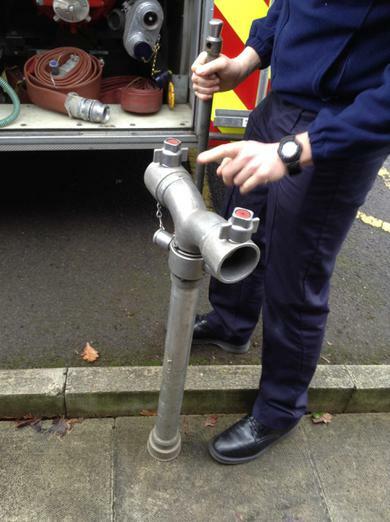 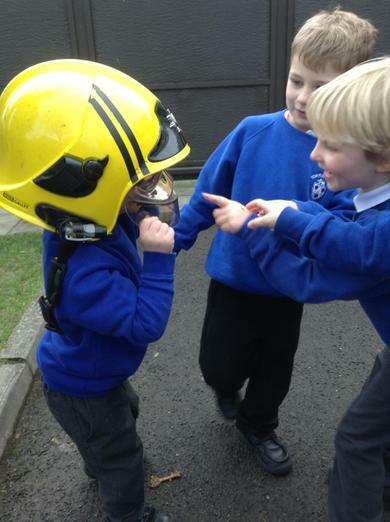 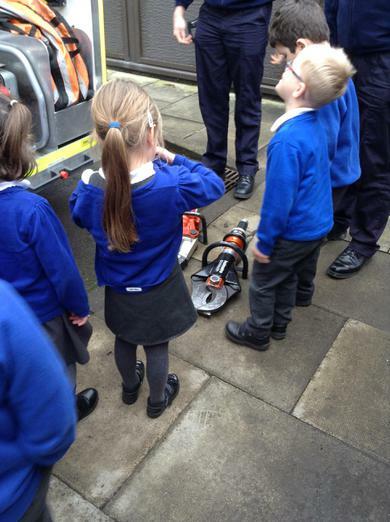 We have been learning about 'People Who Help Us' and really enjoyed our visit from the firefighters today! 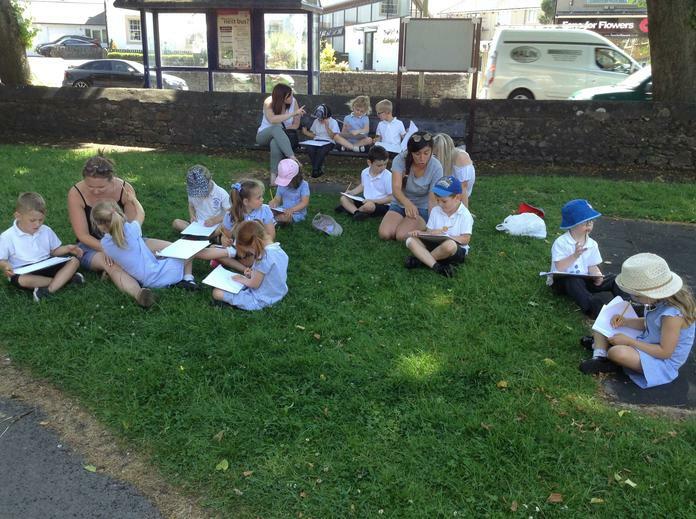 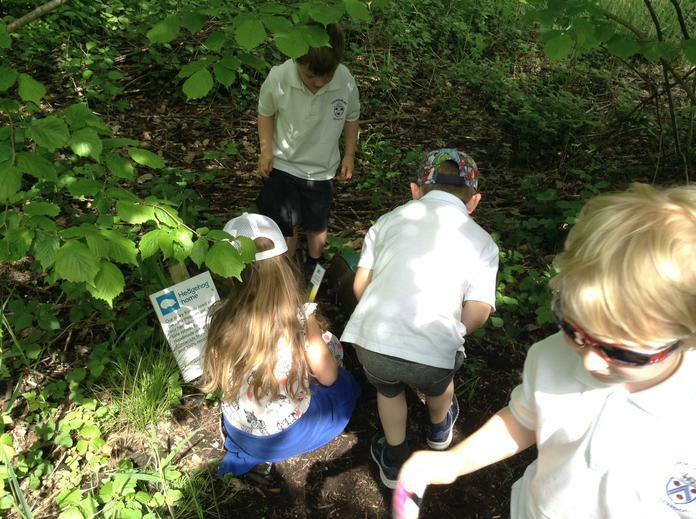 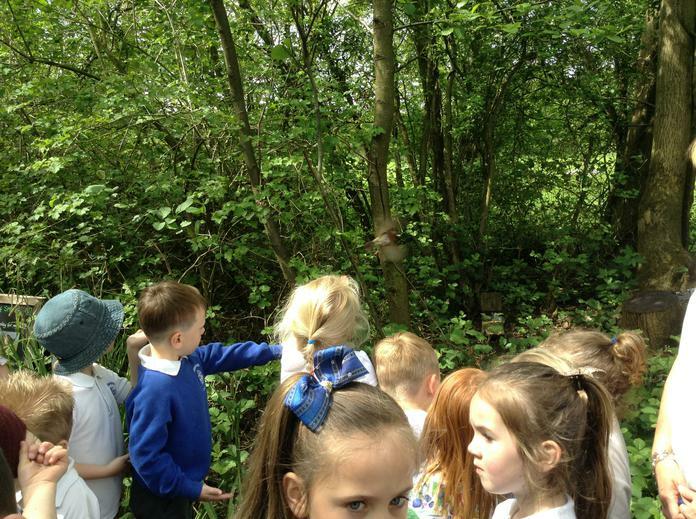 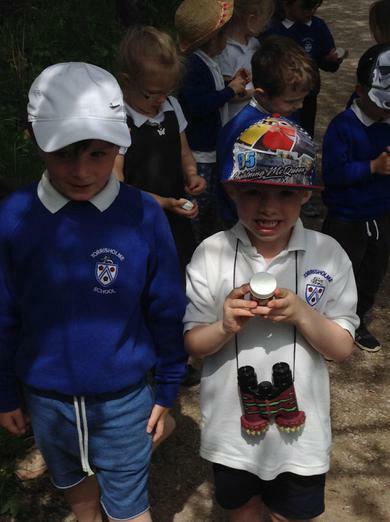 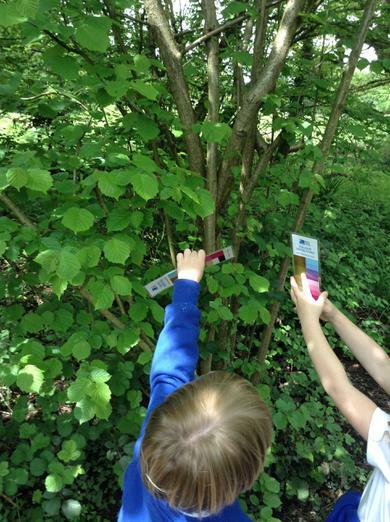 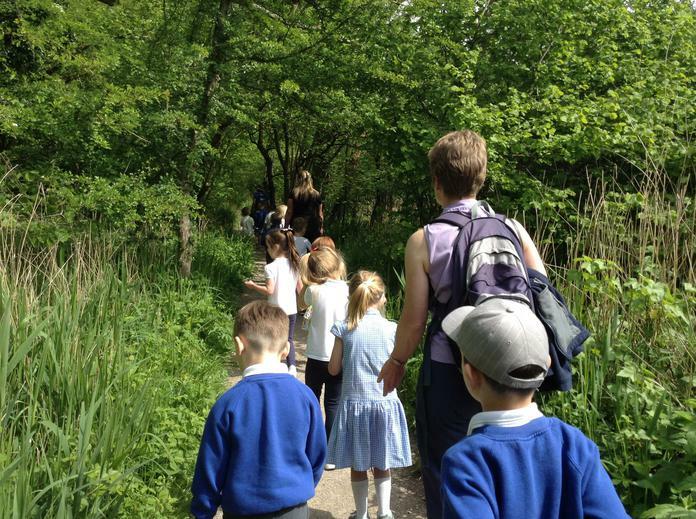 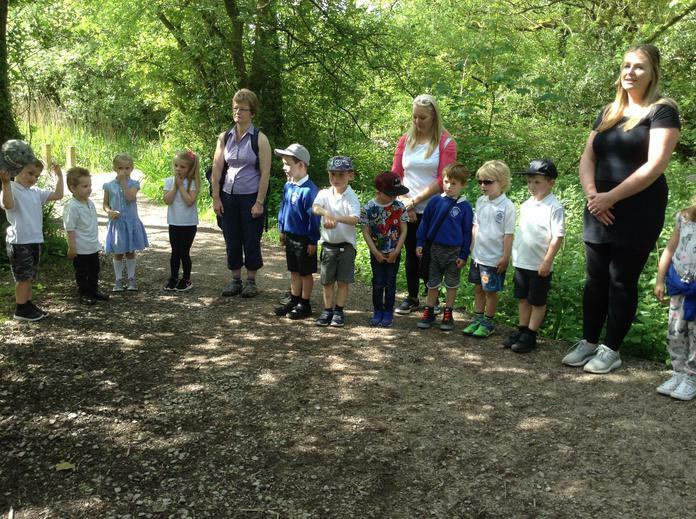 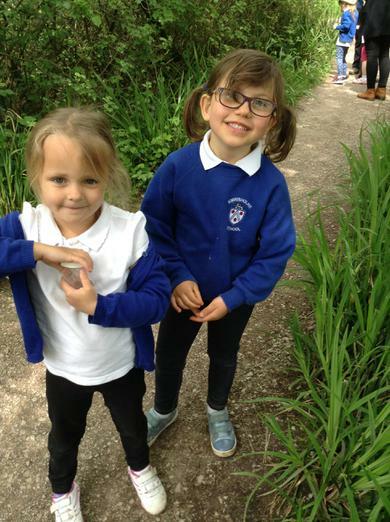 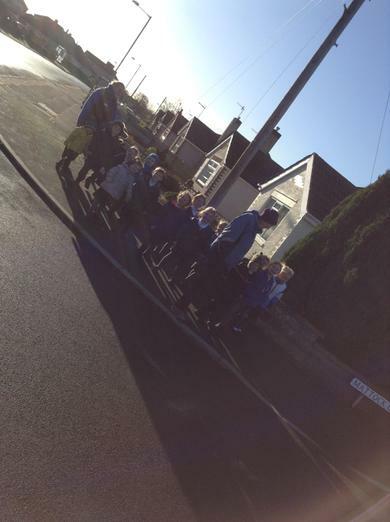 We have been on a walk around Torrisholme discussing our local environment. 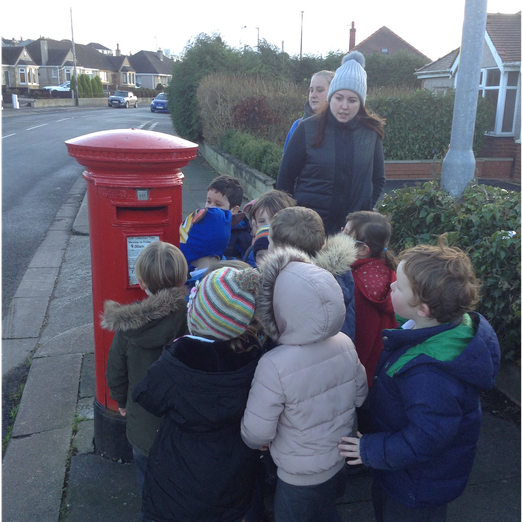 We talked about road signs, road markings, the mini roundabout, shops, cash machine, churches, vehicles and lots more! 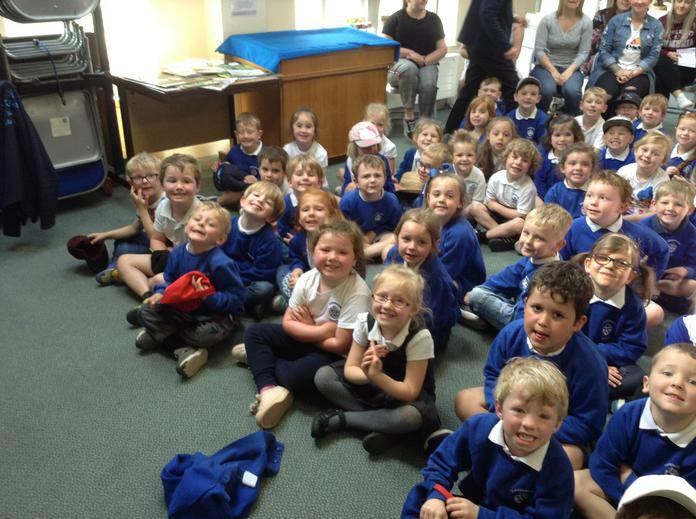 How amazing do we all look in our Nursery Rhyme/ Poem costumes? 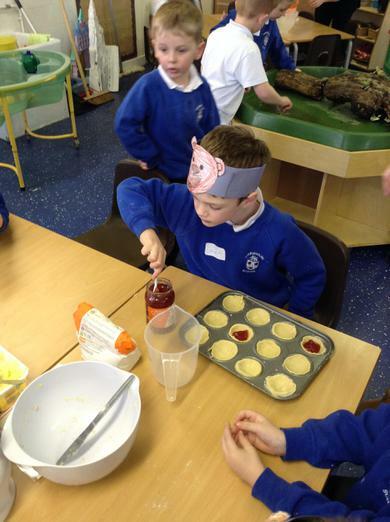 We read the nursery rhyme 'The Queen of Hearts' and then made our own jam tarts. 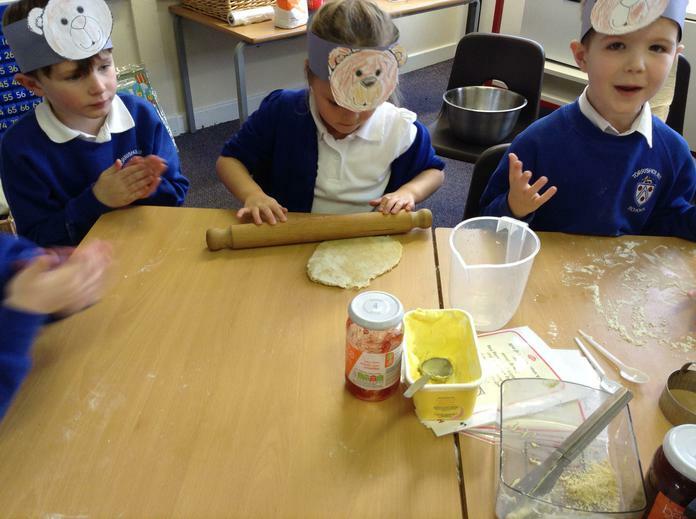 They were great fun to make and they tasted yummy! 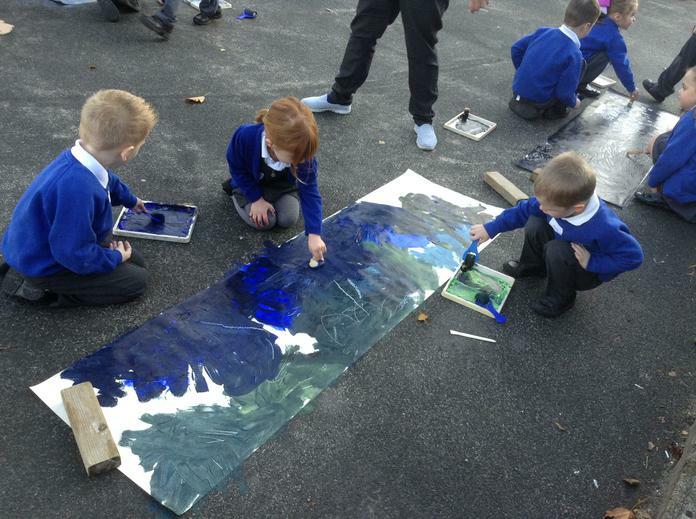 We have been learning how to add white to a colour to create different shades. 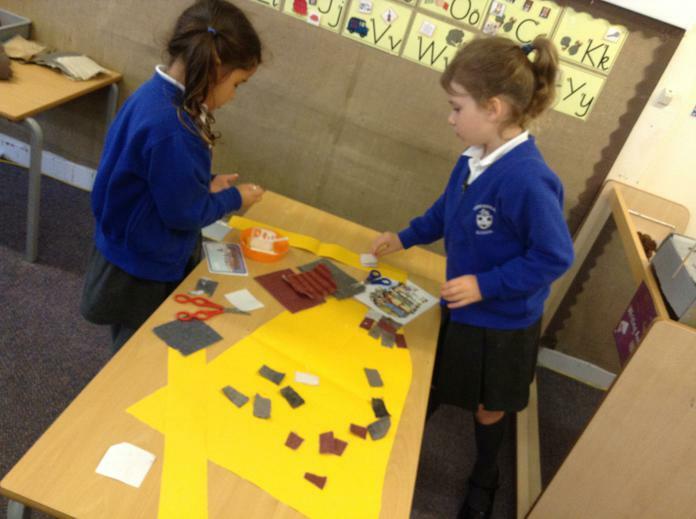 We are going to use our shade pieces to create an Incy Wincy Spider display. 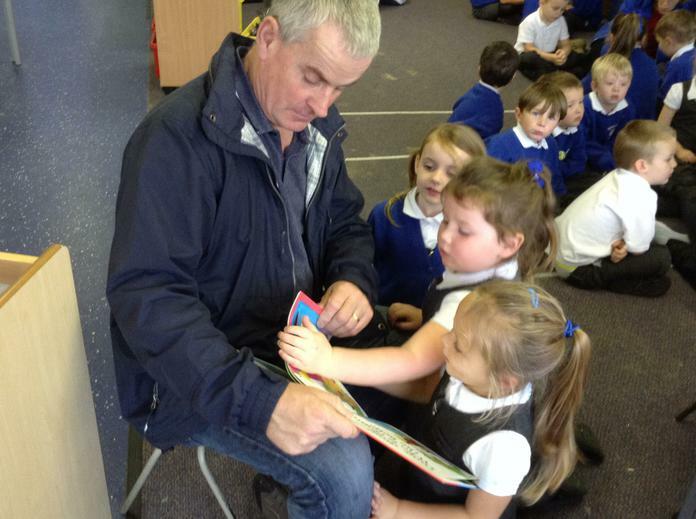 We enjoyed a visit from author Andy Tooze to kick start our whole school poetry week. 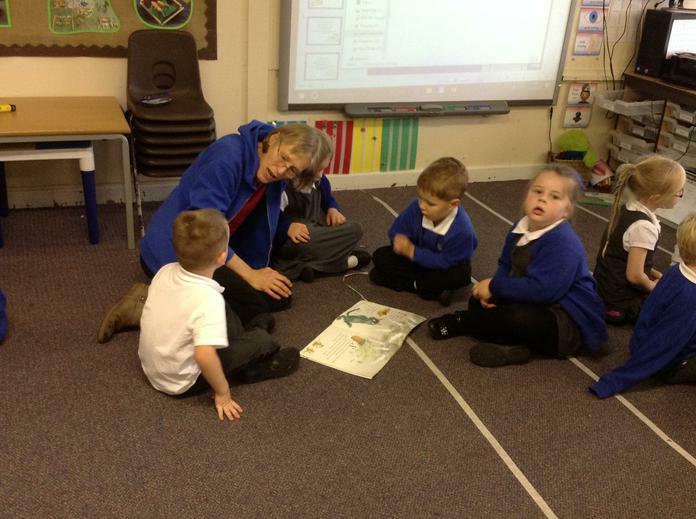 We enjoyed a special Christmas visit from Debbie who told us all about the story of Christmas. 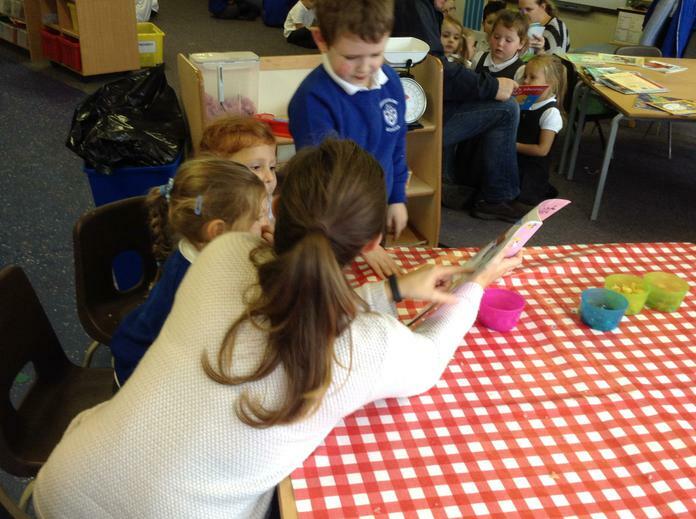 We loved joining in with the songs and the puppets were great! 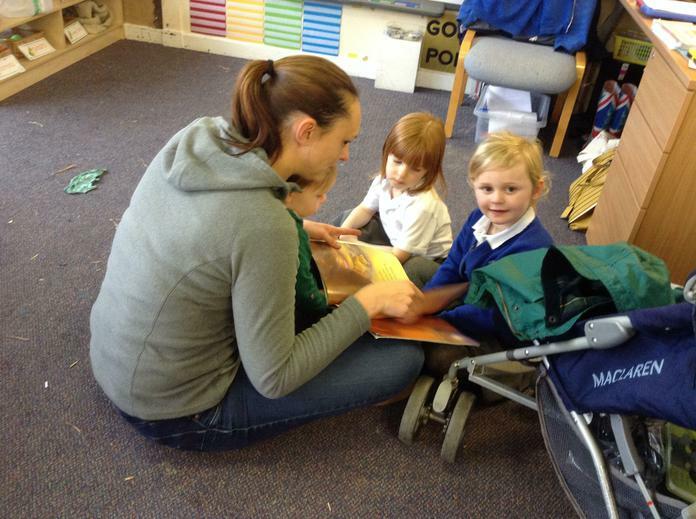 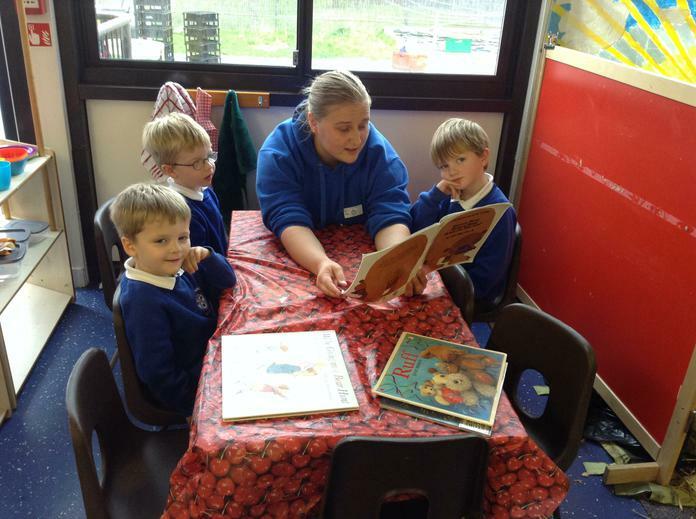 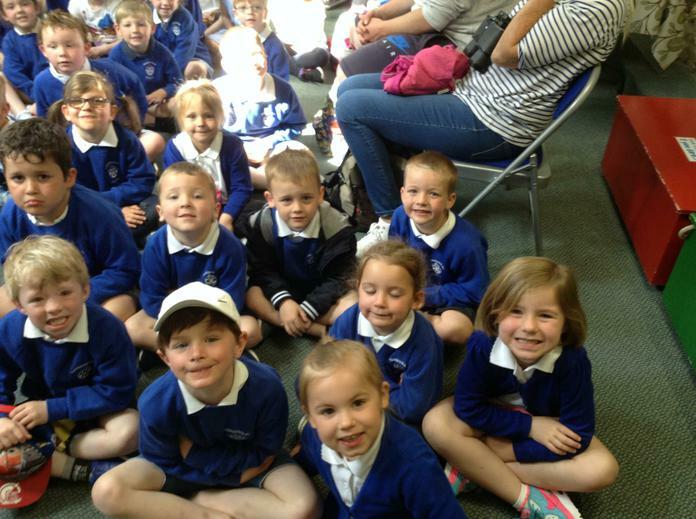 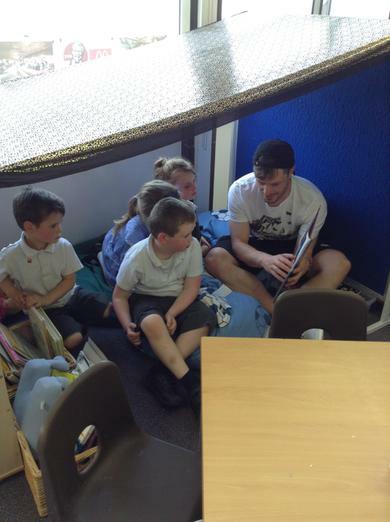 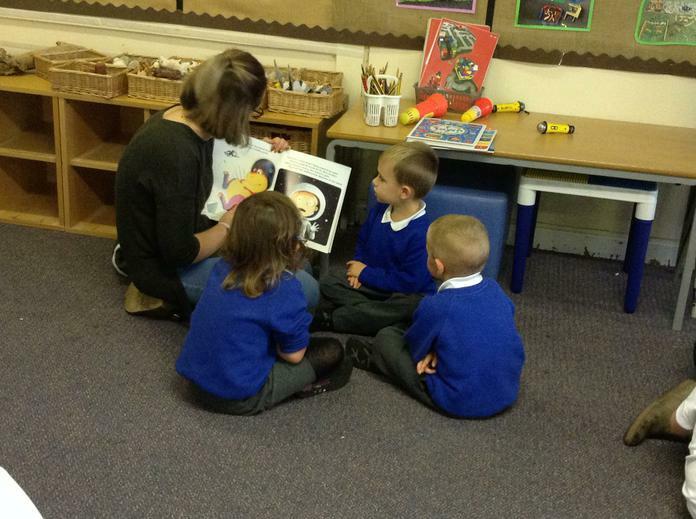 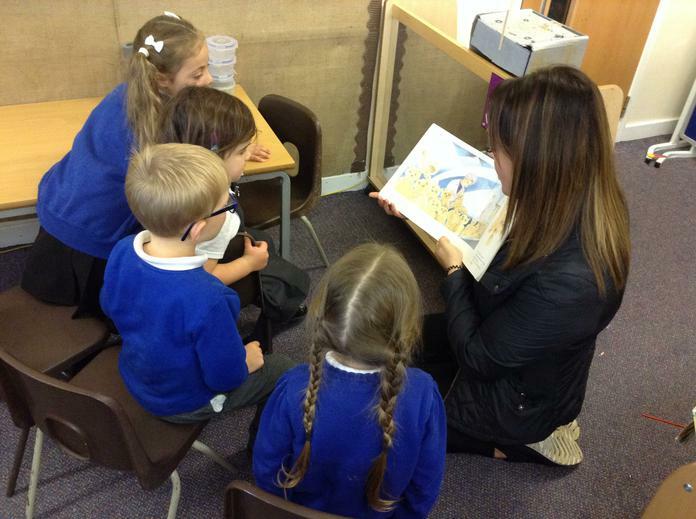 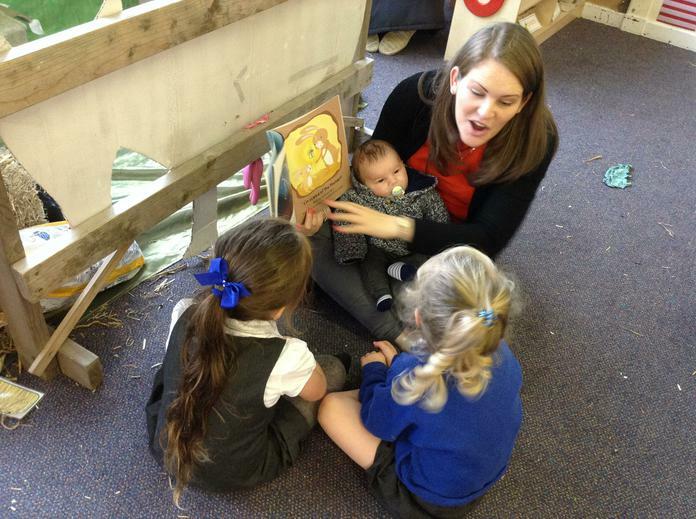 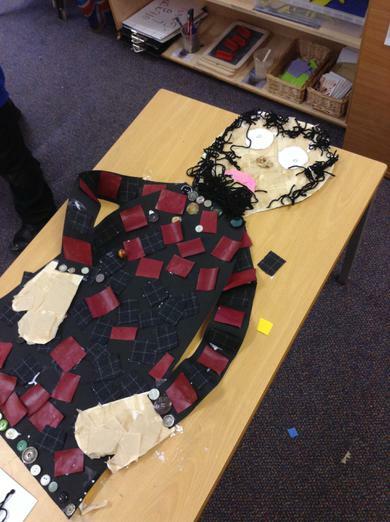 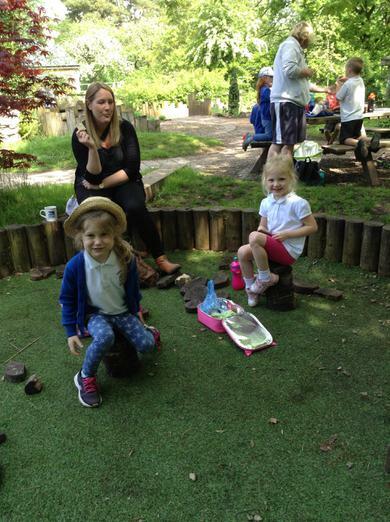 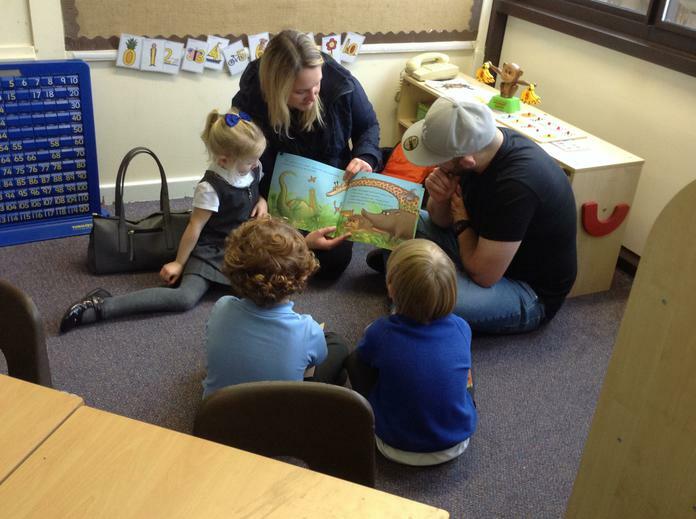 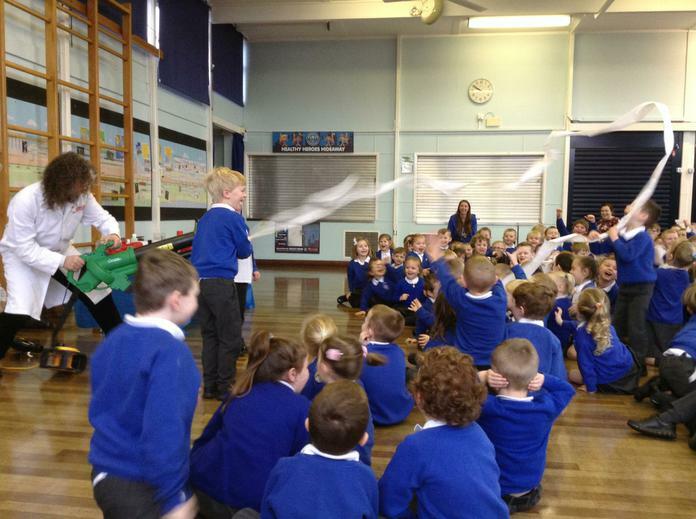 We loved our recent 'Share a story' session. 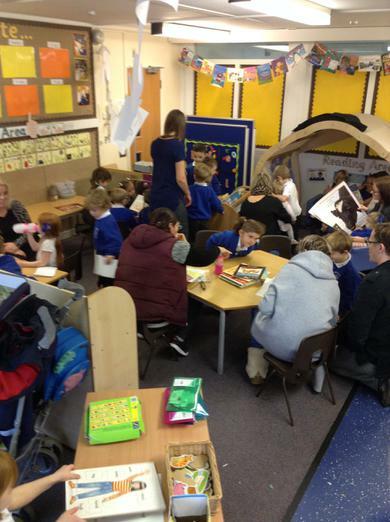 Thanks to all the parents and helpers that came! 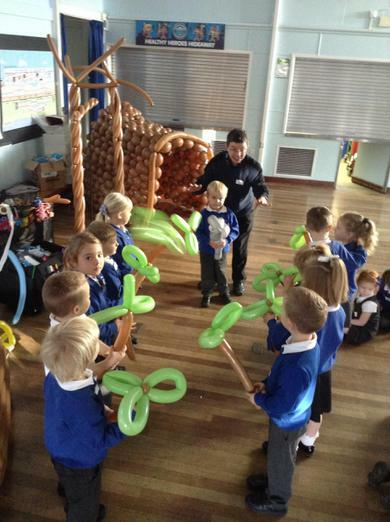 Look at our reindeers! 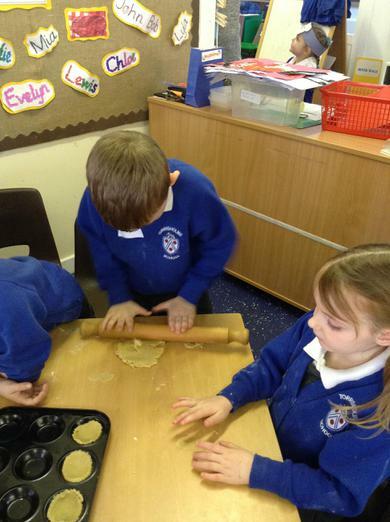 We have been using cinnamon smelling play dough to make them! 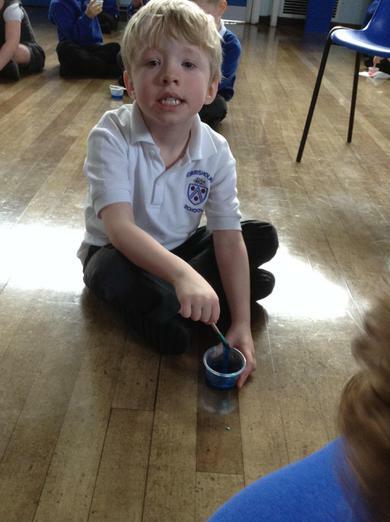 We have been practising our throwing and catching skills in PE lessons. 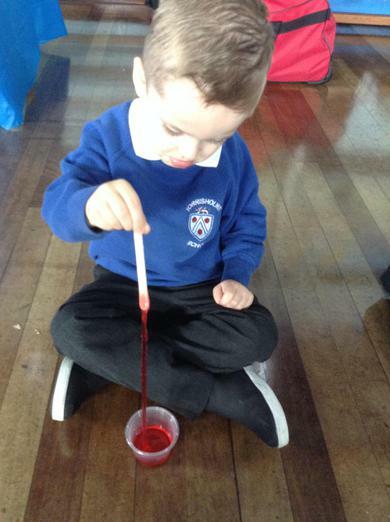 This is a great activity for you to practise at home! 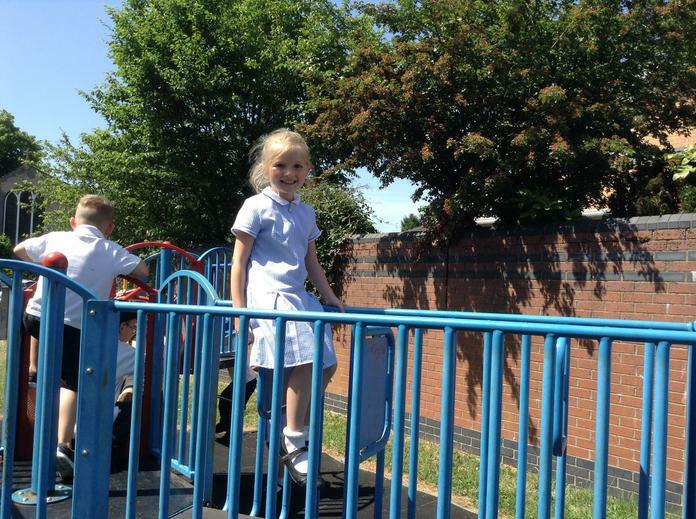 These skills become very important when the children start to play games involving throwing and catching. 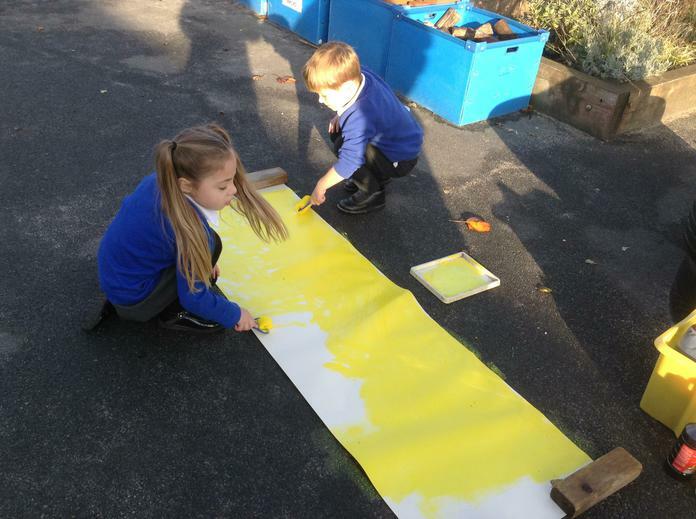 We have been painting pictures of the characters from the Nativity story. 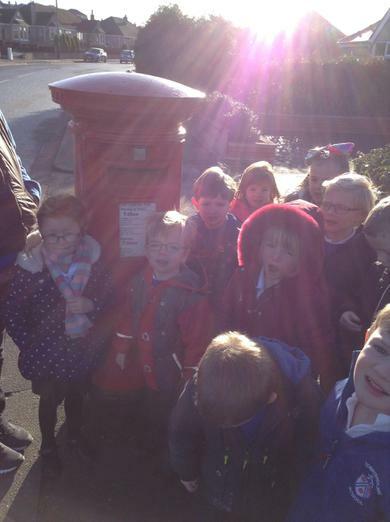 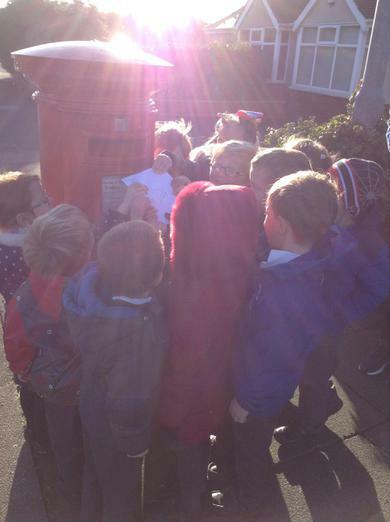 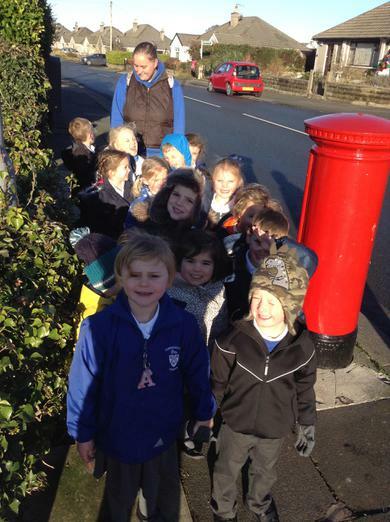 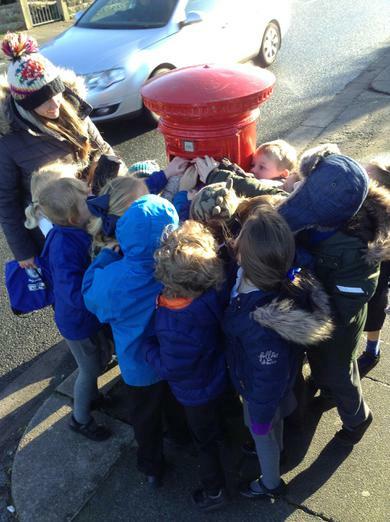 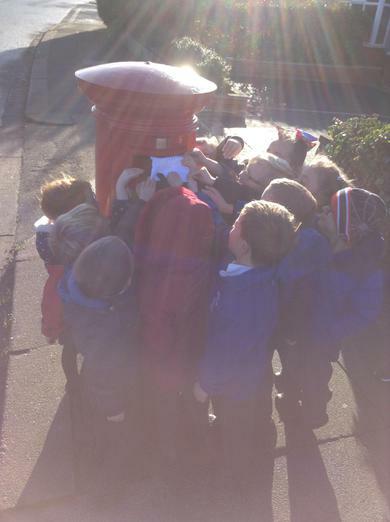 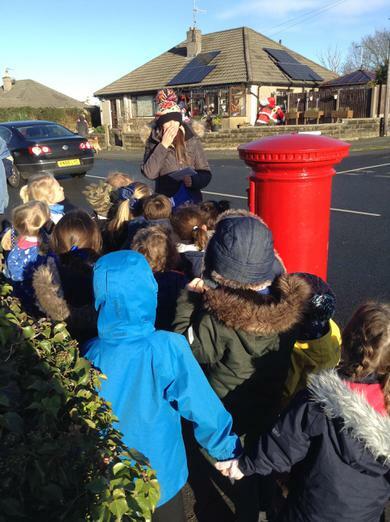 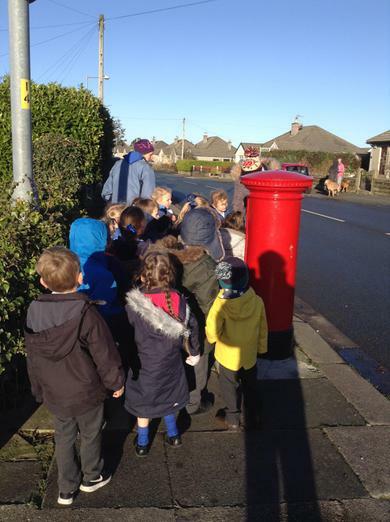 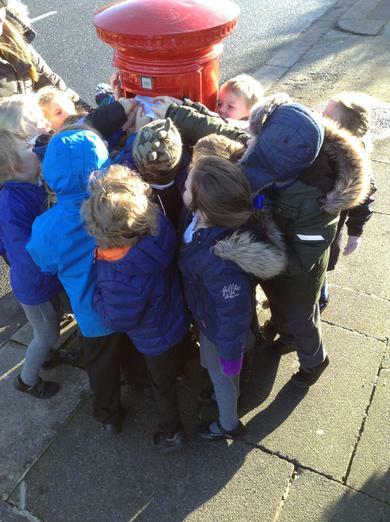 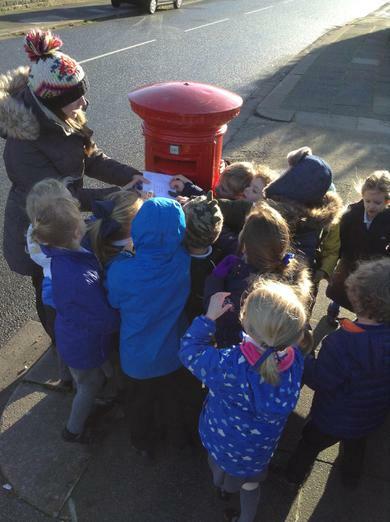 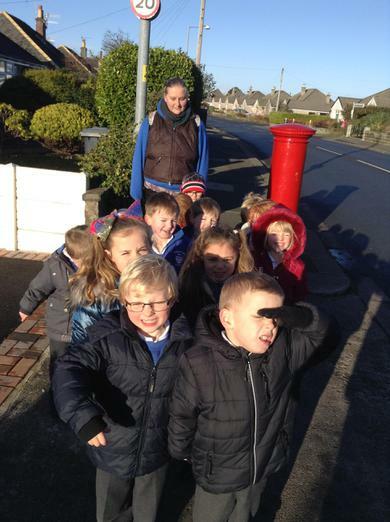 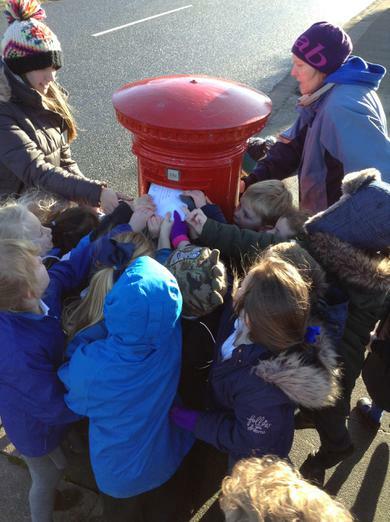 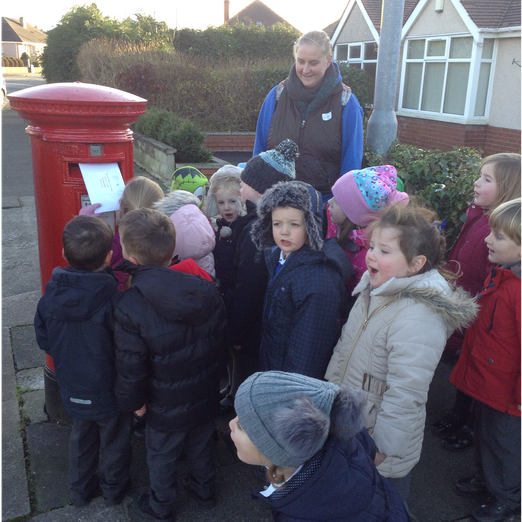 We were so excited to walk to the post box on Low Lane and deliver our letters to Santa! 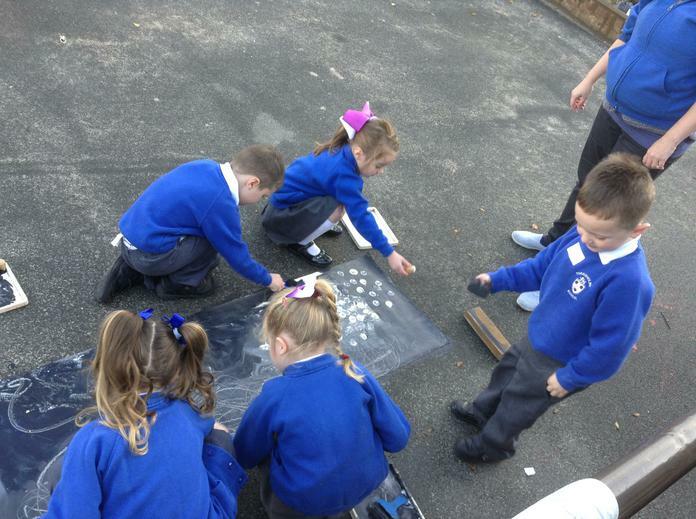 The children enjoyed an Autumn walk outside collecting lots of leaves and having fun with them. 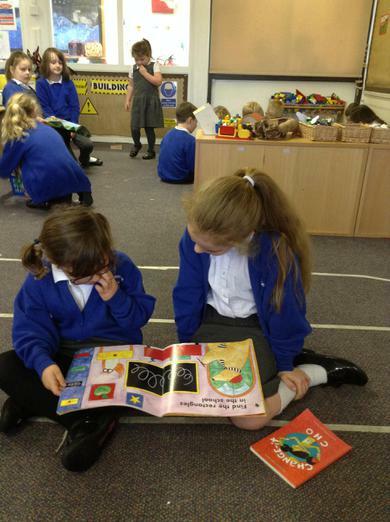 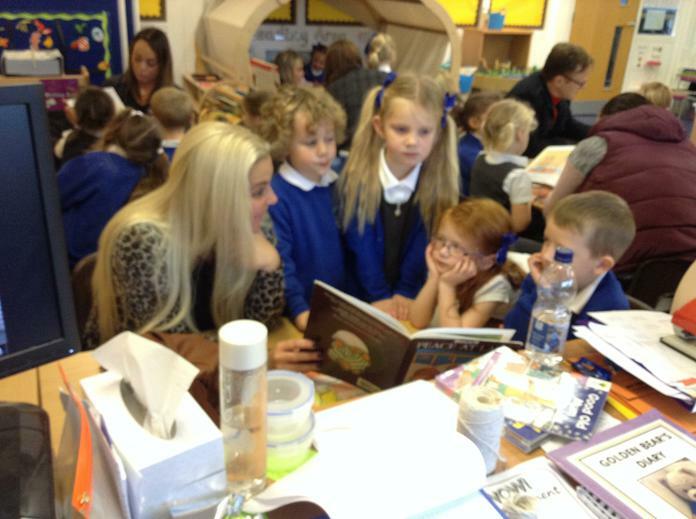 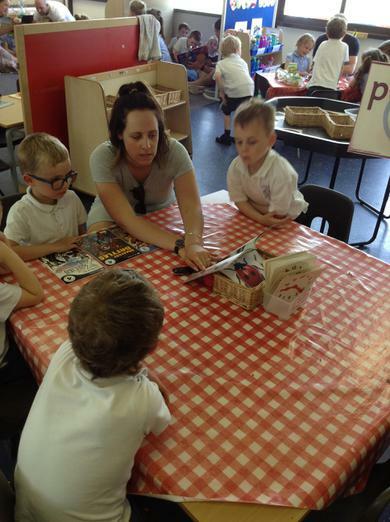 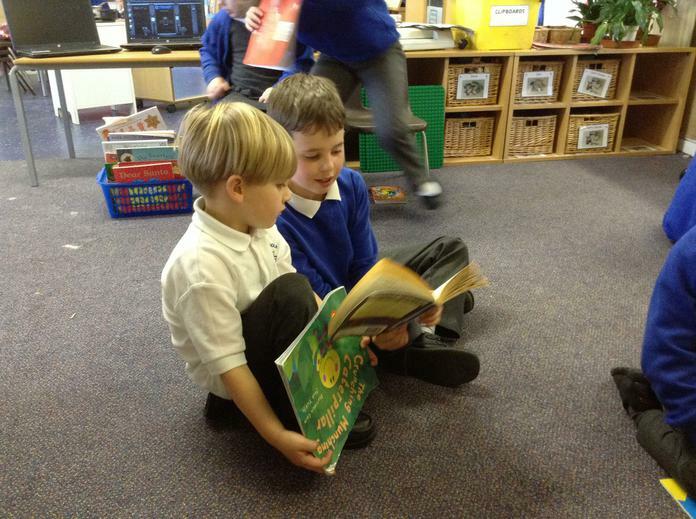 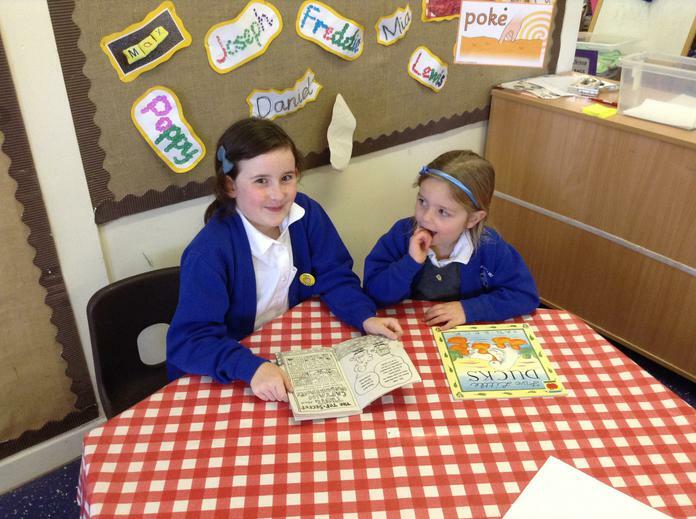 The children enjoyed the whole school book swap and were very pleased with their new books! 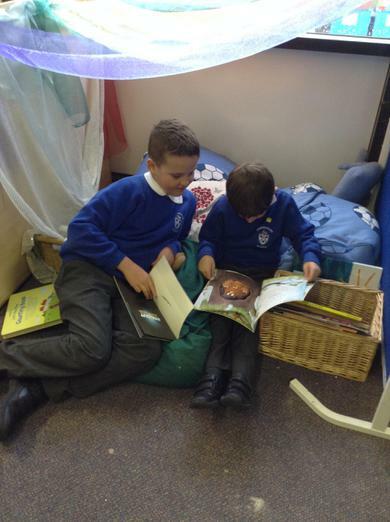 Today the children have enjoyed sharing a story with the children in Year 5. 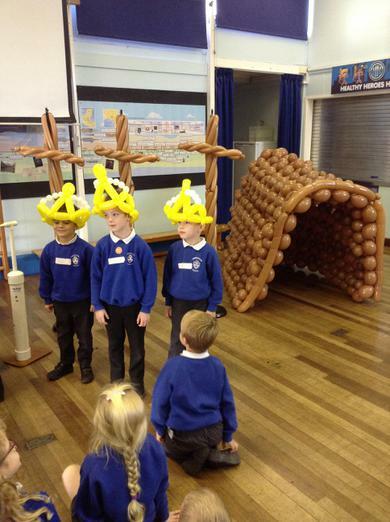 We had a whole school Christianity day. 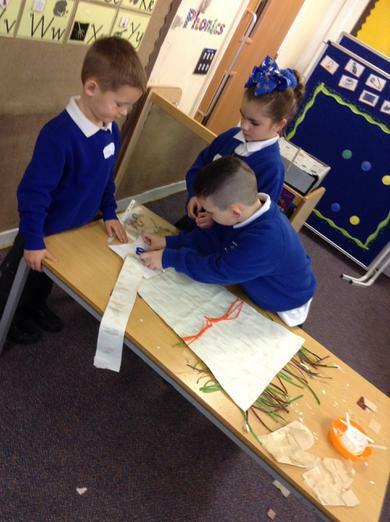 We learnt about some of the things Christians believe including Jesus and some of his miracles. 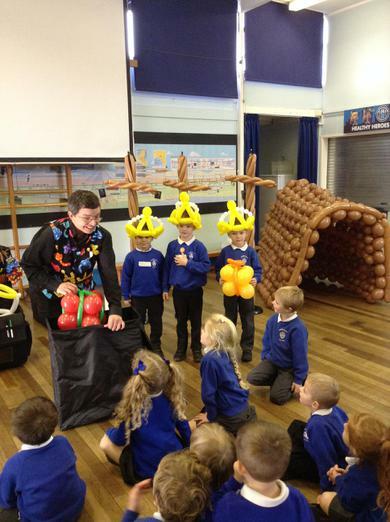 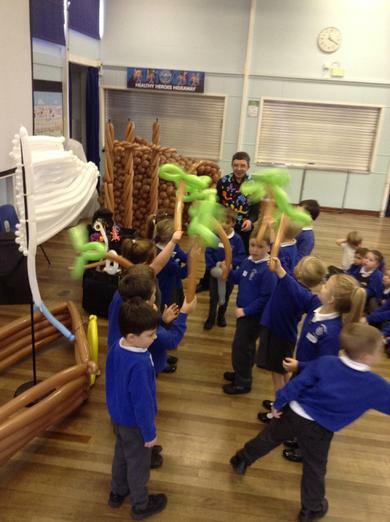 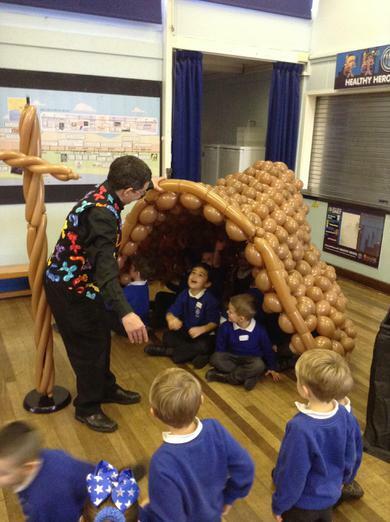 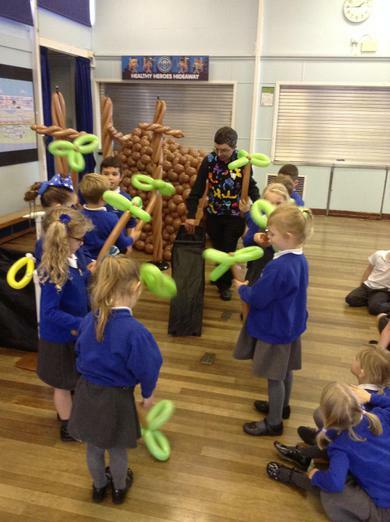 We loved watching our visitor 'Small Paul Balloons' tell Jesus' timeline. 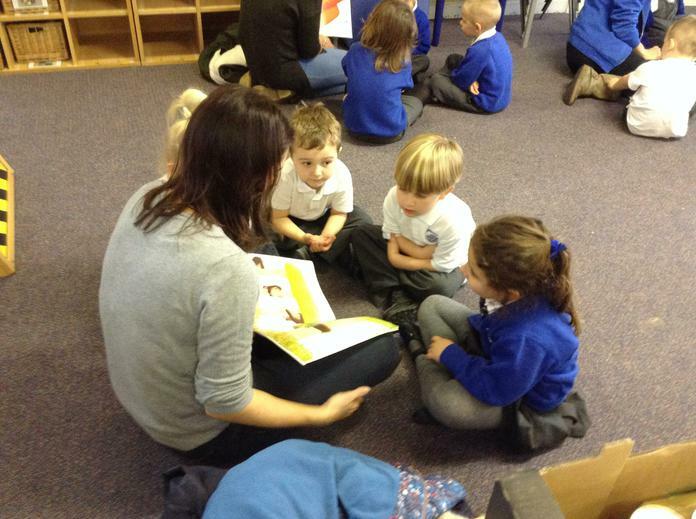 Thank you to all of you who came to read stories with us at our first share a story day! 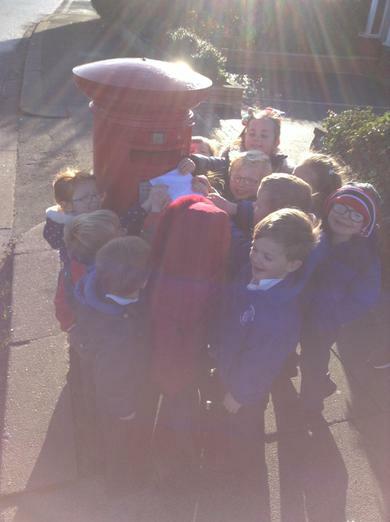 If you didn't make it this time don't worry - check out the next share a story date on your letter. 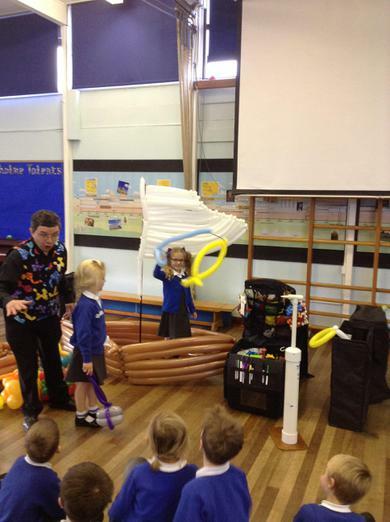 We have loved using the parachute this week! 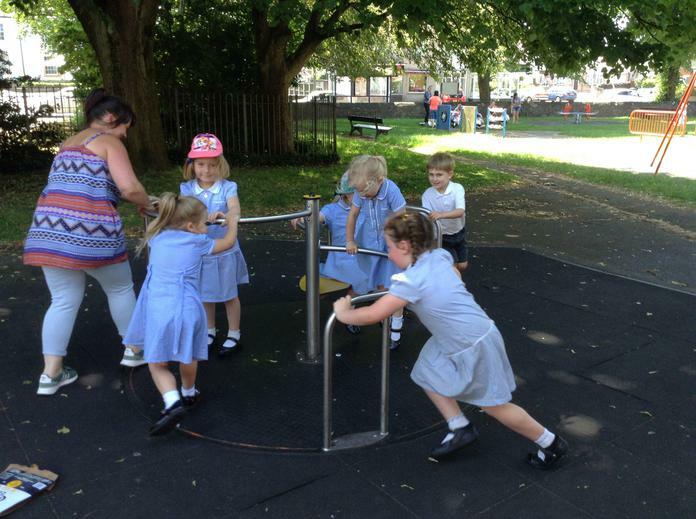 It has been great for strengthening our arm muscles. 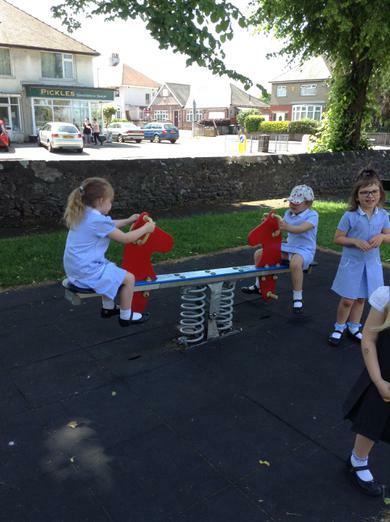 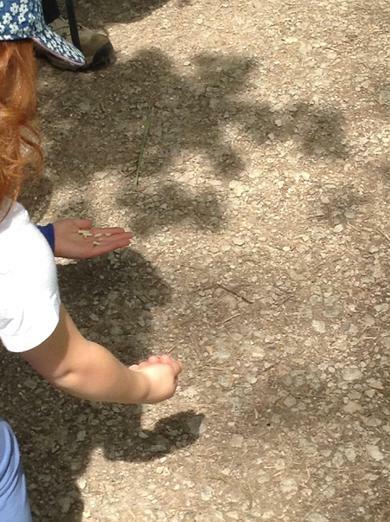 Our balancing track has been a big hit this week! 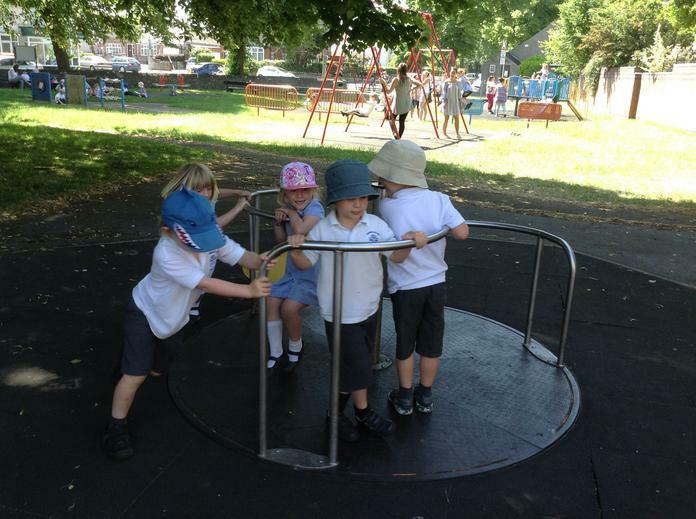 A great resource for team work and balancing skills! 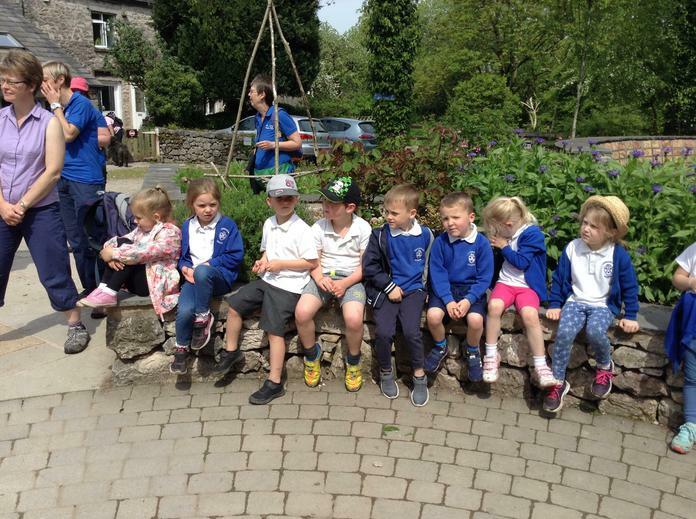 We made the most of the bad weather by putting our overalls on and jumping in the muddy puddles! 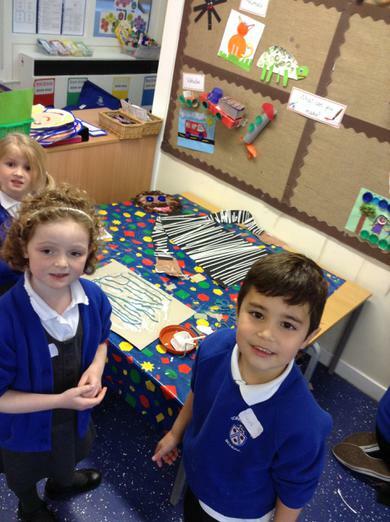 We have been learning to make farms, zoos and dolls houses in our construction and small world area. 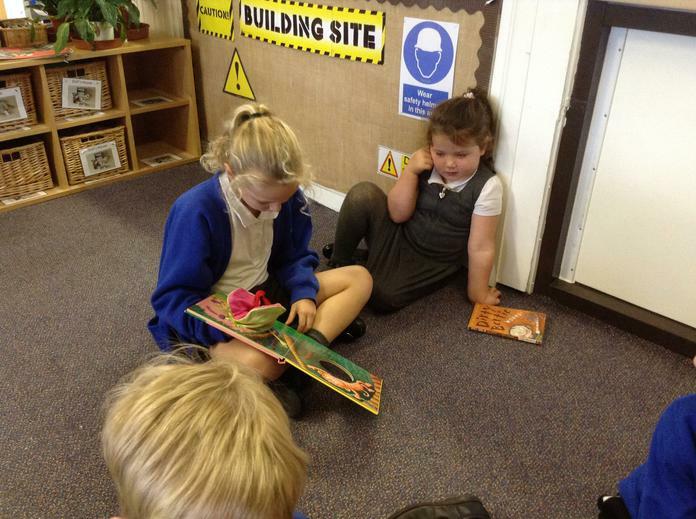 We can then use them to create and act out stories! 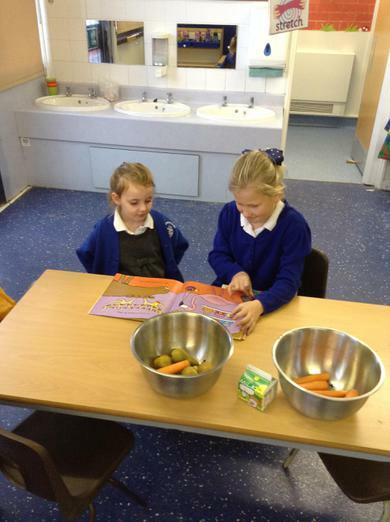 We have been learning how to use our afternoon snack area! 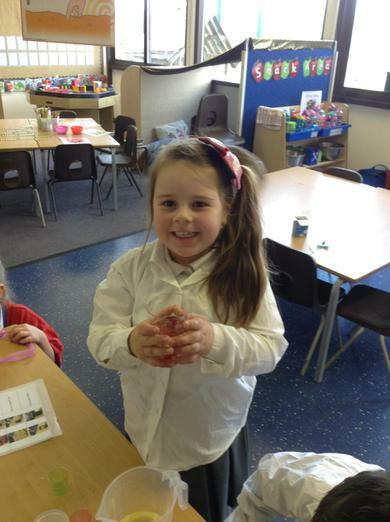 We are learning to wash our hands before we eat, make our snack and even wash and dry our own pots! 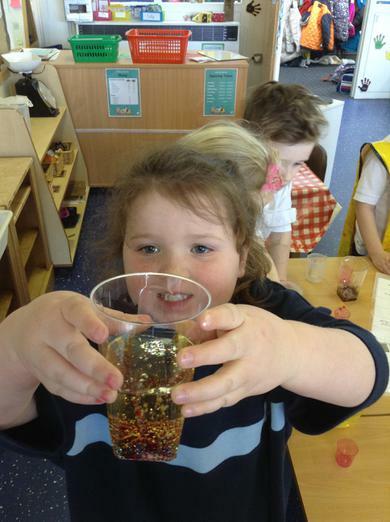 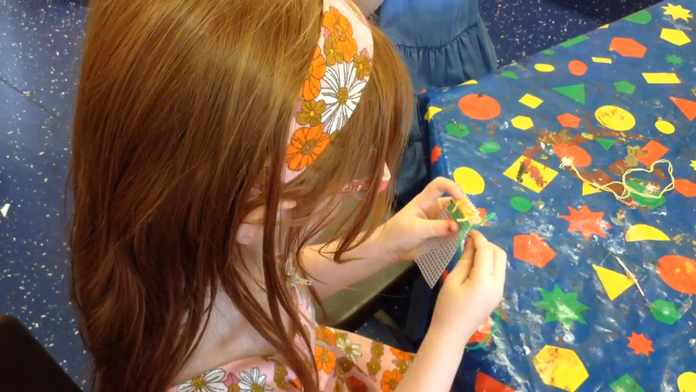 Check out some of the fine motor activities we have been doing to strengthen our fingers! 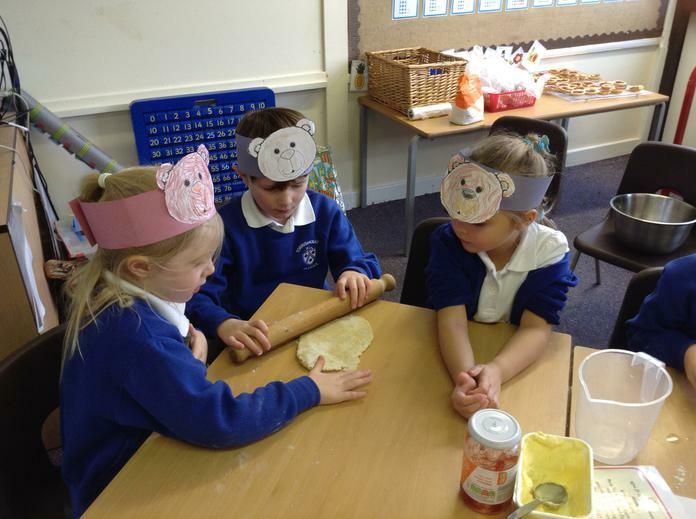 Could you adapt some of these to do at home? 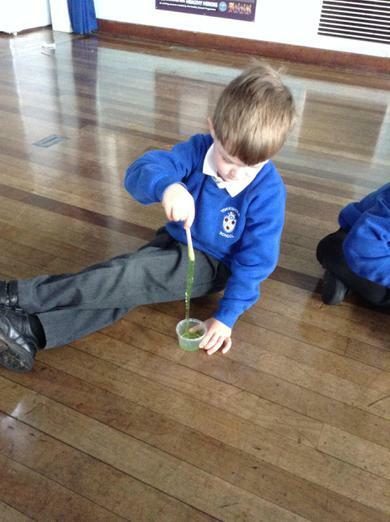 We have been developing our gross motor skills in the hall! 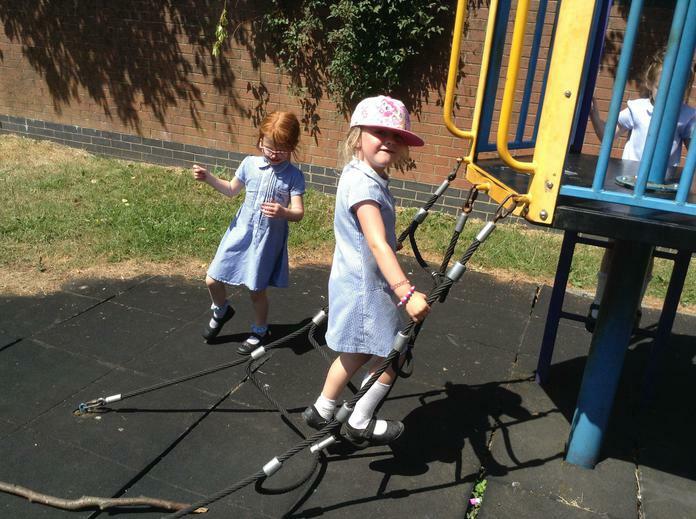 We love PE on Fridays! 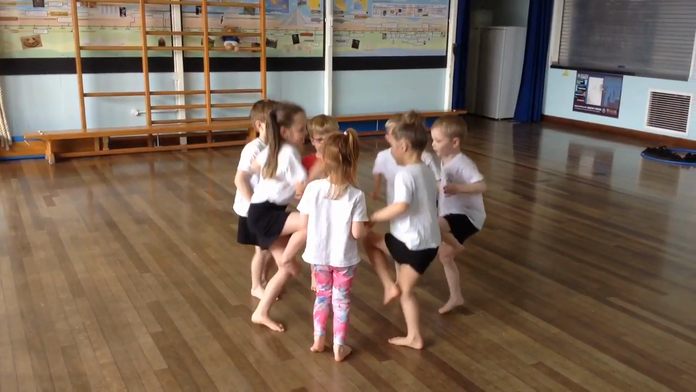 We have been experimenting with different movements. 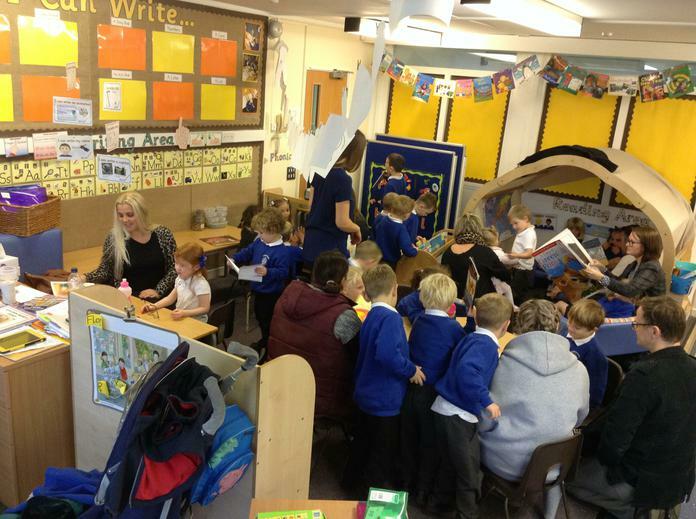 The children have really enjoyed going into the ICT suite! 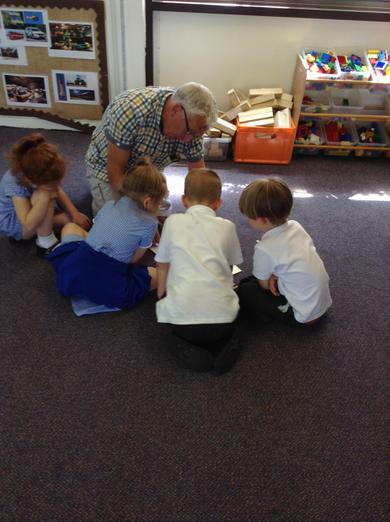 We have been learning how to use the mouse to navigate through different computer games. 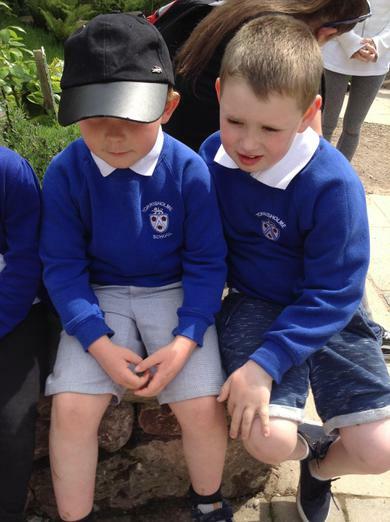 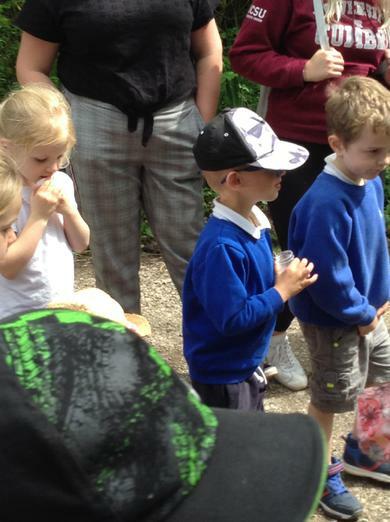 We have loved having the Guinea pigs in our outdoor classroom - especially when they come out for cuddles!